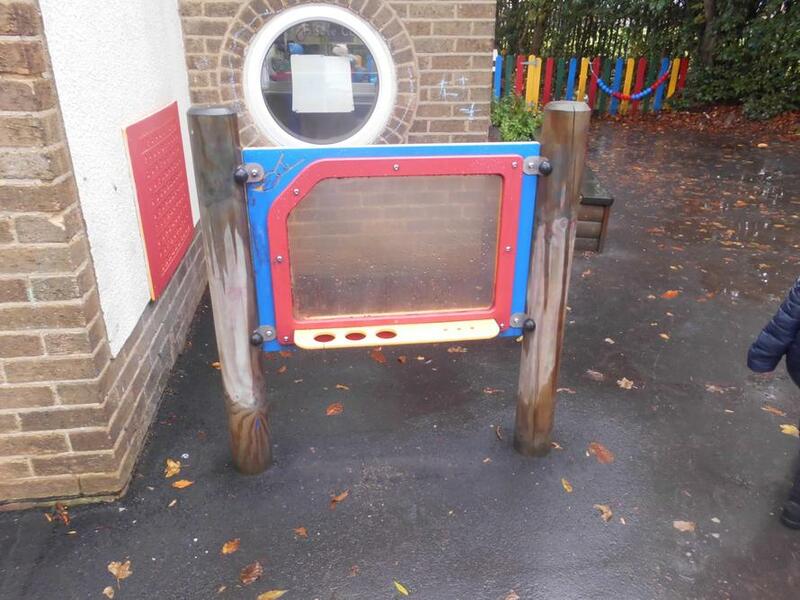 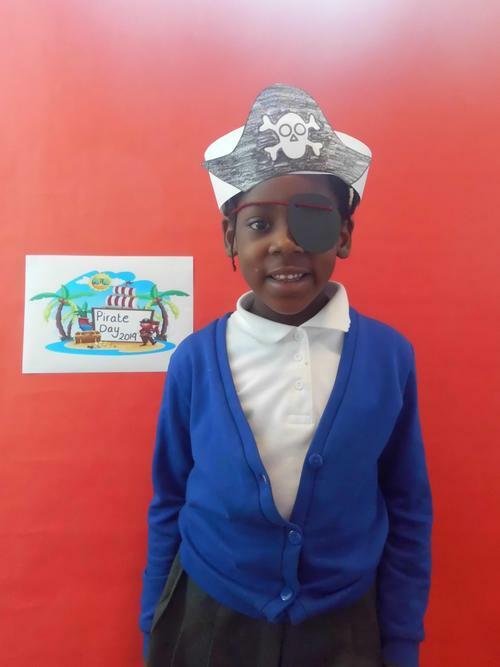 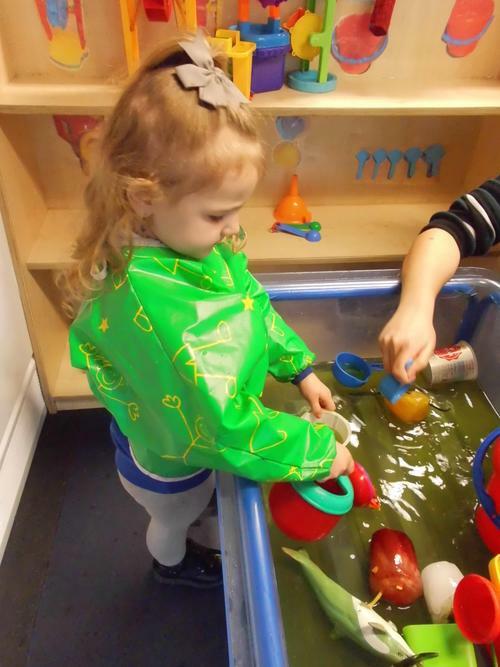 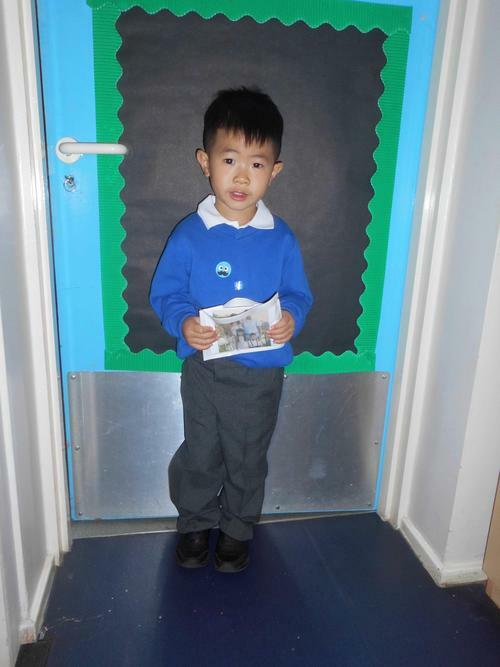 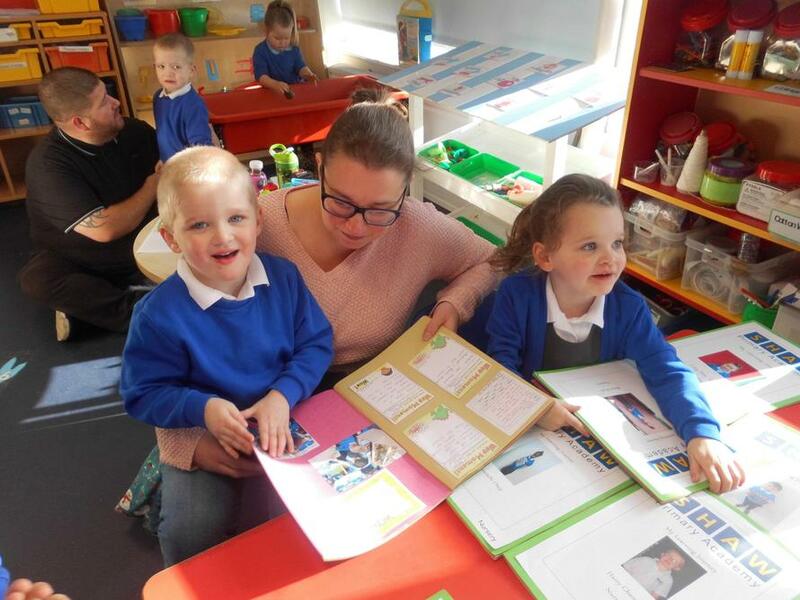 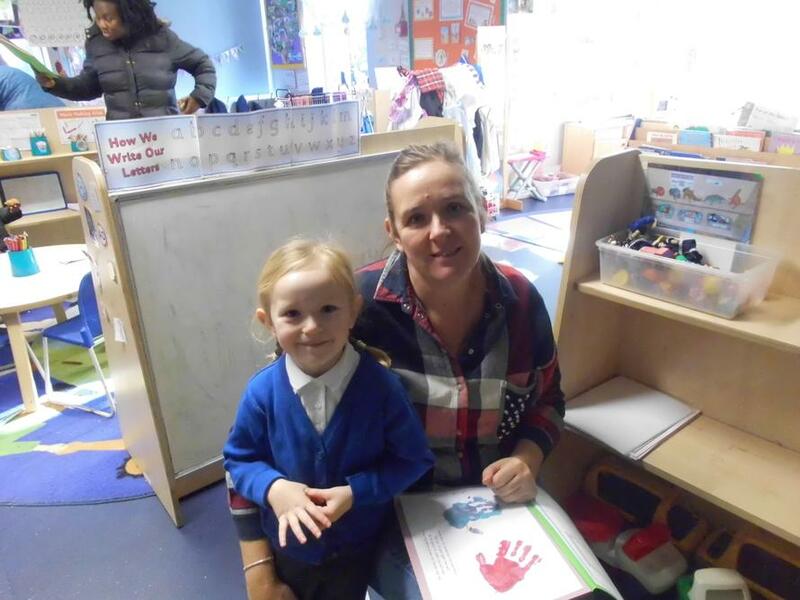 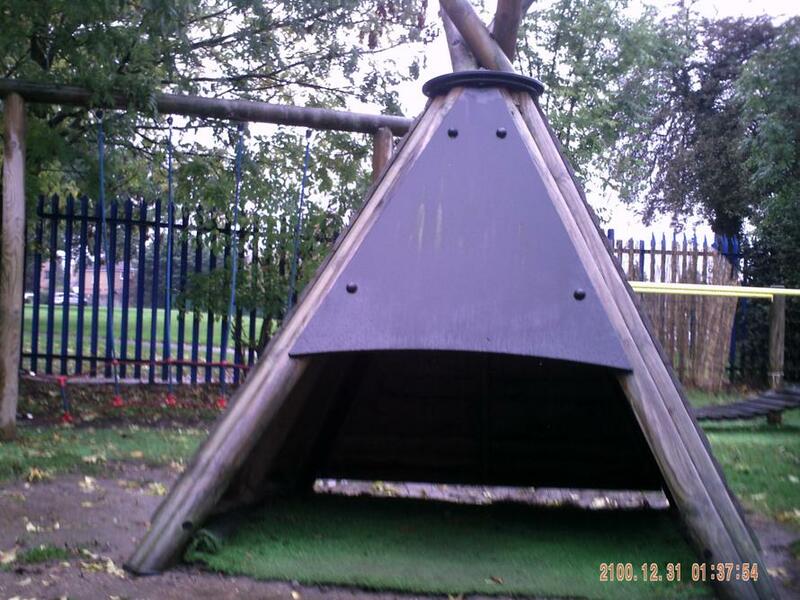 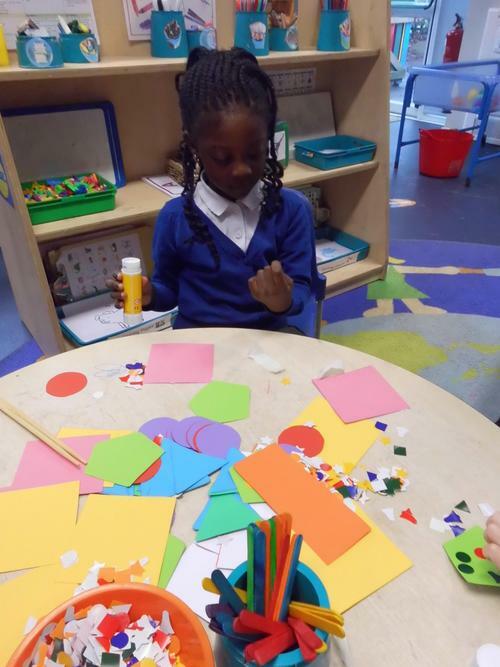 Welcome to Our Nursery Class page! 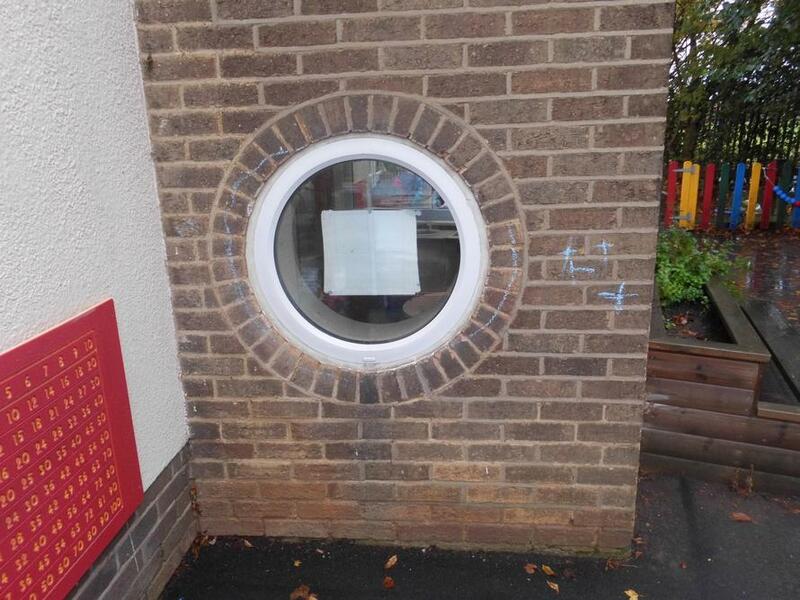 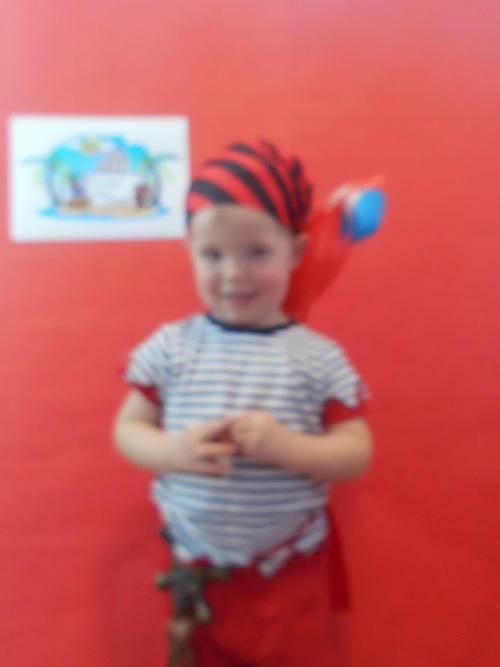 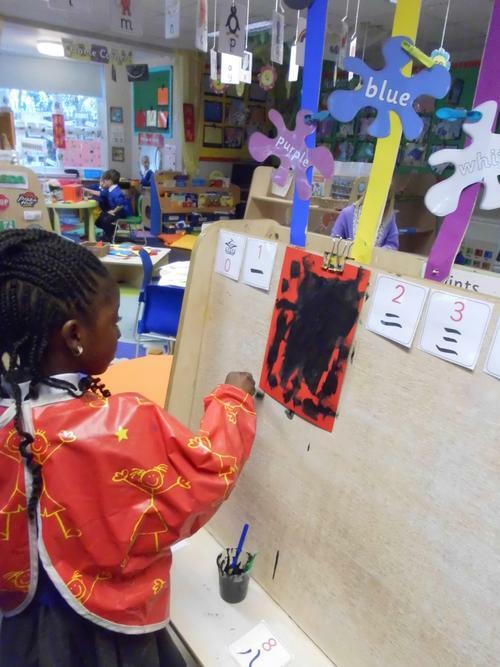 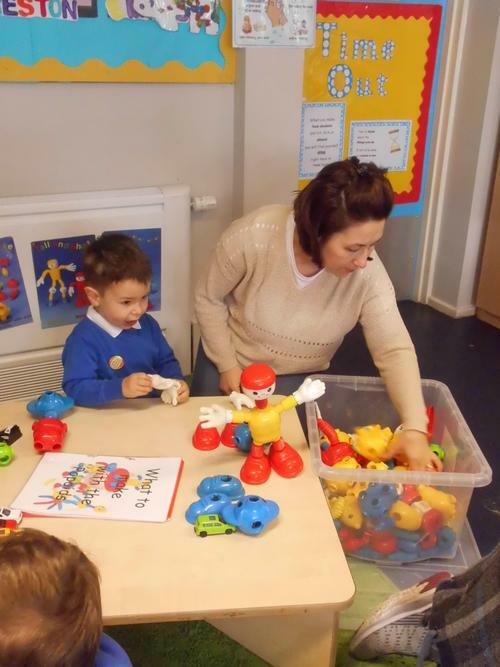 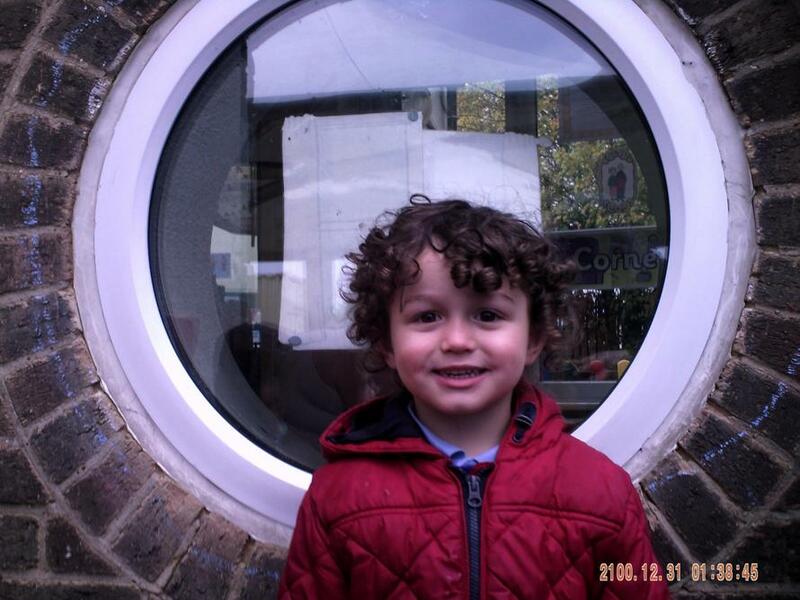 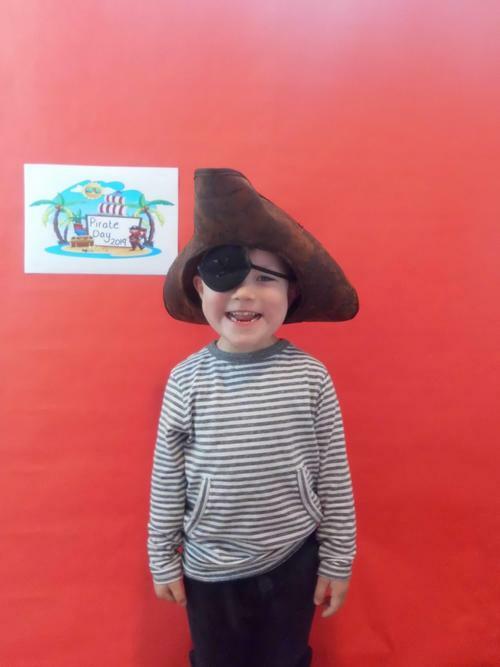 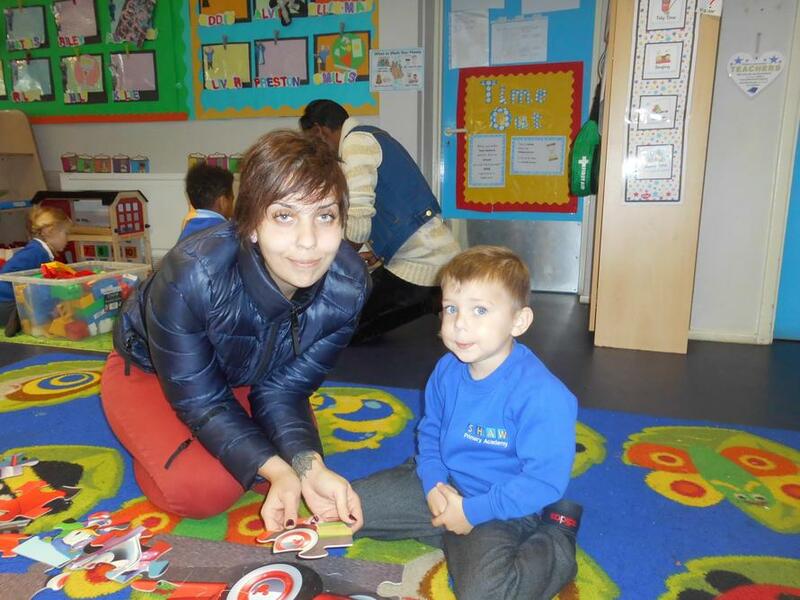 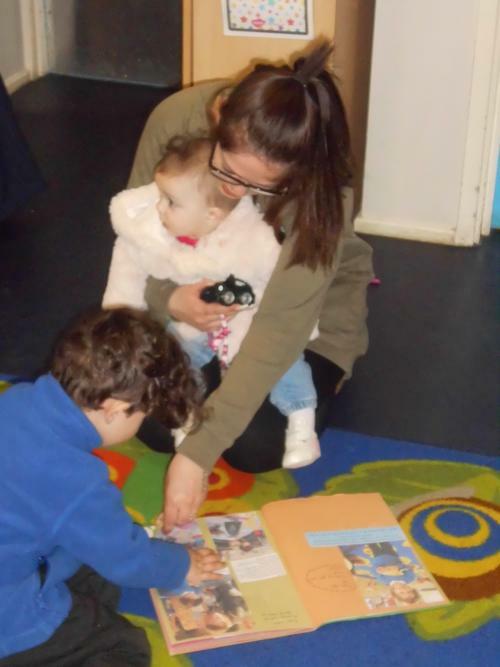 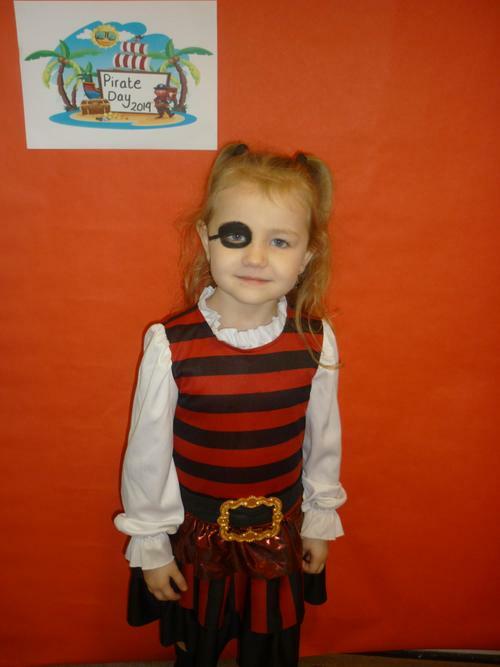 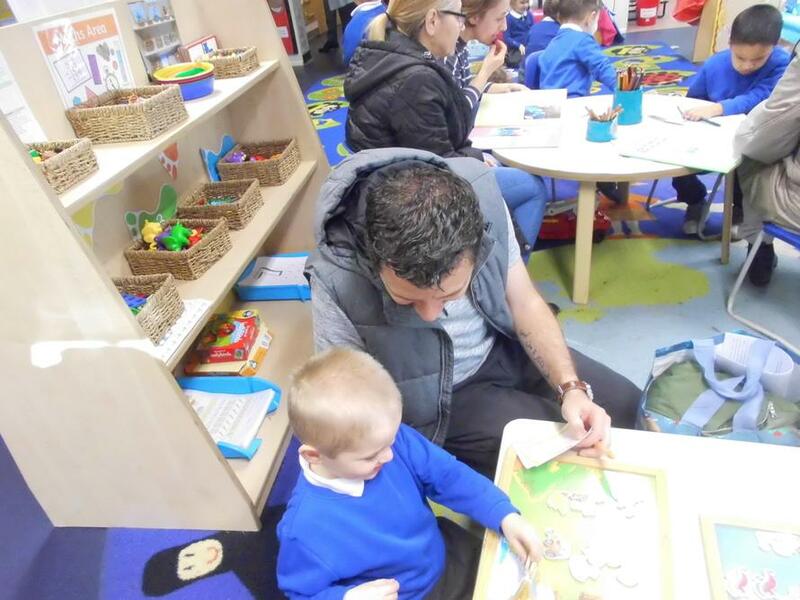 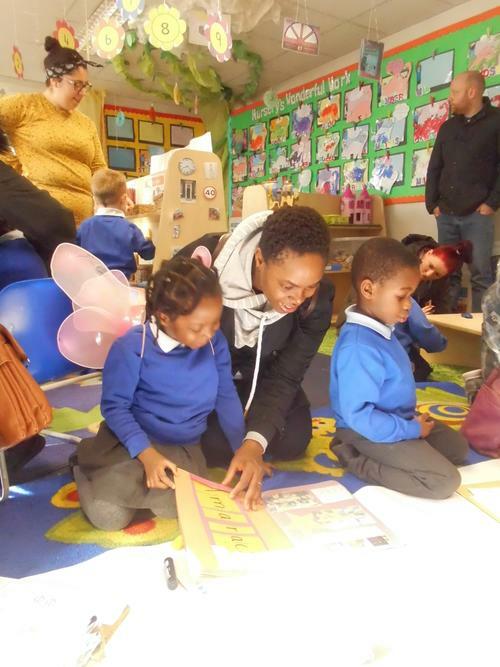 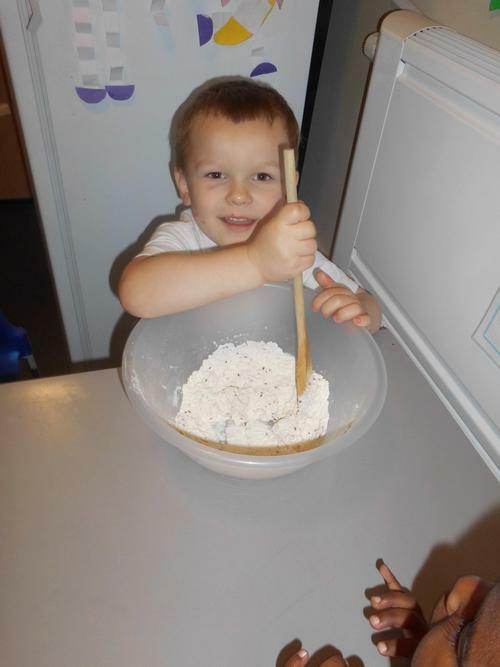 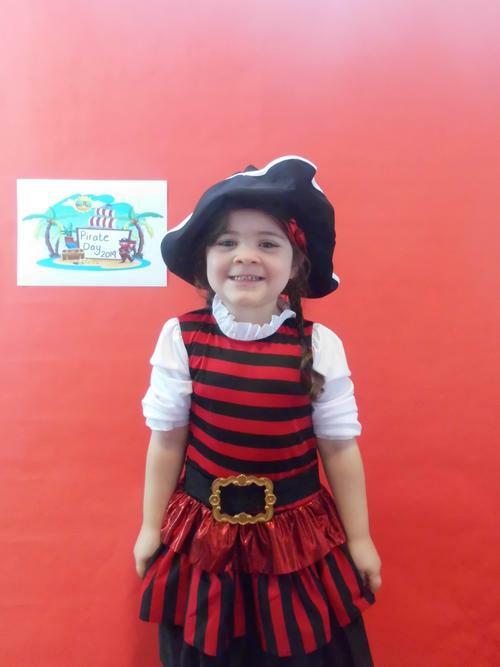 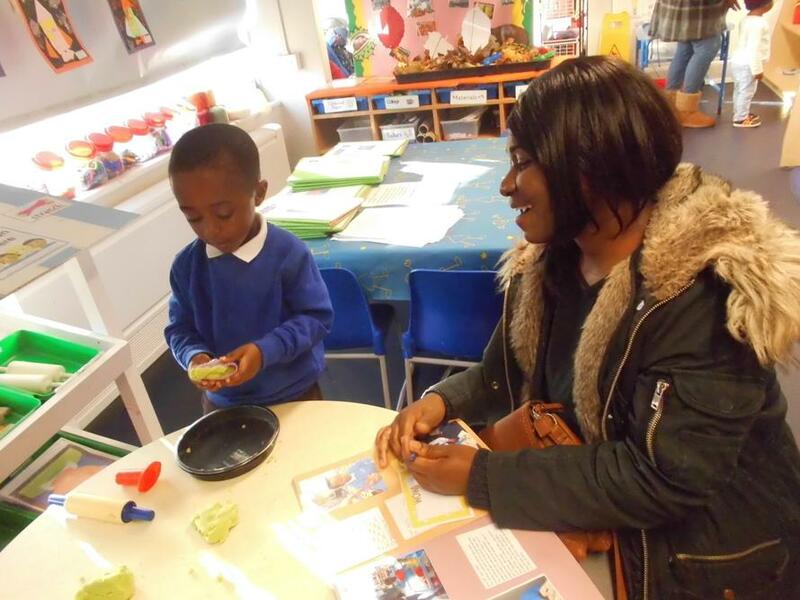 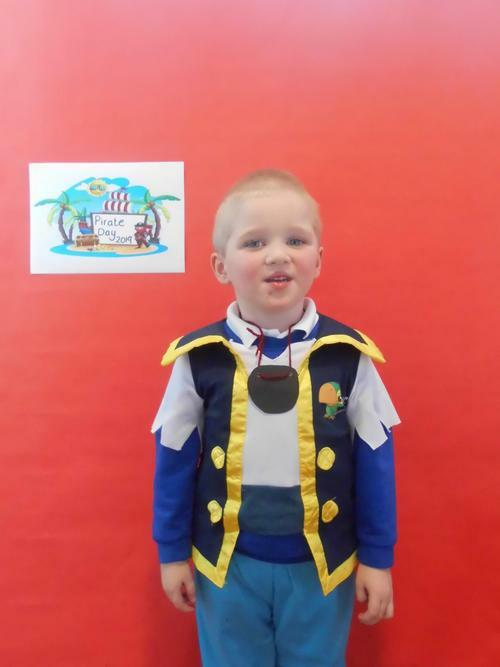 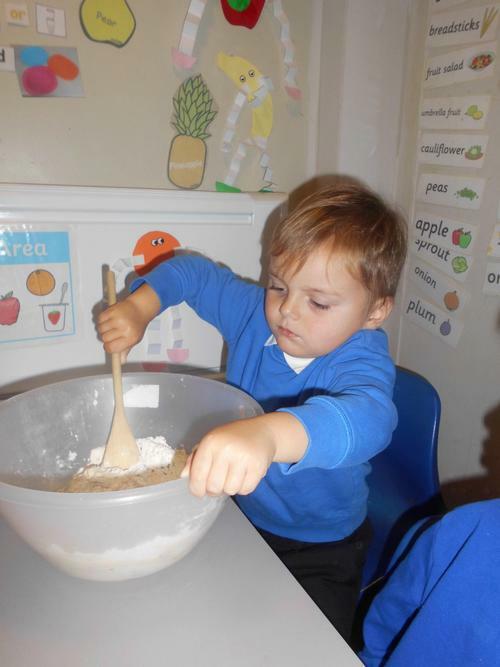 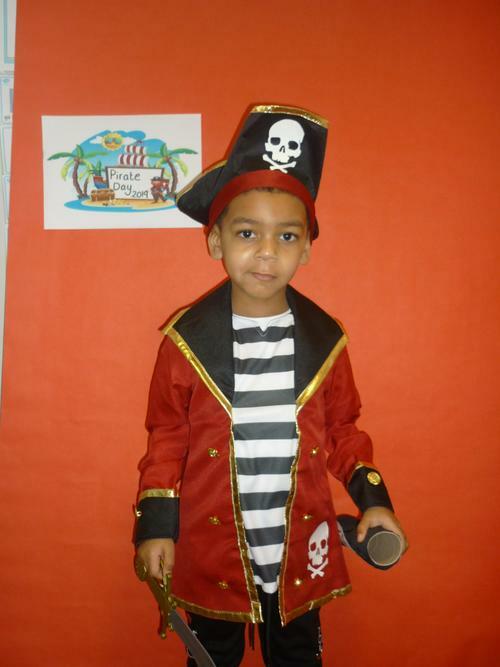 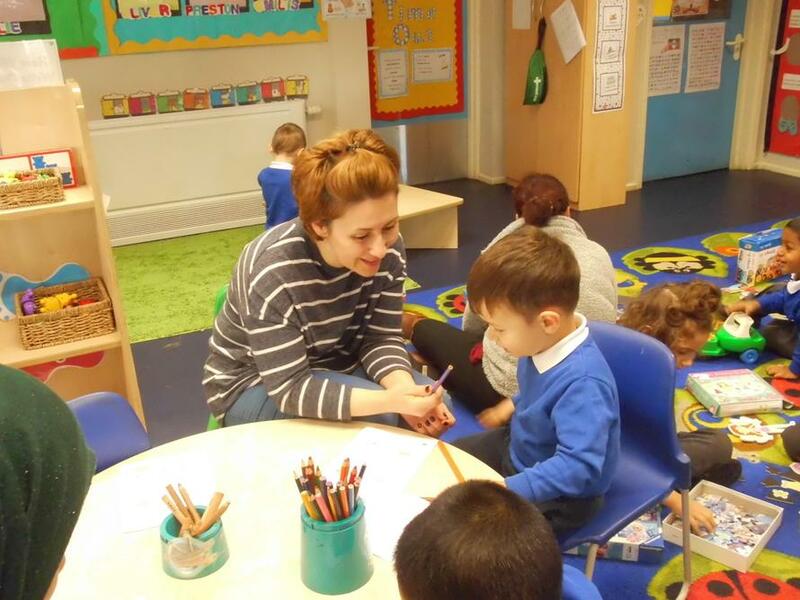 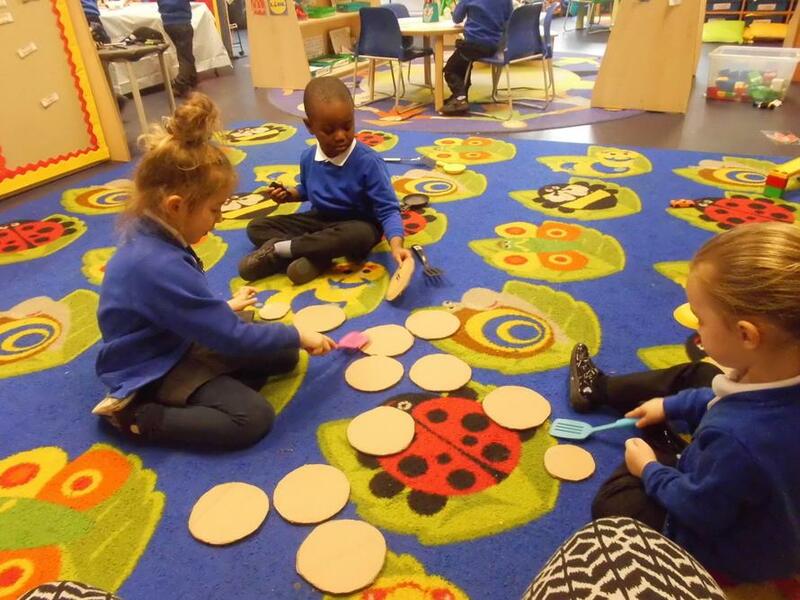 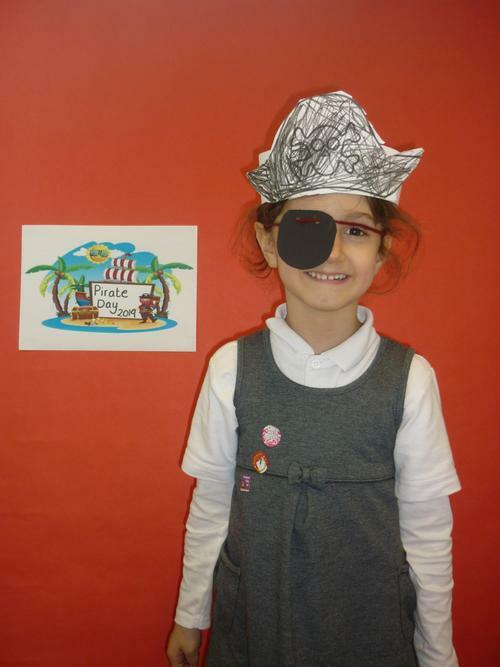 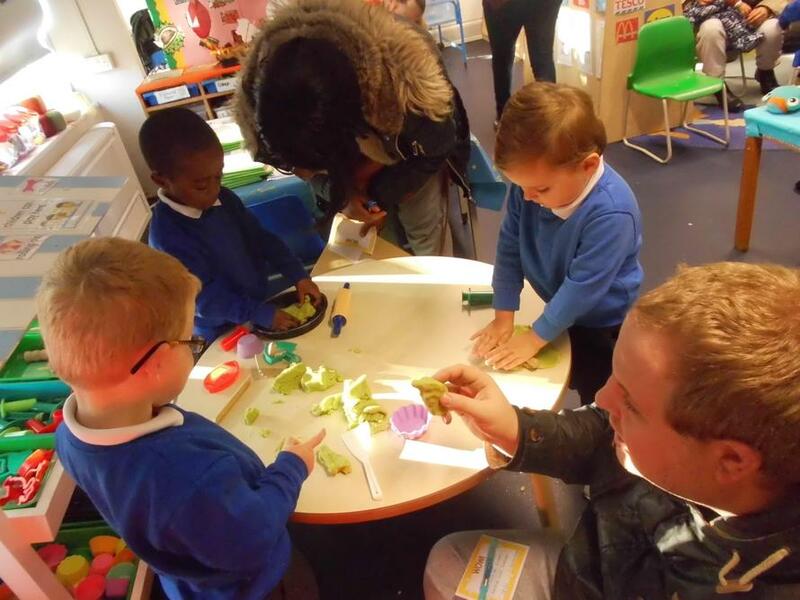 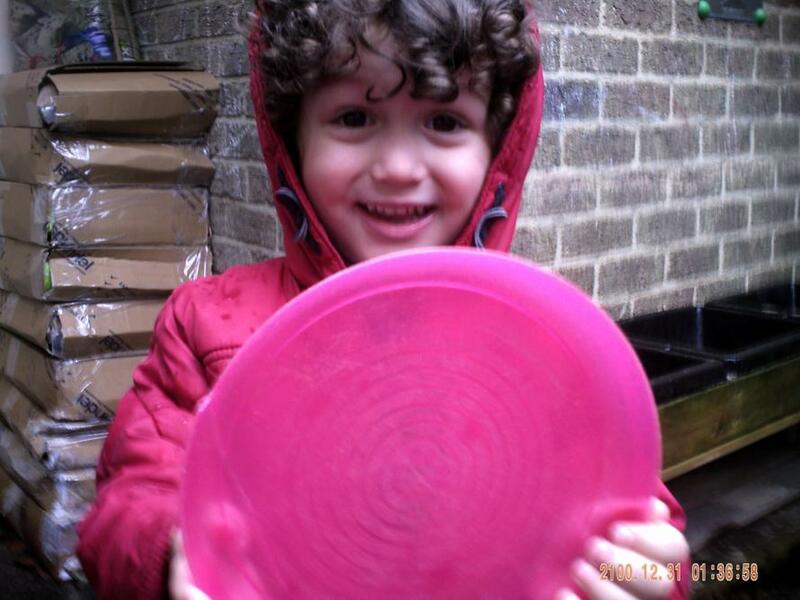 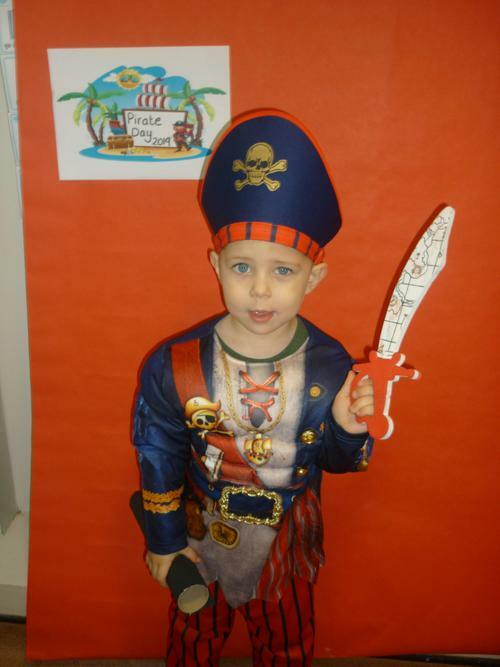 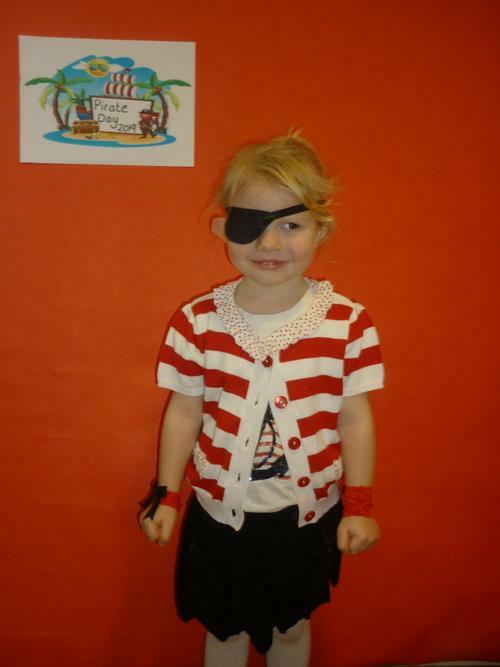 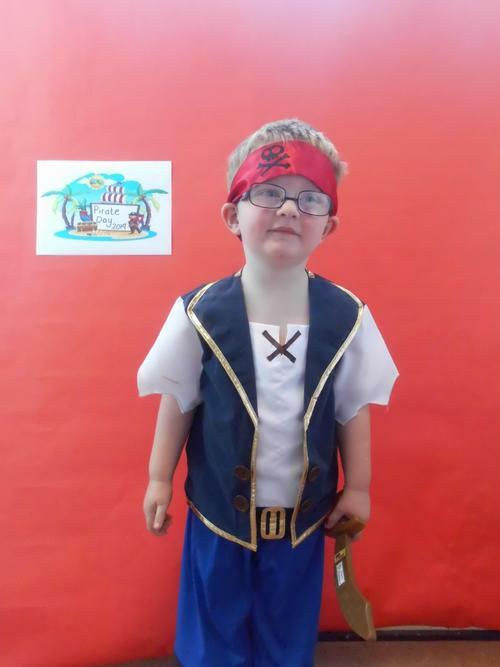 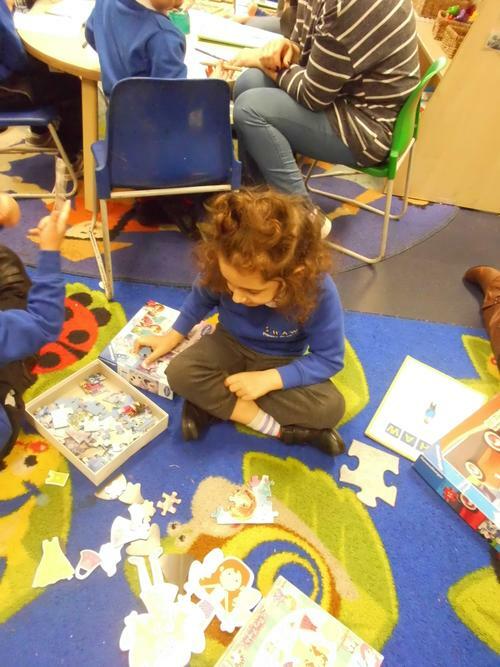 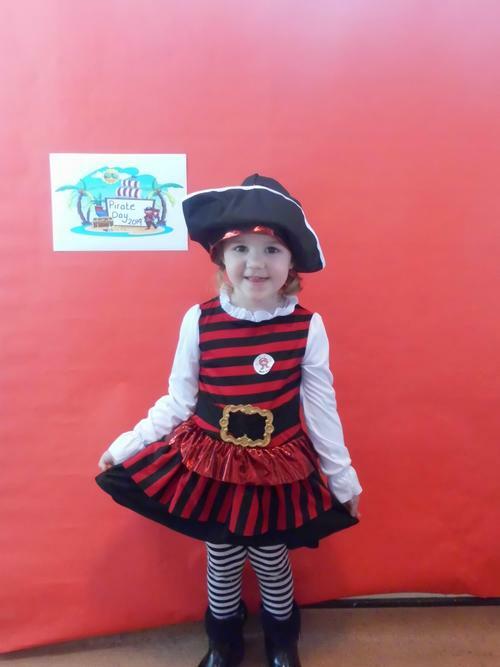 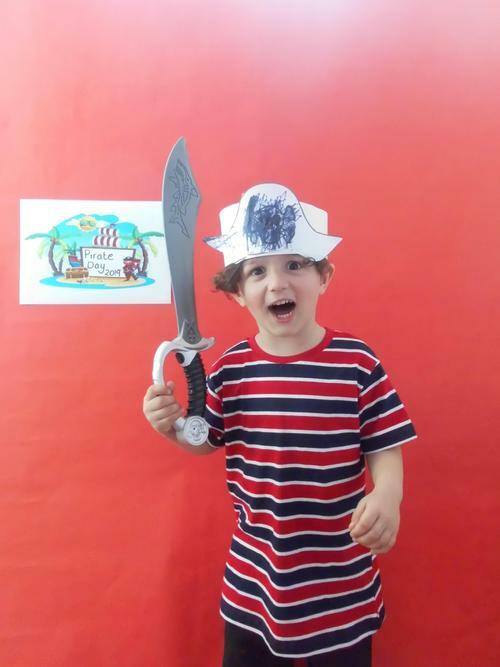 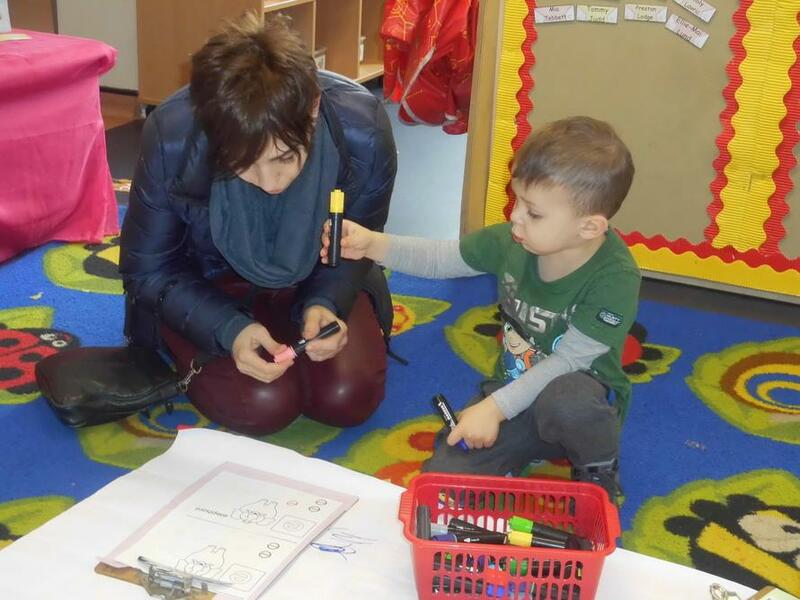 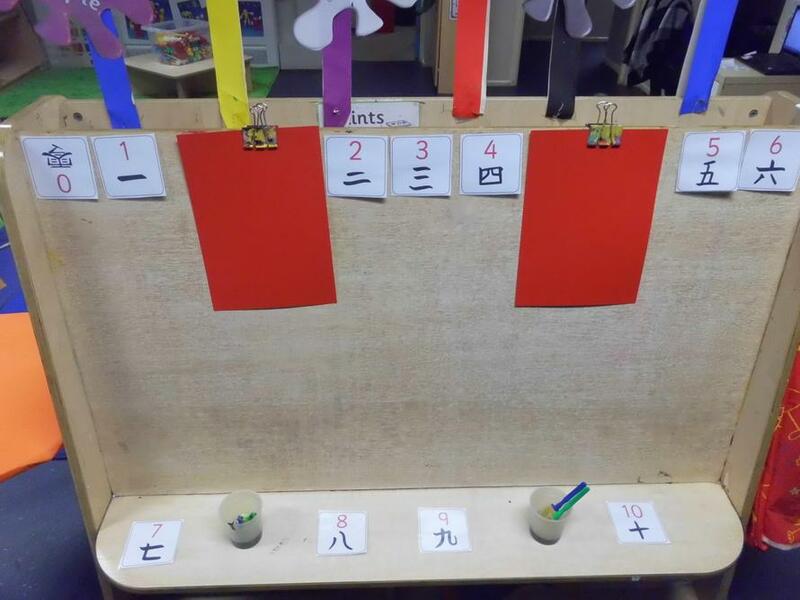 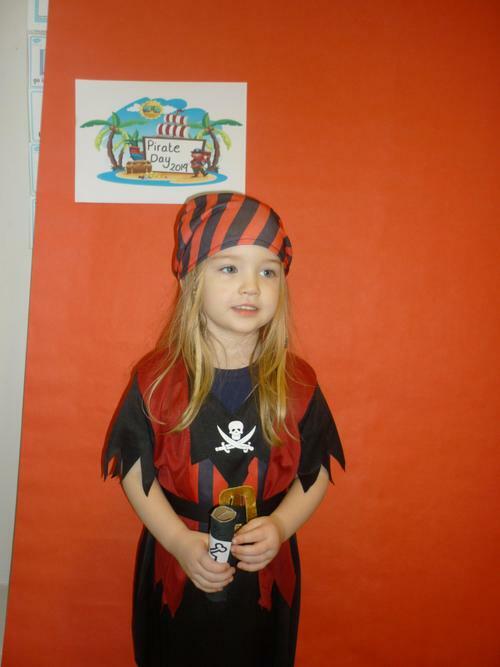 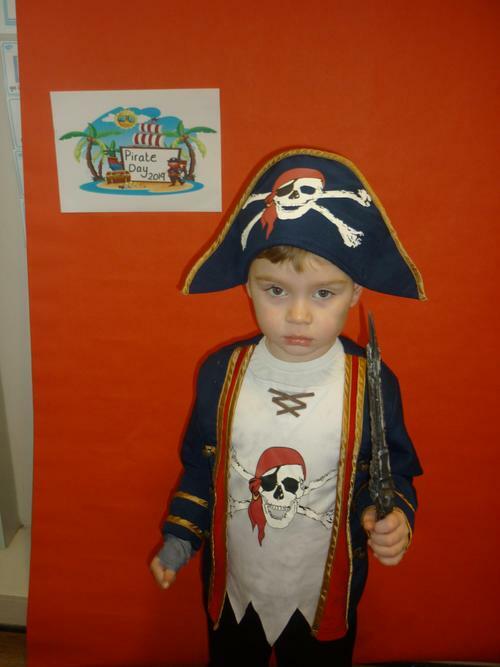 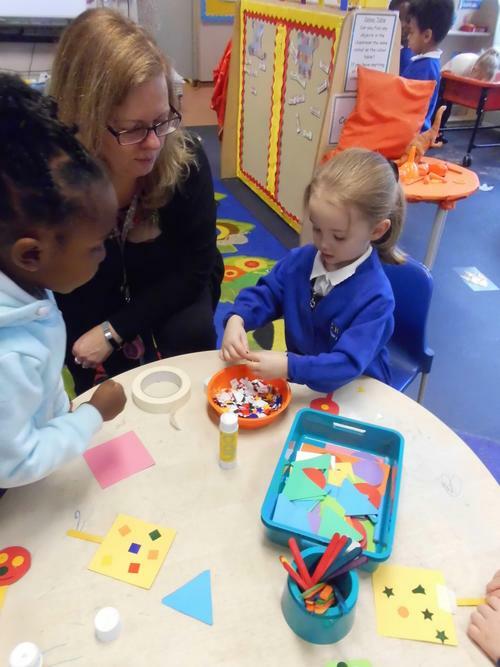 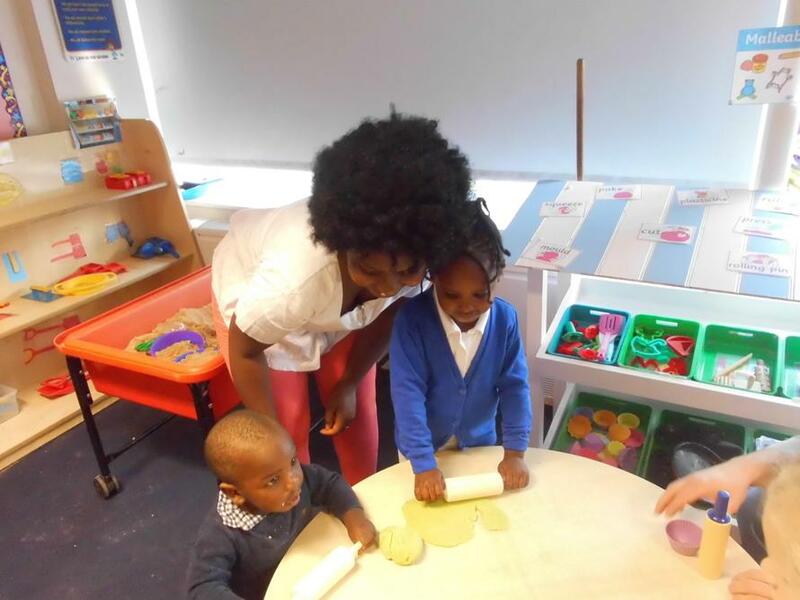 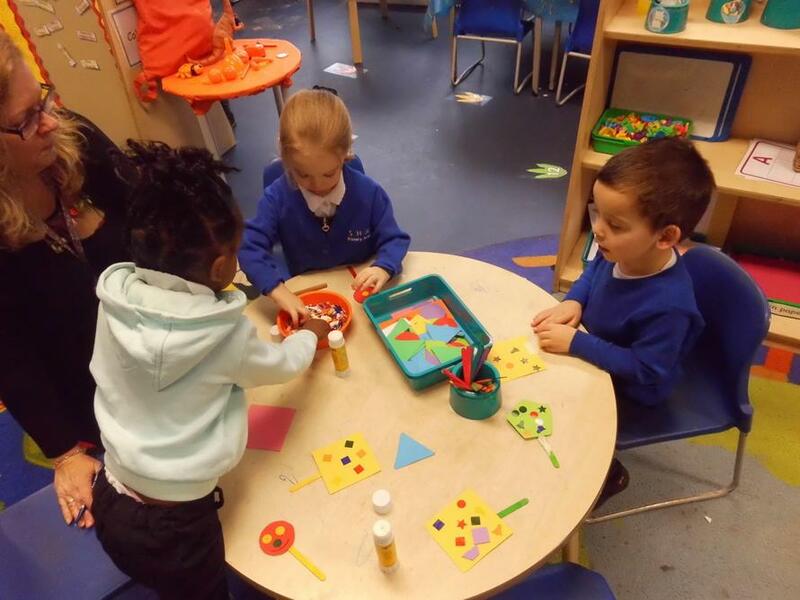 Here we will update you with what we have been up to in Nursery class! 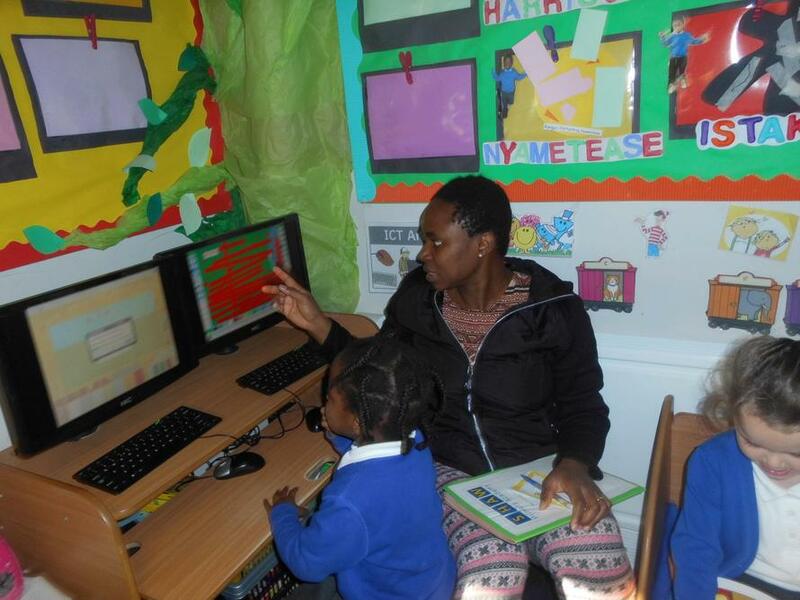 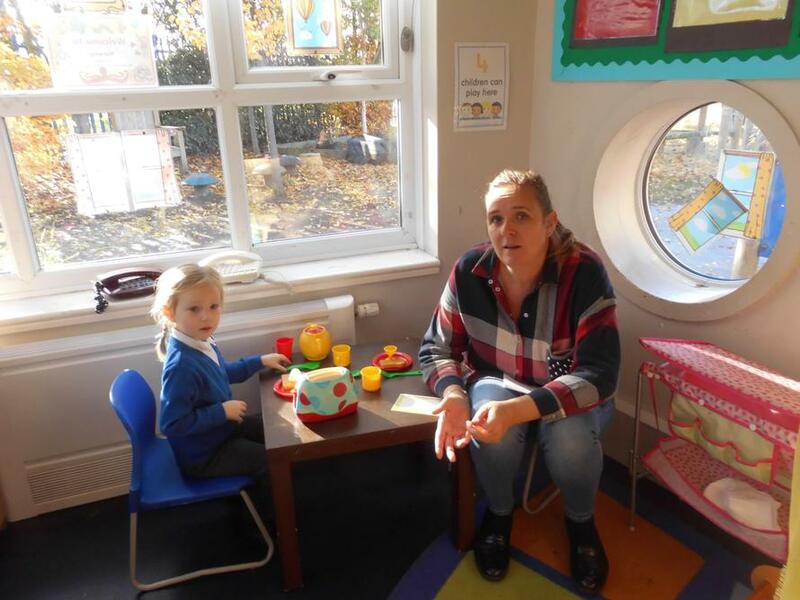 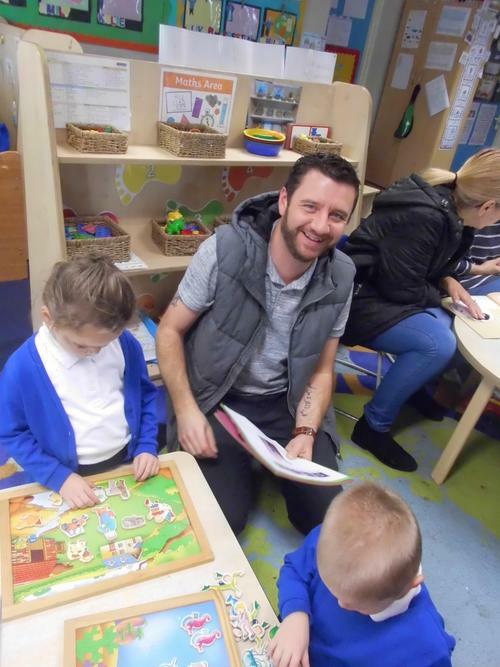 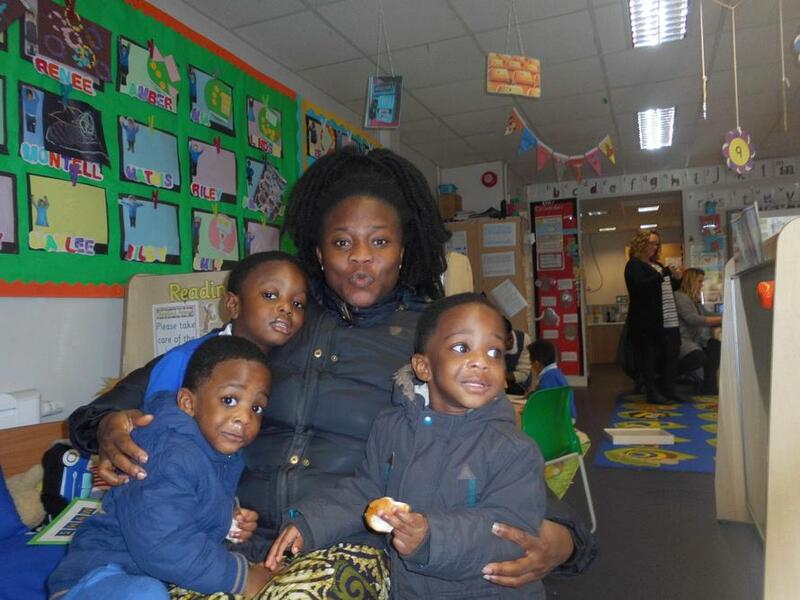 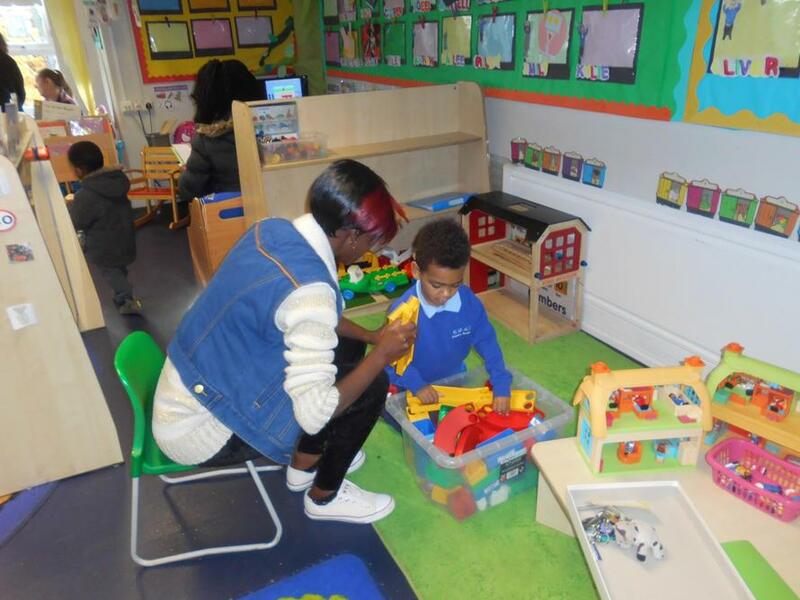 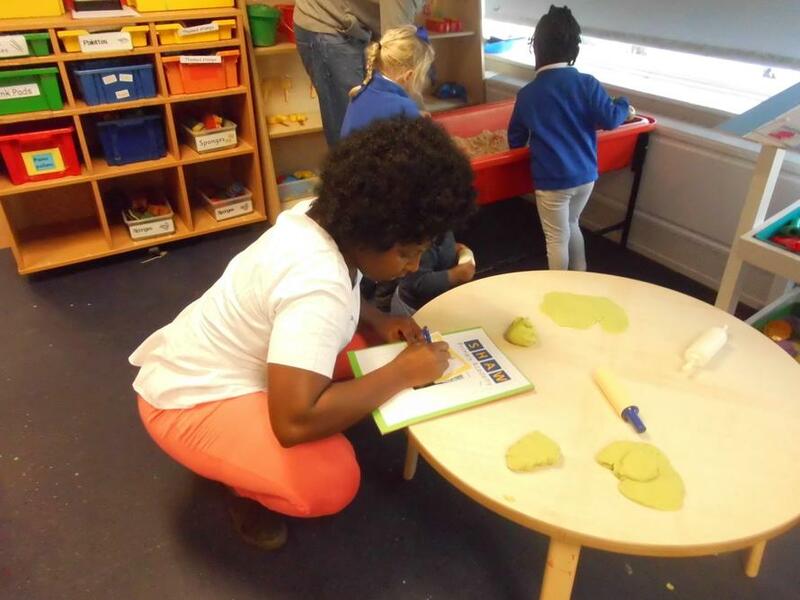 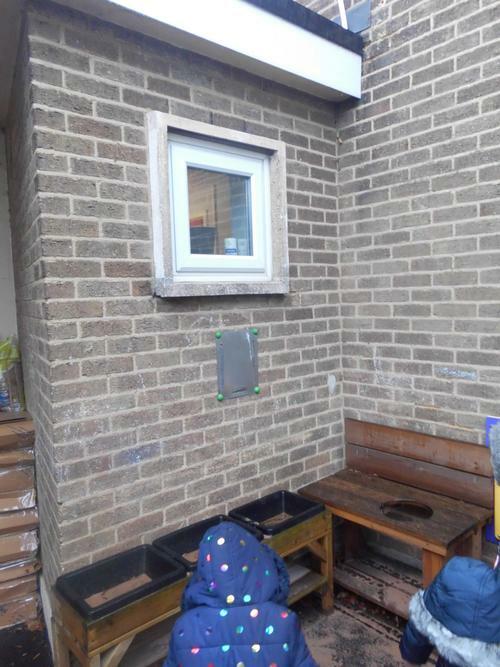 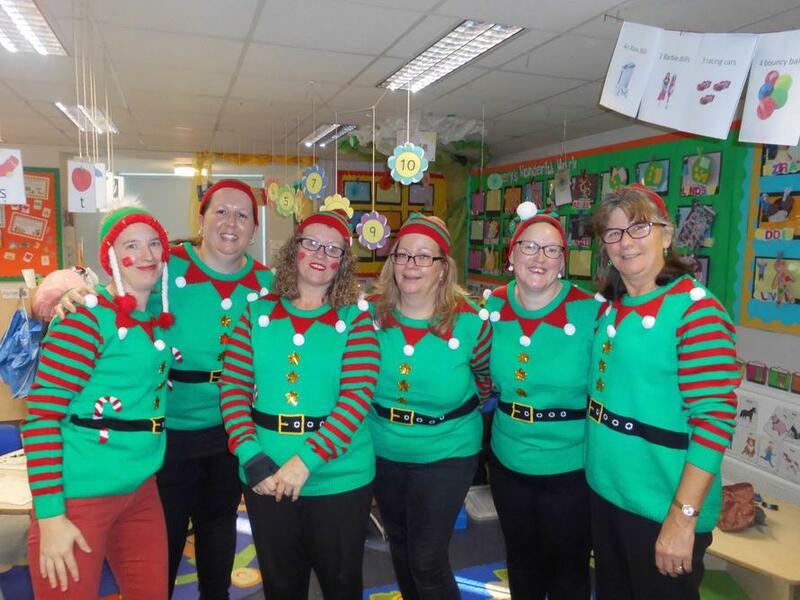 There are 4 members of staff that work in the Nursery across the week. 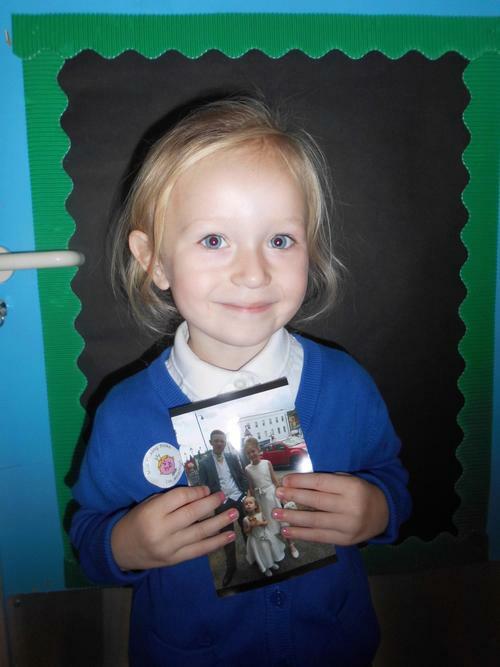 Photos of staff are below to help you to match names to faces! 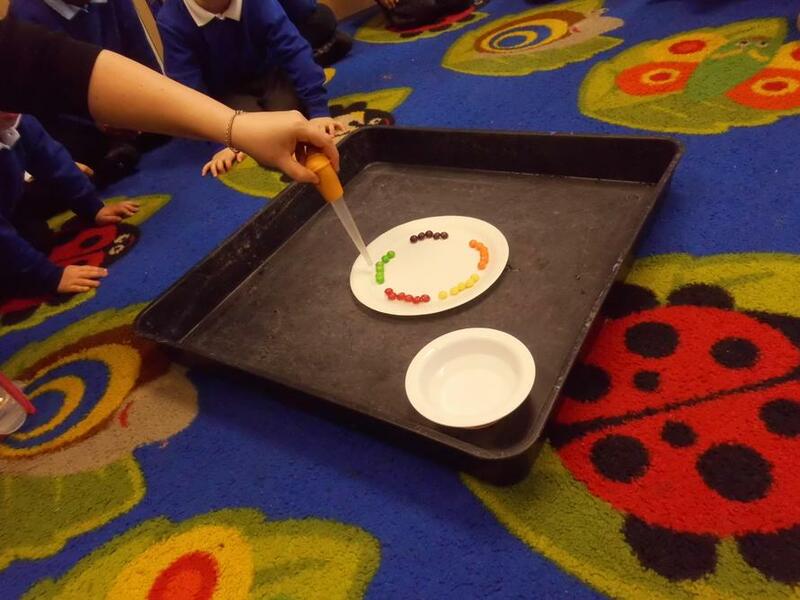 Our colour table helps the children to learn their colours and the colour of it is changed at the beginning of each week on a Monday. 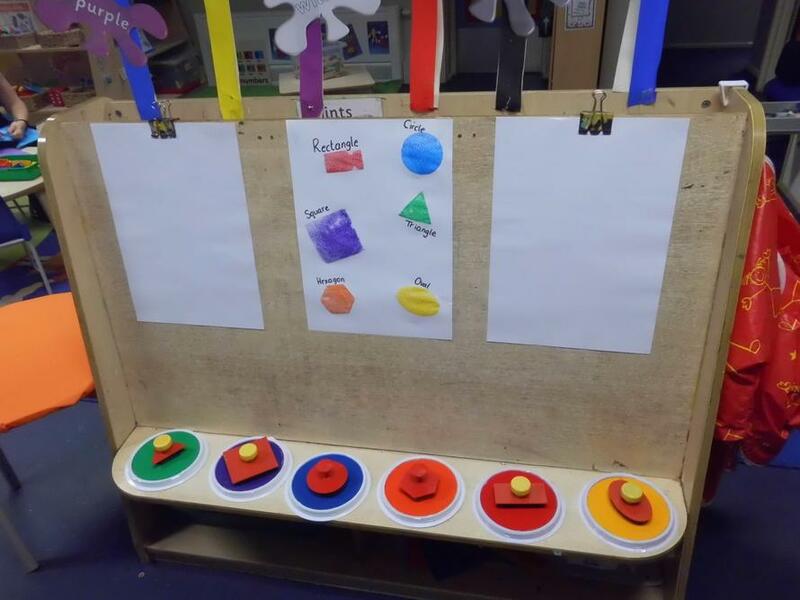 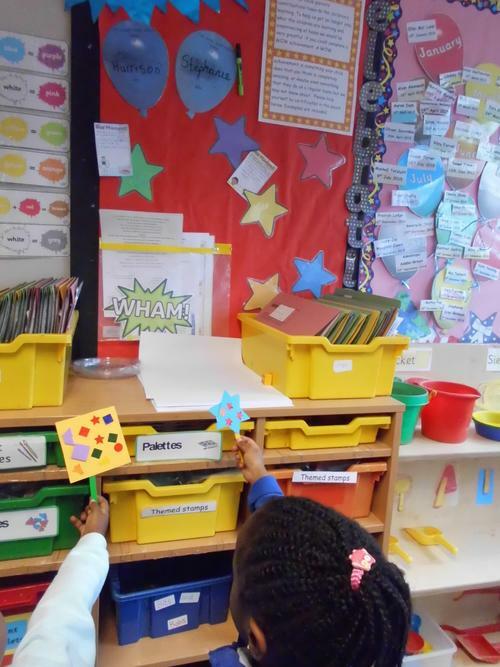 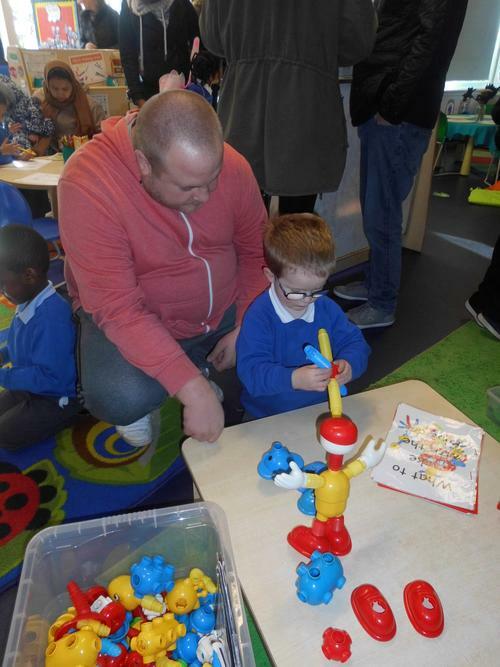 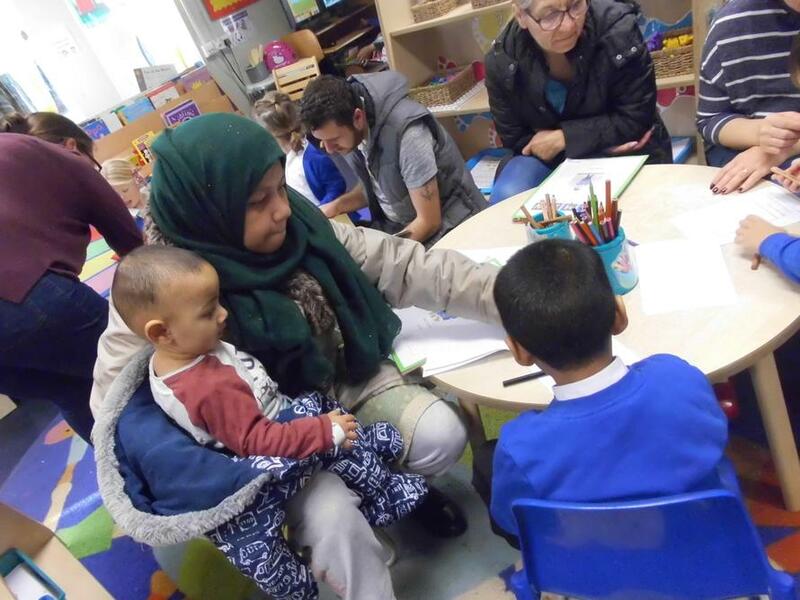 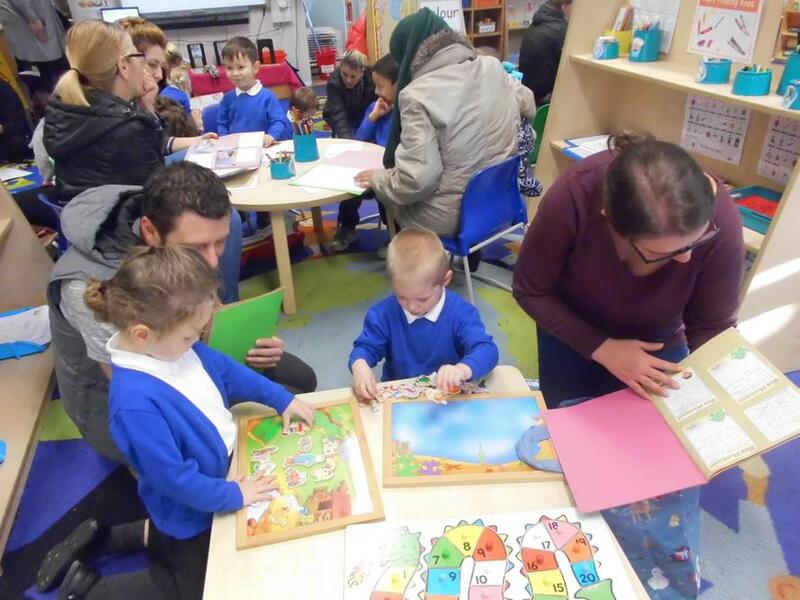 The children are invited to bring in something from home to match the colour on the colour table or can also find something in Nursery to add to it. 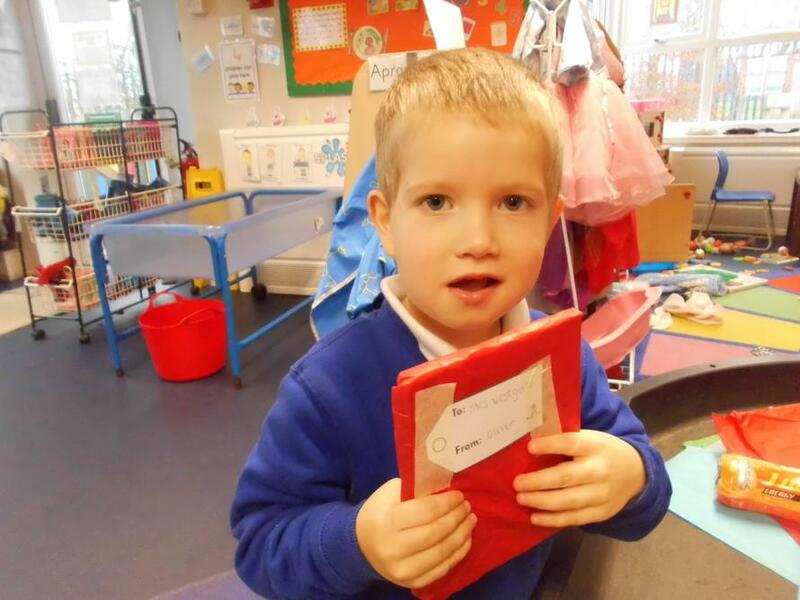 Please label items bought from home with your child's name. 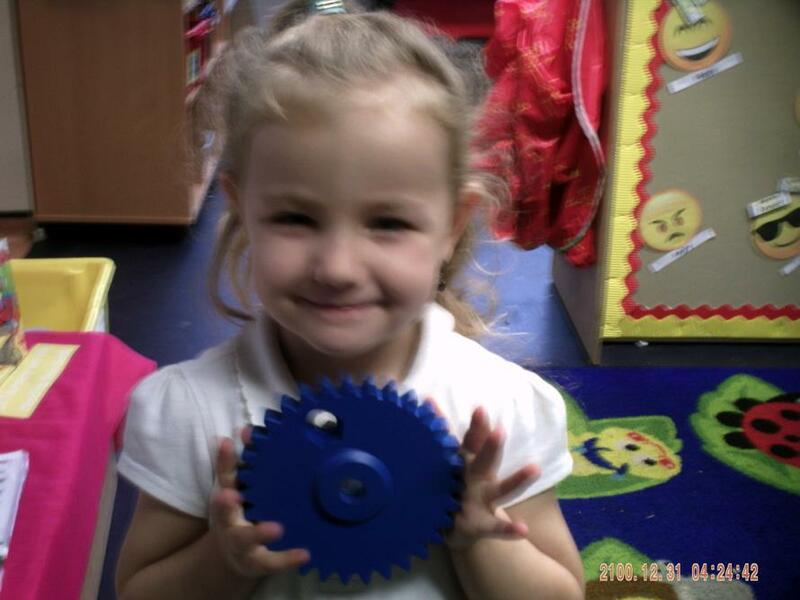 Show and Tell for Nursery takes place on a Tuesday and will begin on Tuesday September 18th. 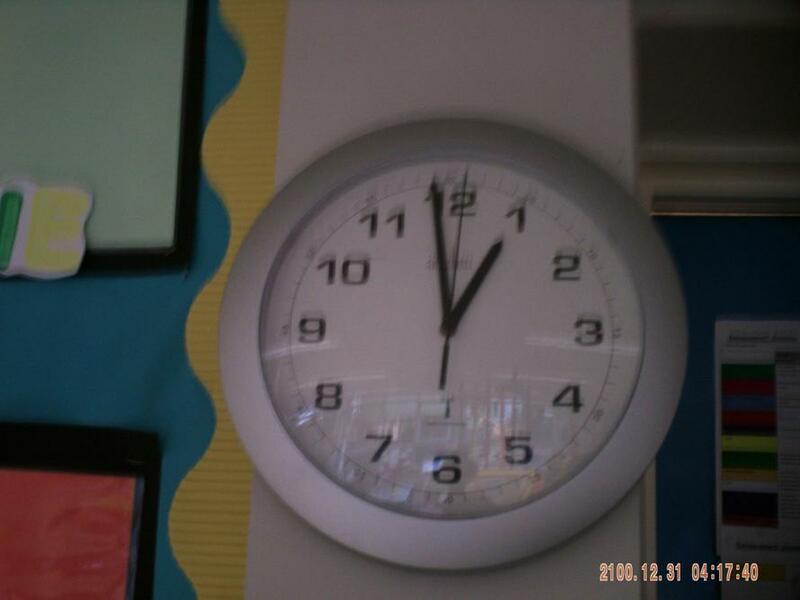 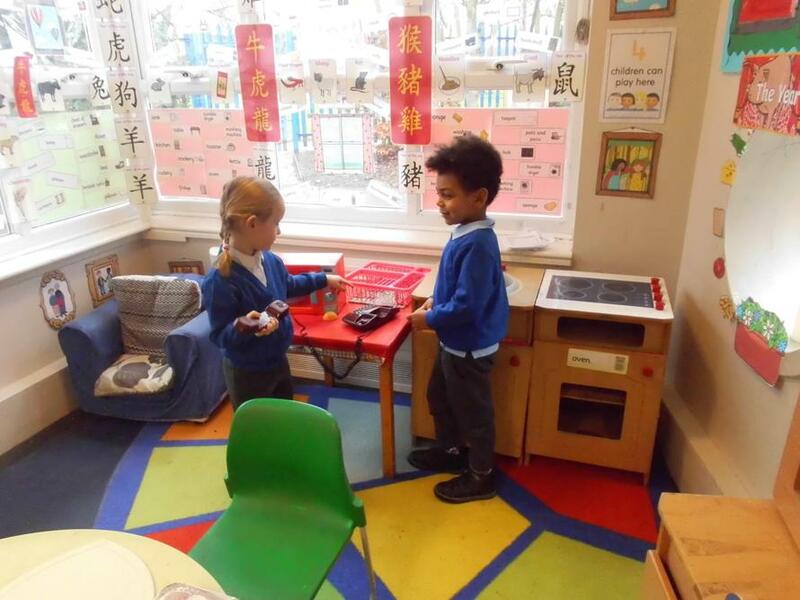 The children are invited to bring in something to talk about e.g. 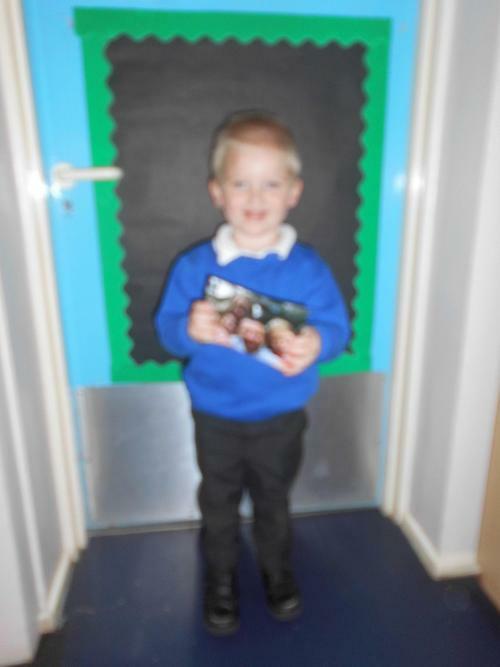 photograph, bus or train ticket, map of a place visited. 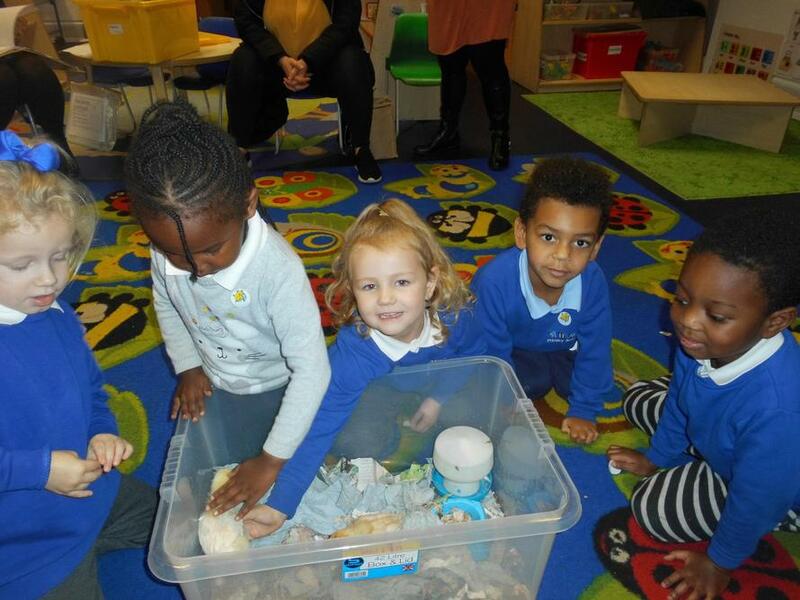 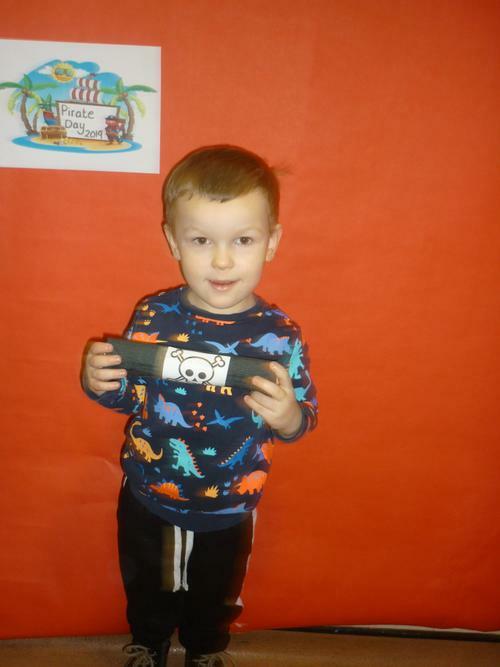 Please ensure that you label your child's item with their name before putting into the show and tell box in class. 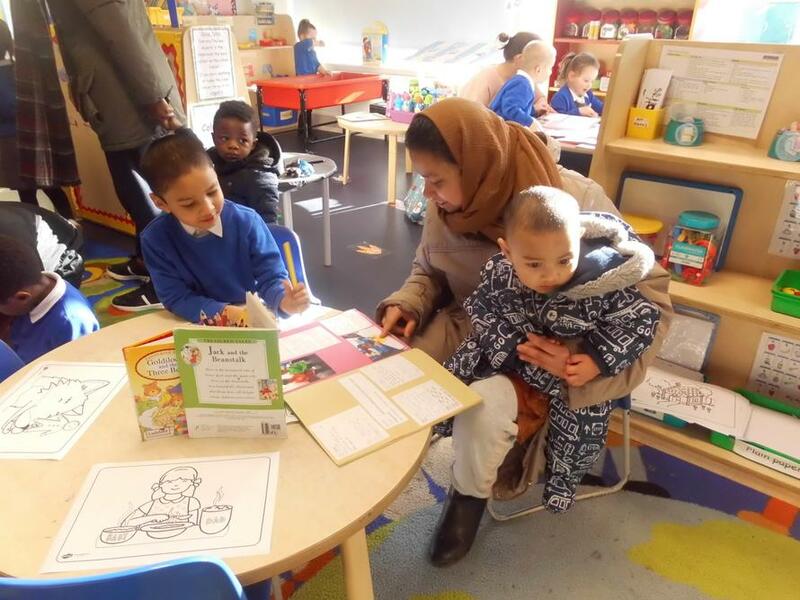 Both Morning and afternoon Nursery visit the school book bus on a Wednesday, which is situated to the right of the main gates, next to the Sure start centre. 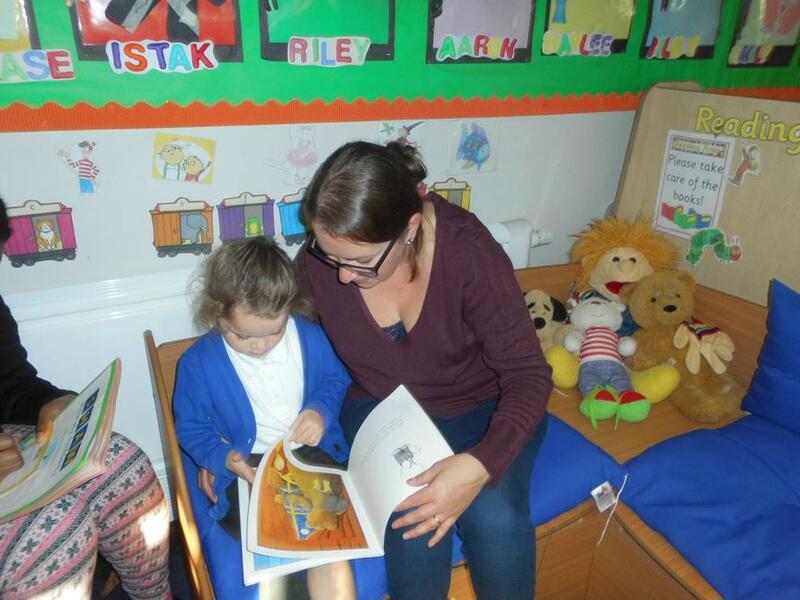 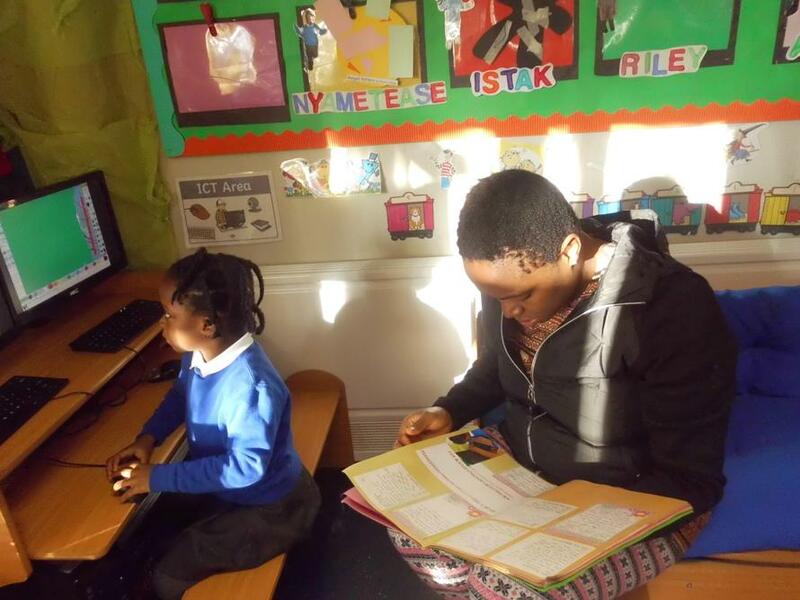 This is an opportunity for the children to read/share a book of their choice, with an adult from the vast range of fiction and non-fiction texts available on the bus. 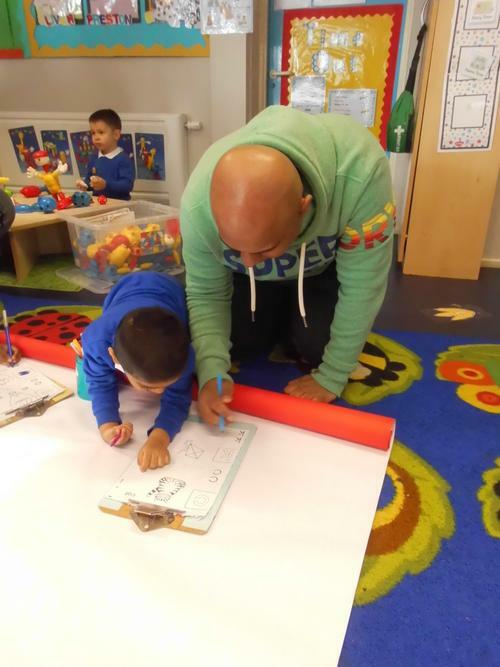 Activity packs are full of fun activities that you can take home to do with your child. 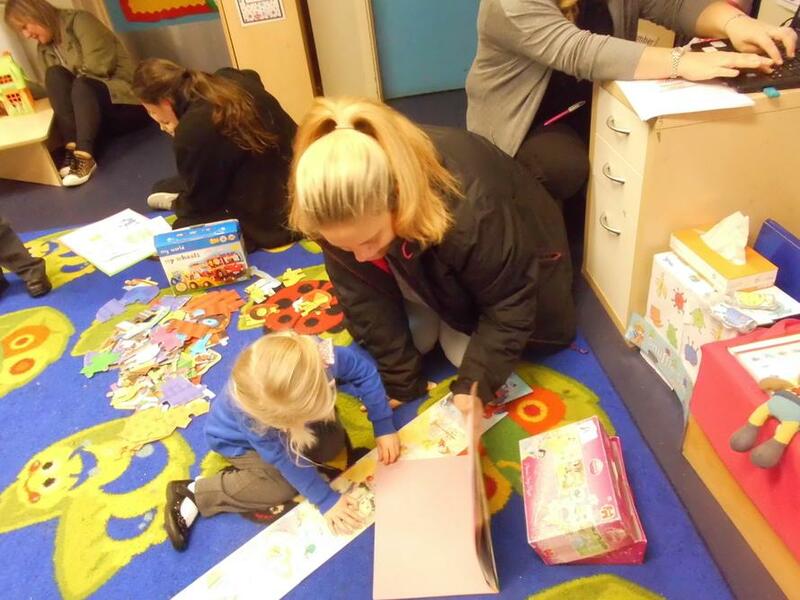 Each week, book bags are collected in on a Wednesday and then given out to you at the end of the session on a Thursday with the activity pack inside. 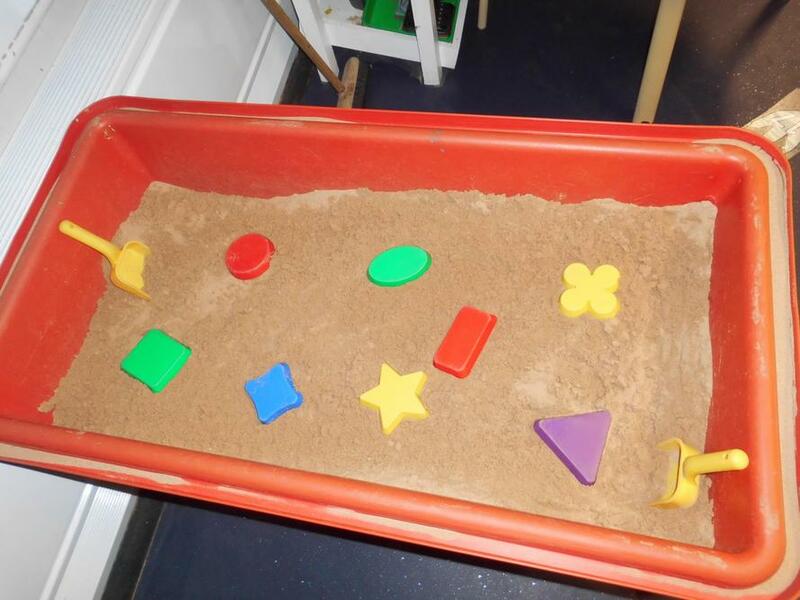 These can be kept at home for the week and returned the following Wednesday for a new activity pack. 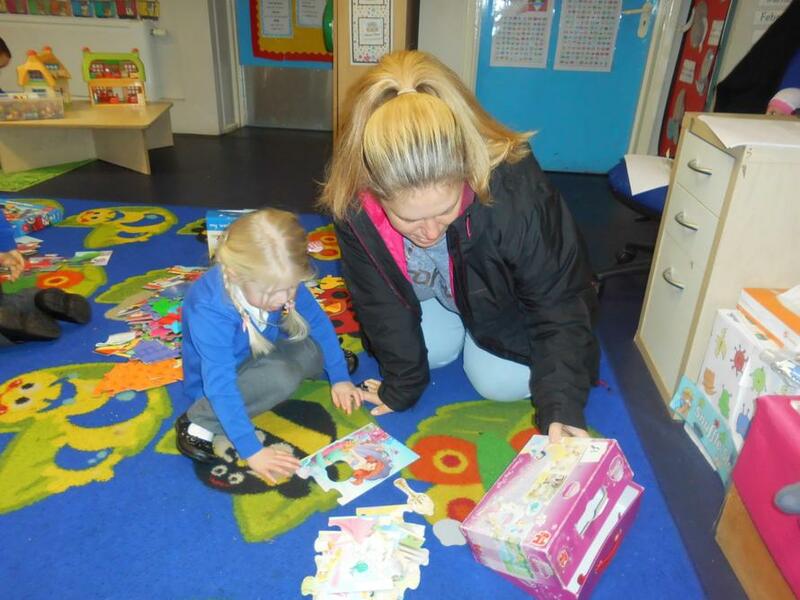 Please look after all of the toys/activities given in the activity packs. 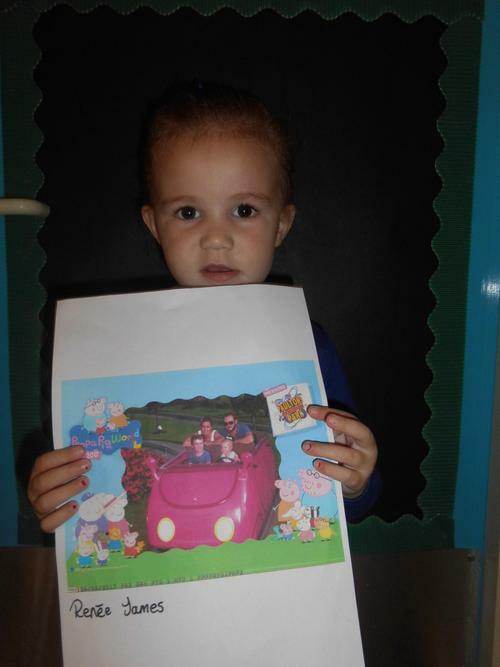 Pictures, tracings and colourings can be kept at home. 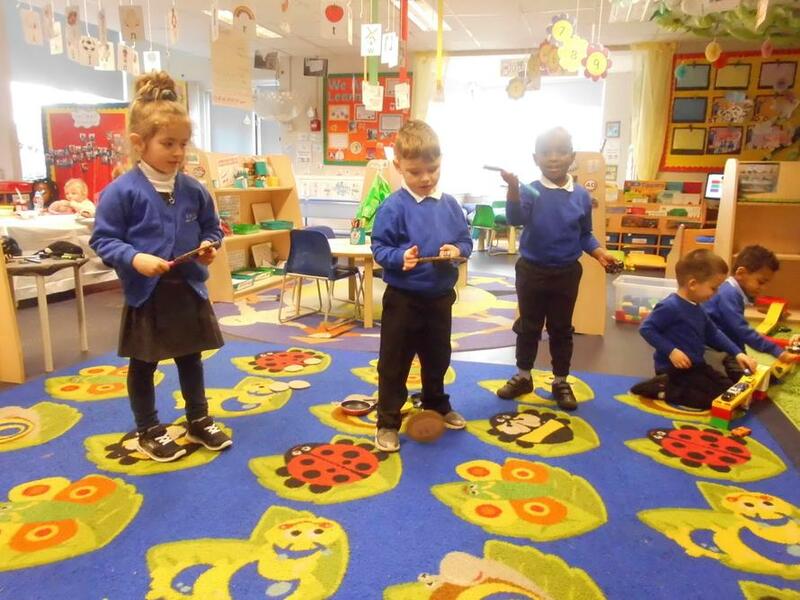 Nursery children do not need to change for PE but take off their shoes and socks to take part. 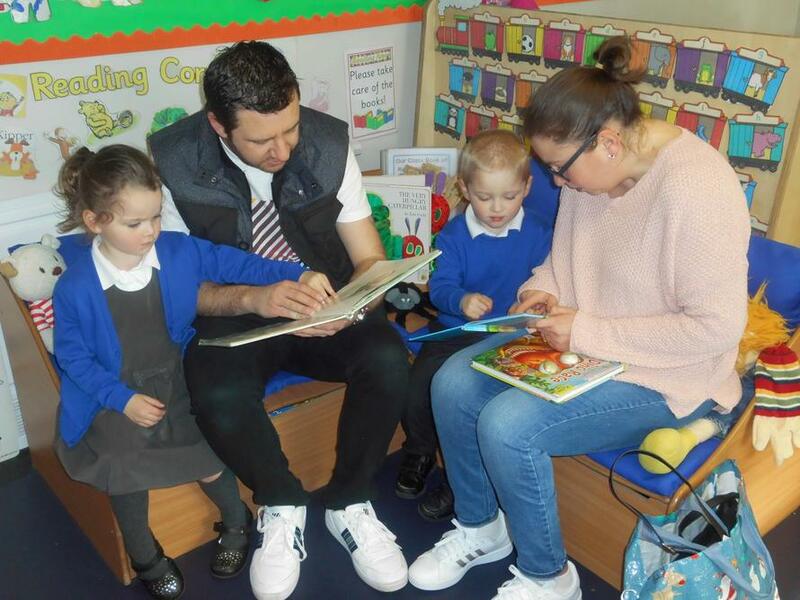 Therefore we ask that you send your child to school in sensible shoes they can attempted to take on and off independently. 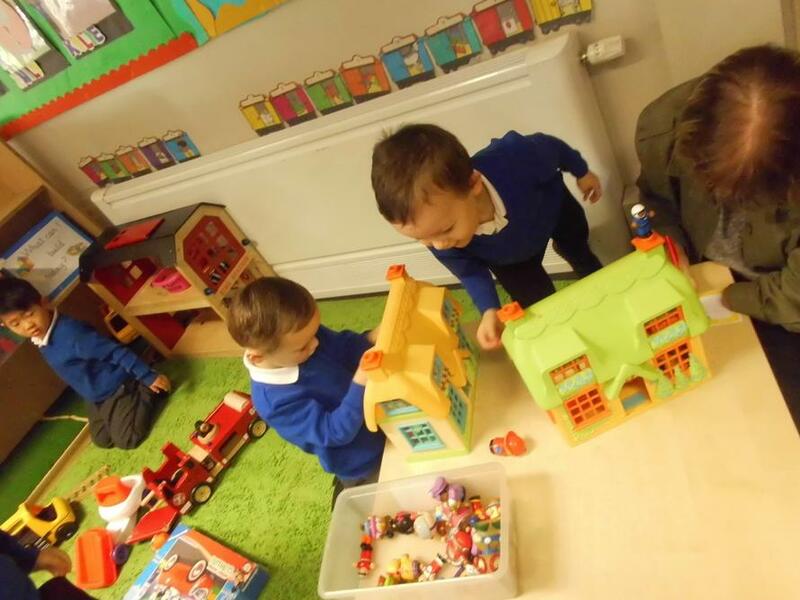 Our Nursery has 2 class teddies, Zap and Flash who go home with a chosen child for the weekend on a Friday. 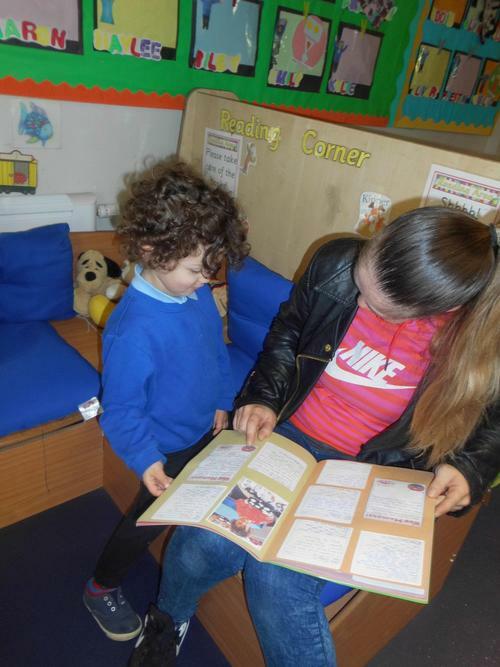 The teddies will come home with an adventure book with empty pages to be filled with writing, drawings or photos of the things they have done over the weekend and then returned on Monday. 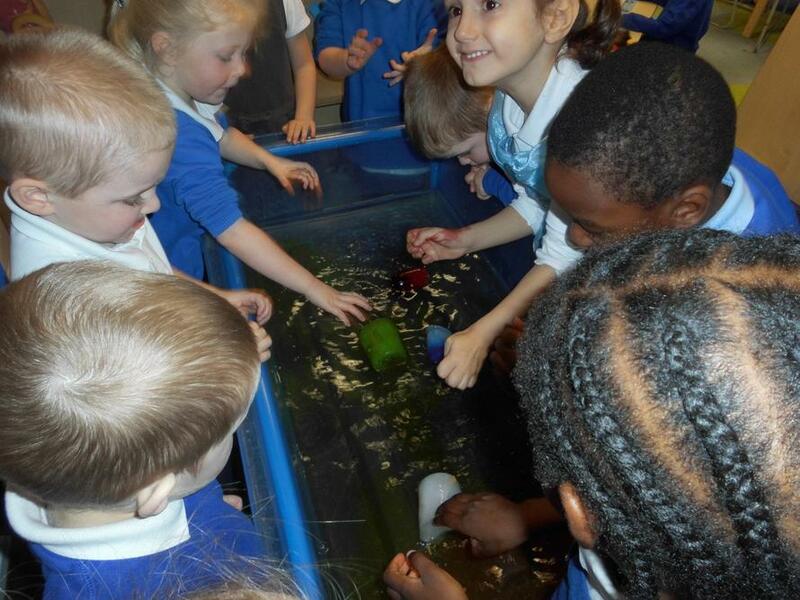 The adventures will be shared with the class during carpet time on Monday. 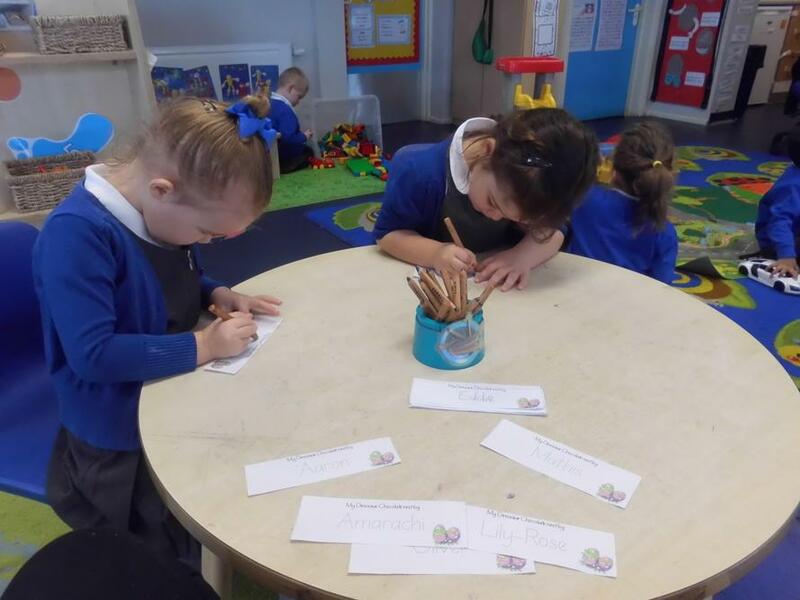 This half term began with us finding out all about each other. 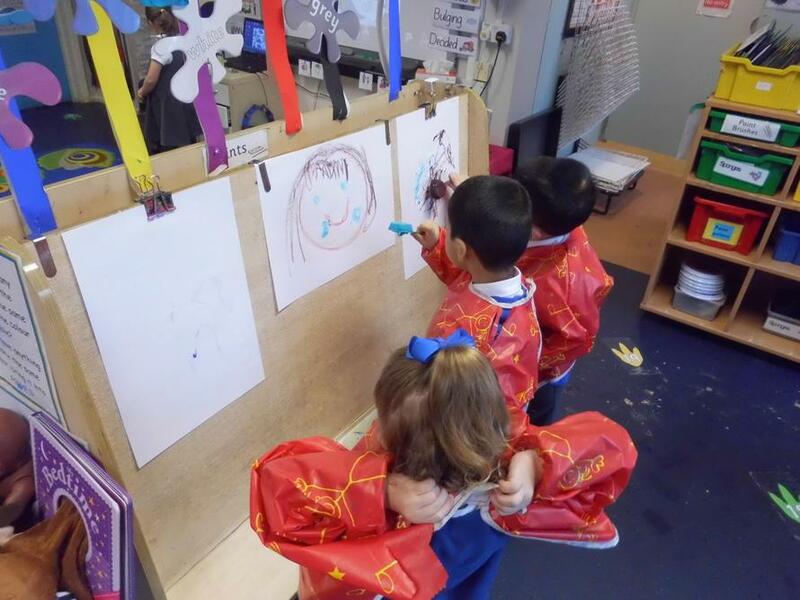 We looked at our faces and talked about our hair colour, eye colour, skin tone and compared to our friends and we enjoyed making faces using different art materials in the creative area. 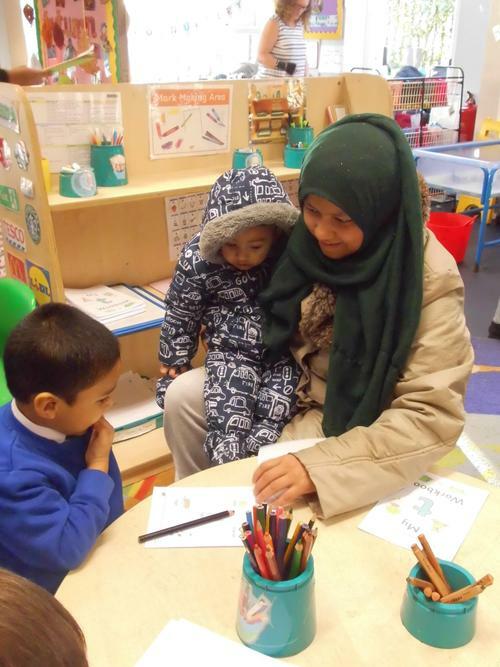 We also read stories and talked during circle time about our families and about how many brothers, sisters or pets we have. 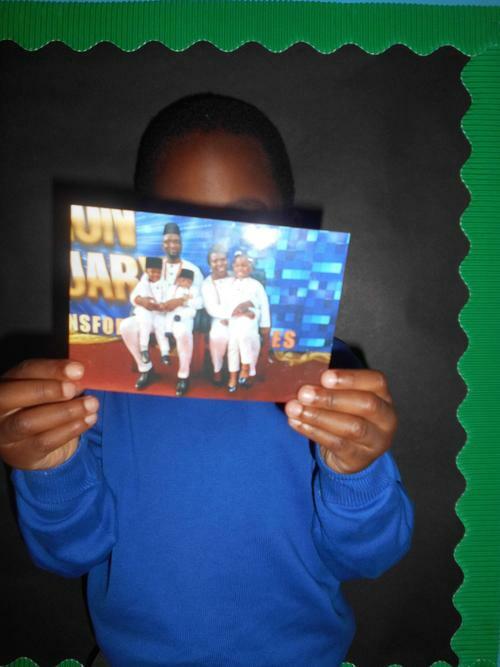 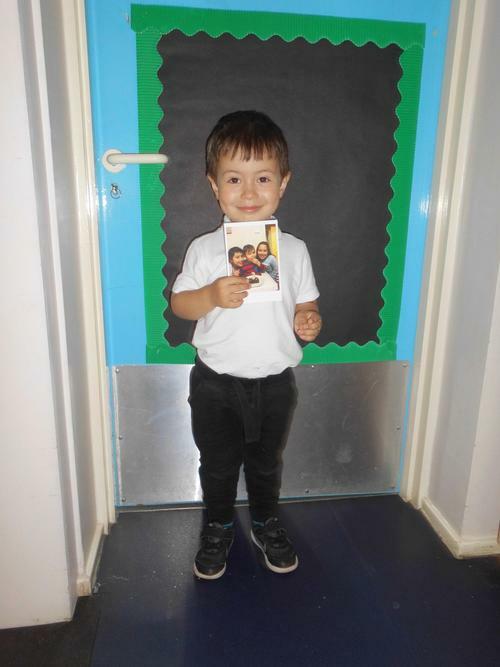 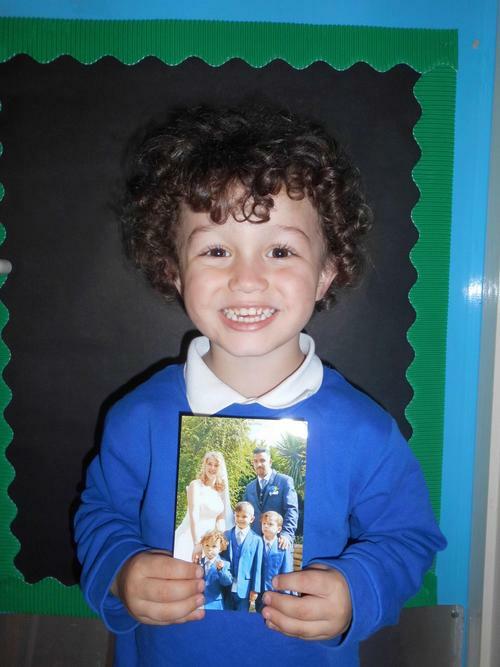 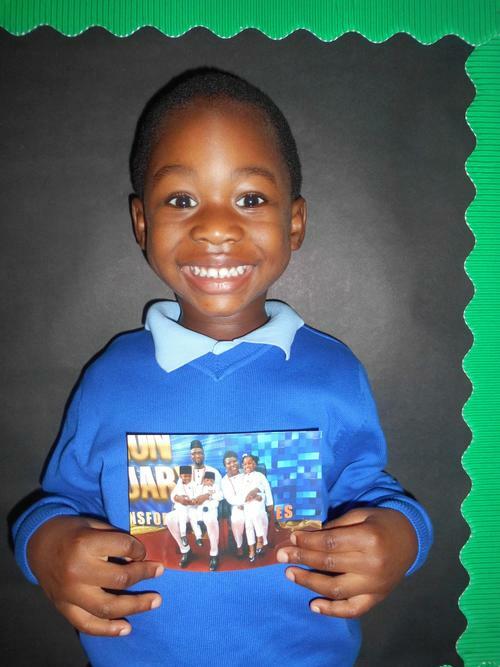 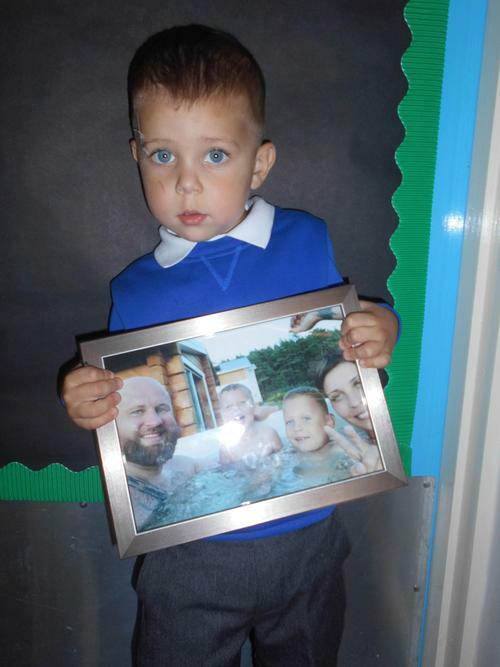 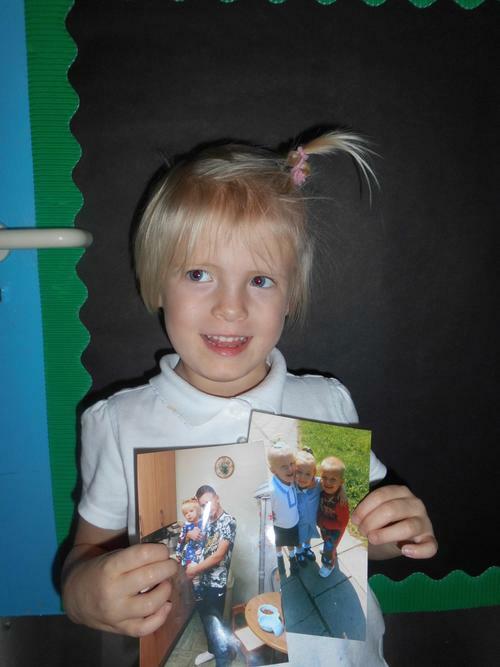 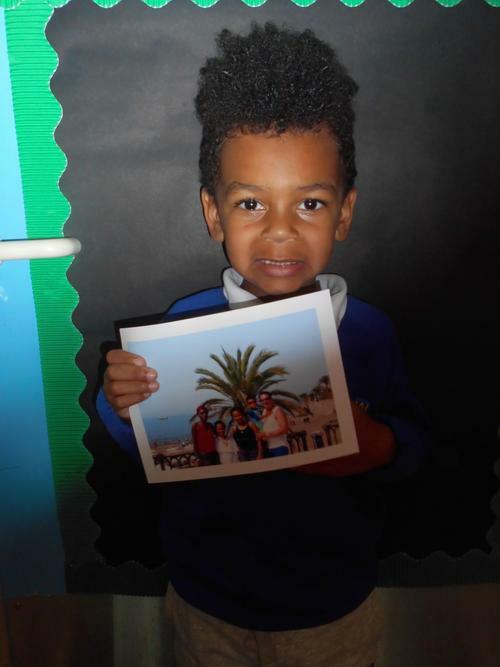 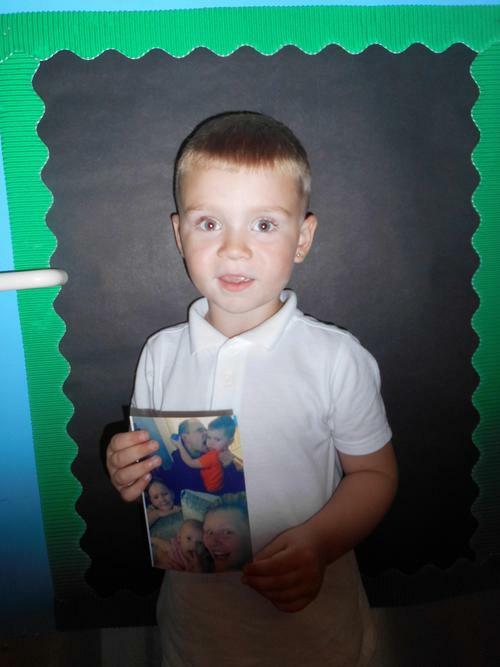 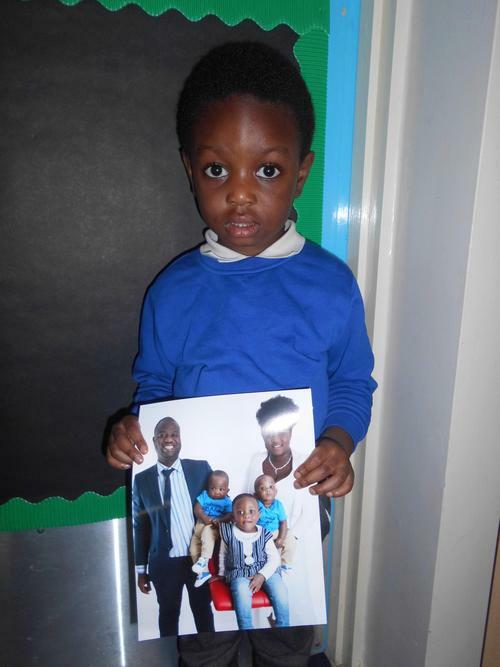 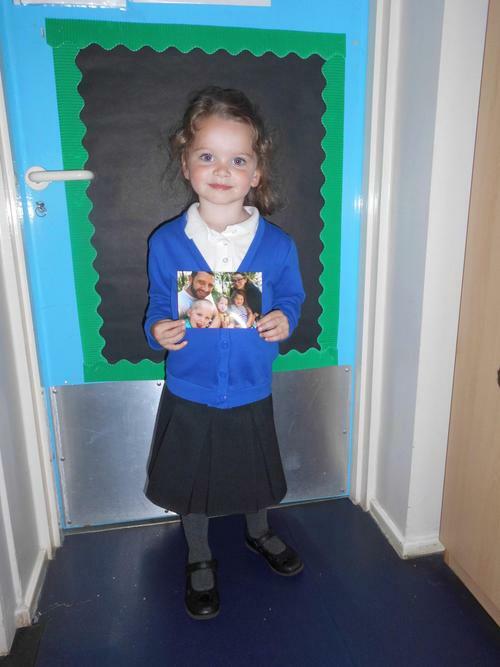 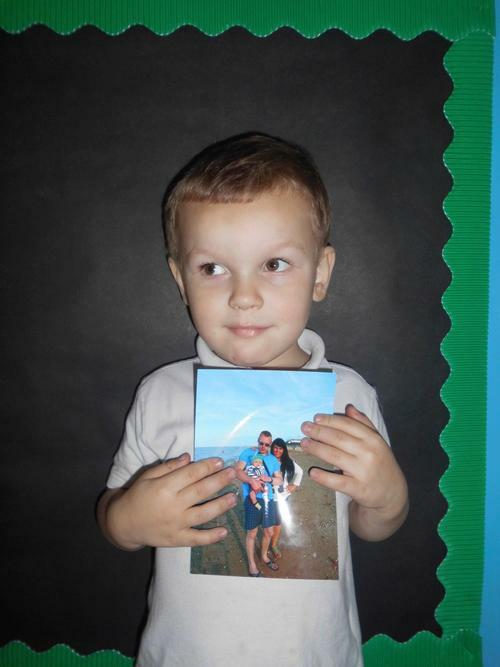 The children enjoyed bringing in a picture of their family to tell us about for 'Show & Tell'. 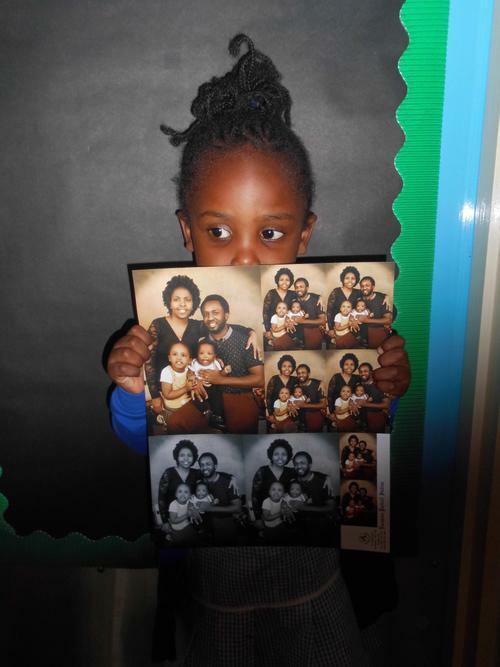 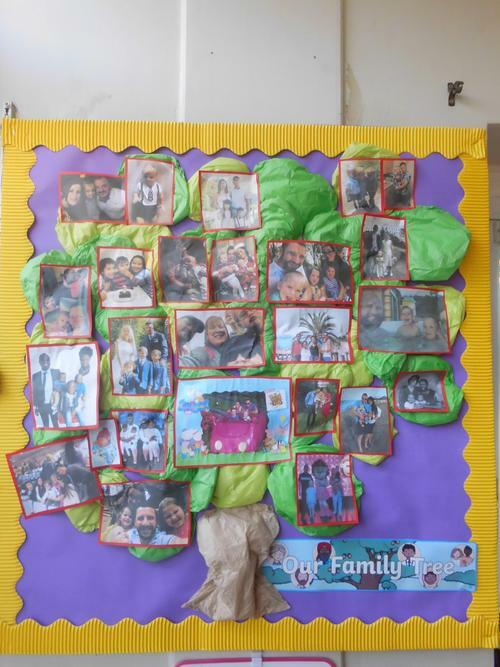 Below are some photos of the children and their family photos, our family tree display and some of the faces we made. 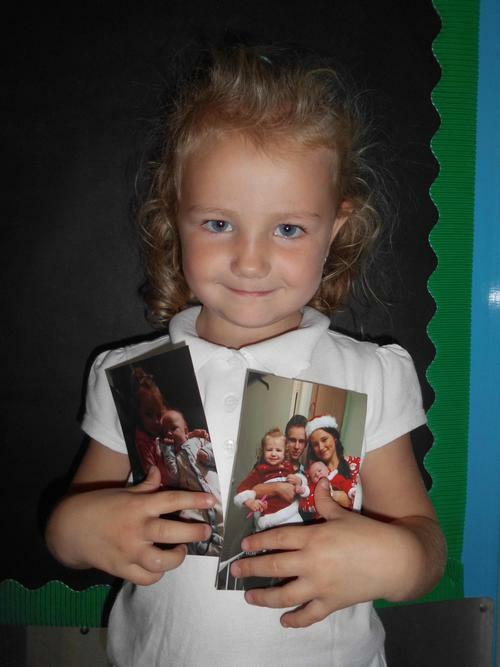 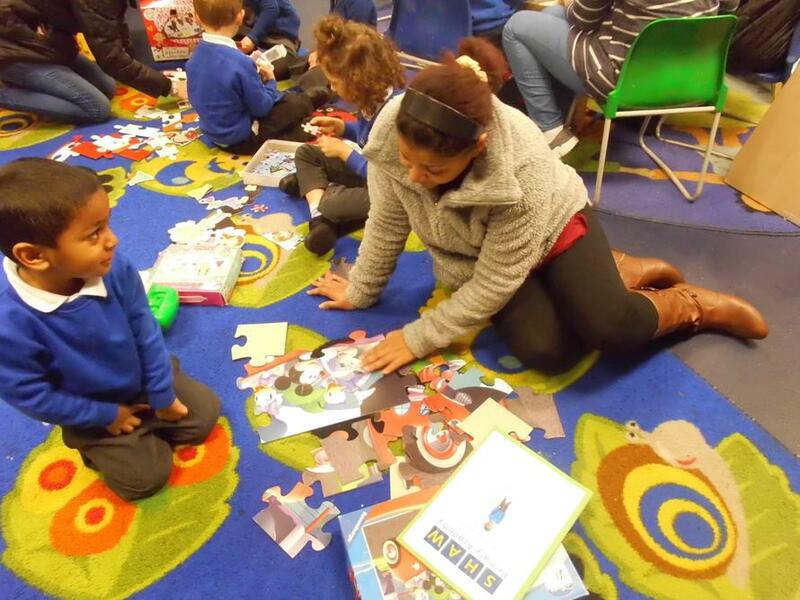 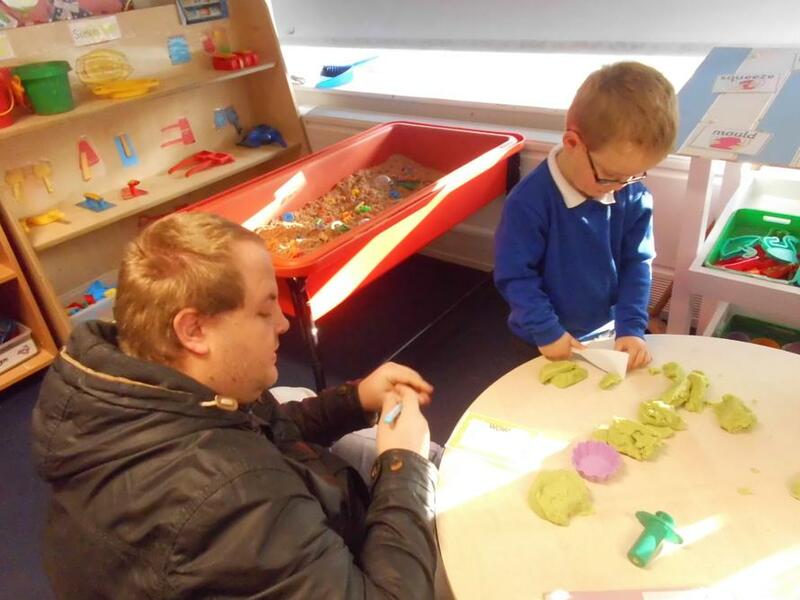 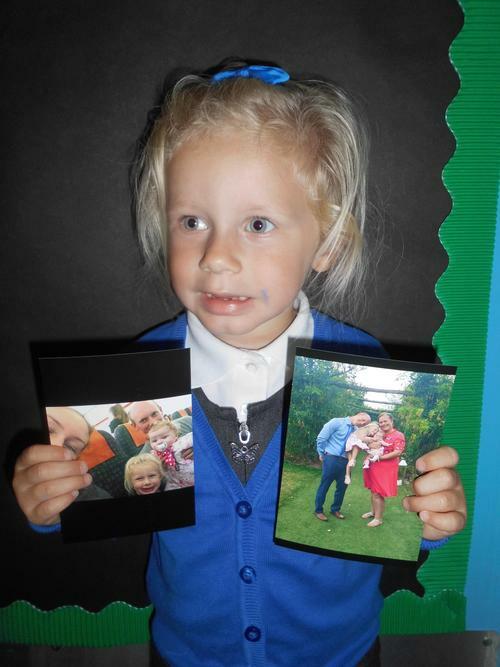 Show and Tell family photos, Nursey fmily tree and funny cutting and sticking faces! 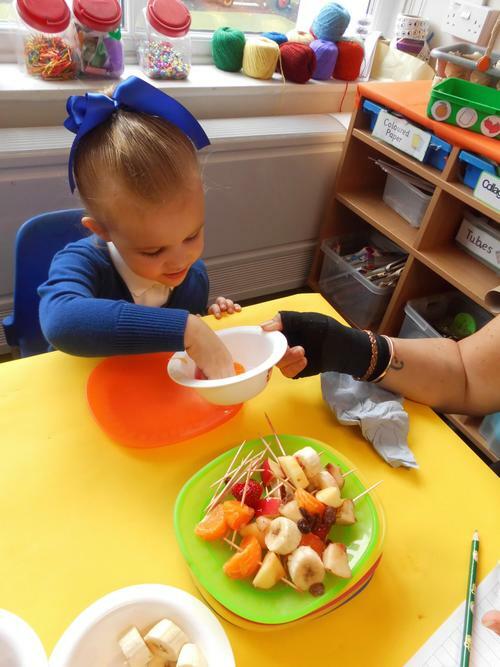 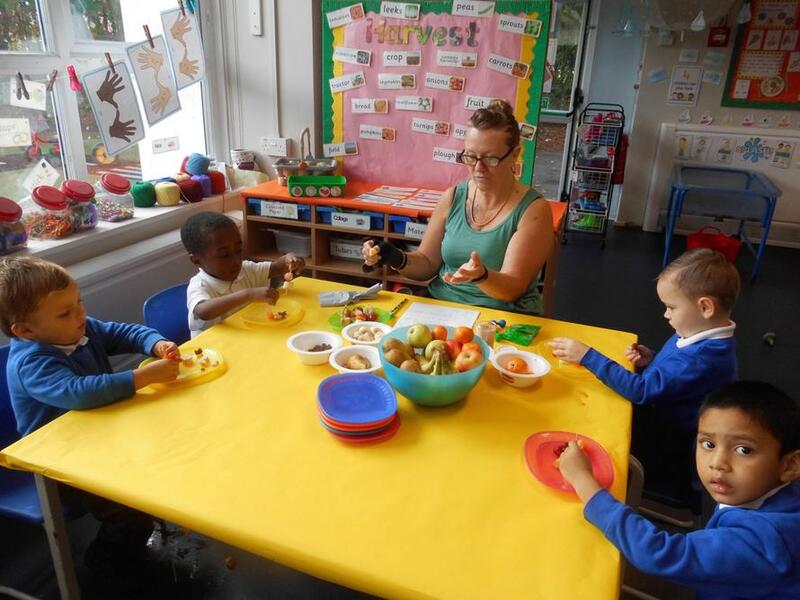 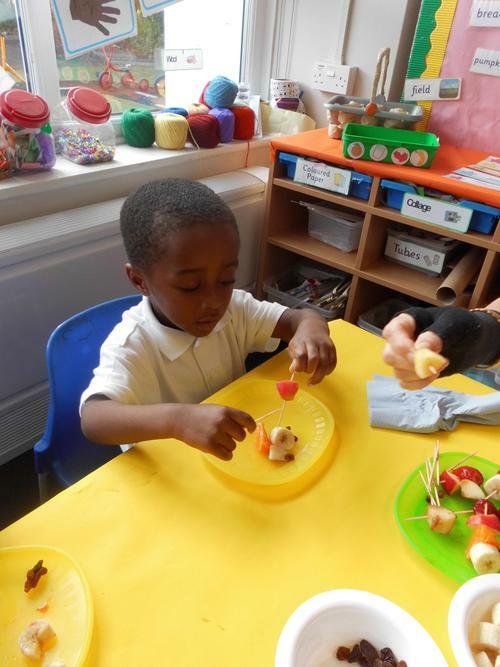 Wash your hands song and activty, Fruit kebab making and sorting into colours activities! 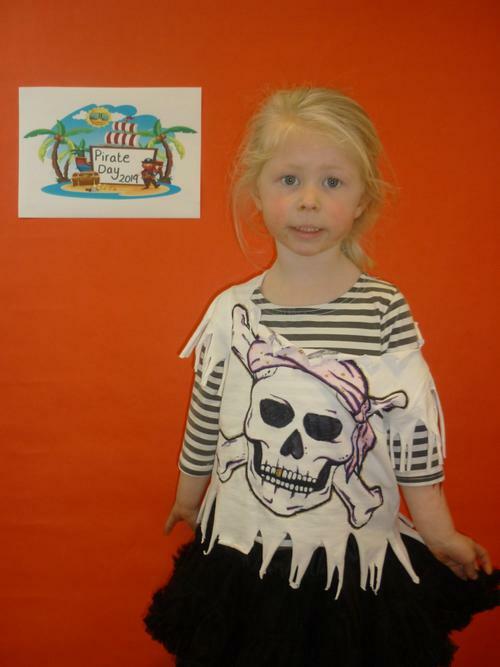 🎃 The Skeleton Dance is one of our favorite songs to learn about our bodies! 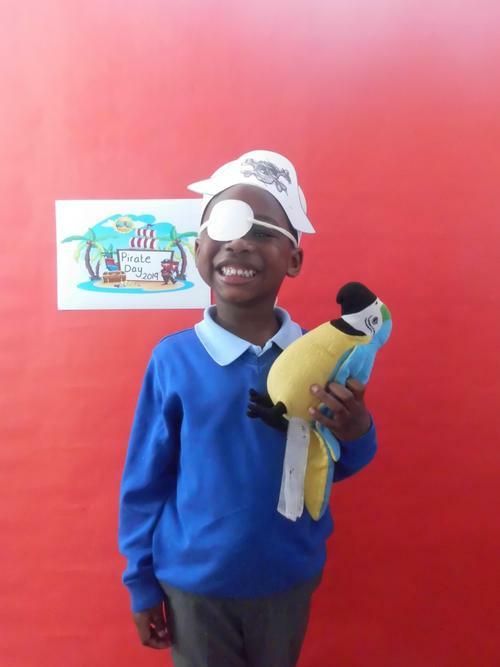 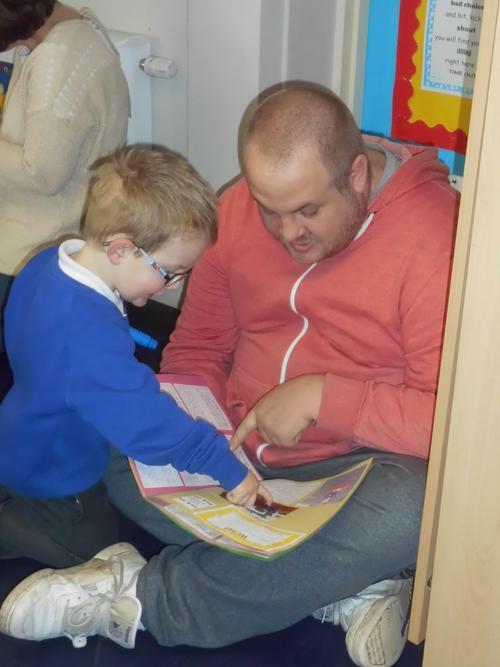 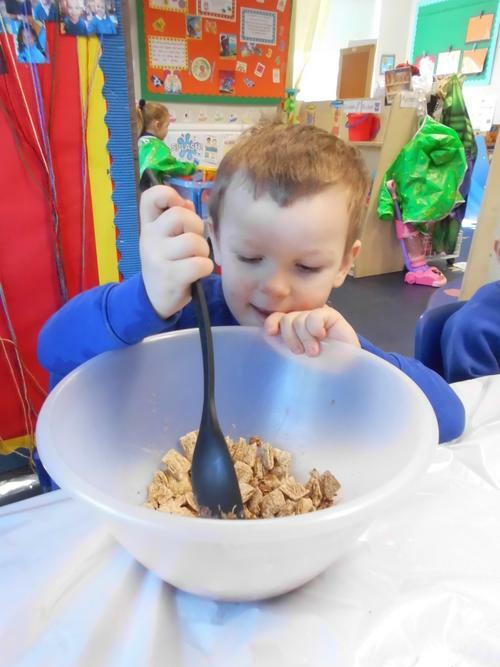 The children have been learning lots and working so hard this half term, we had a celebration with wow! 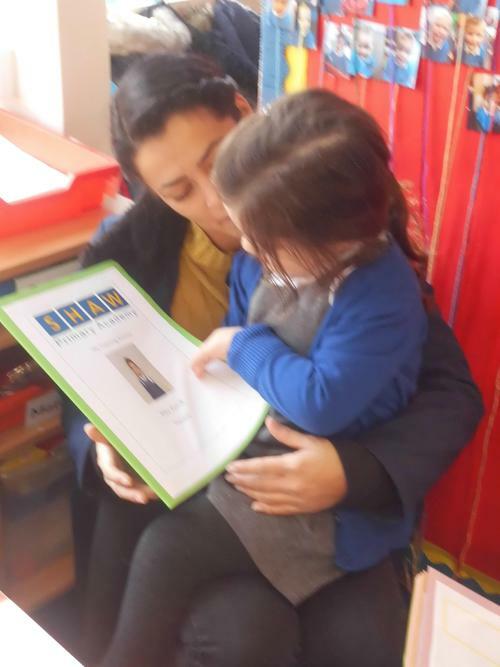 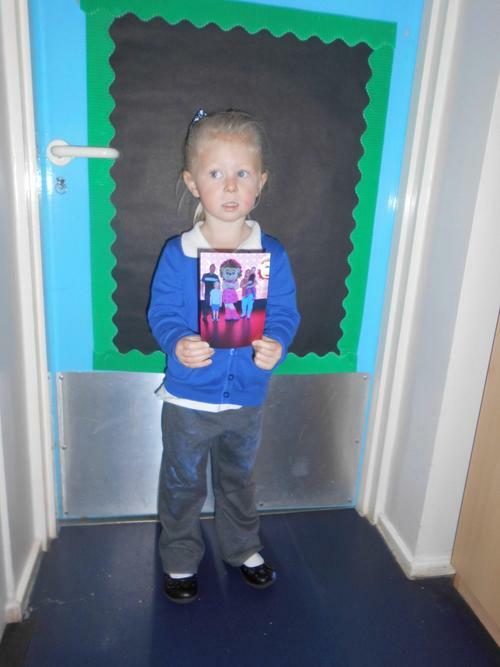 moment for show and tell and the children enjoyed sharing them and receiving their certificate. 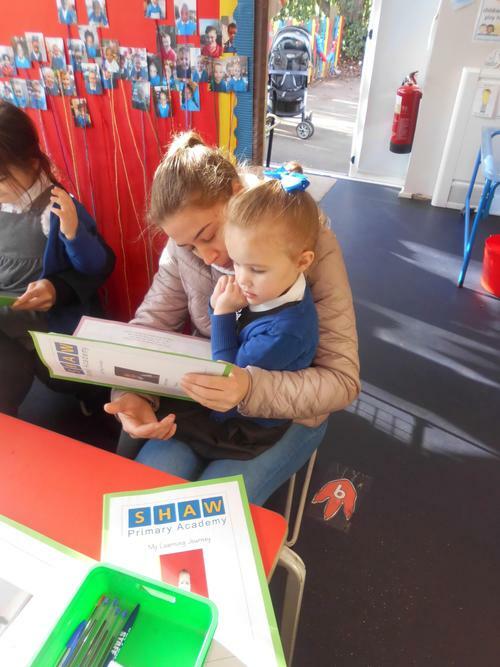 The Wow moments are encouraged not just for show and tell but all year thorough, to celebrate the achievement that we do not see at school! 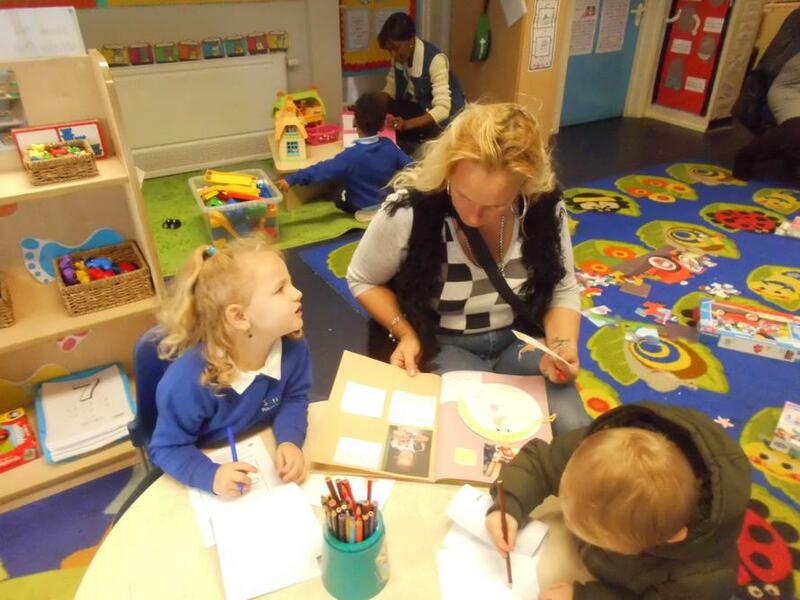 Wow moments are displayed on our celebration wall before being stuck in to the children learning journals. 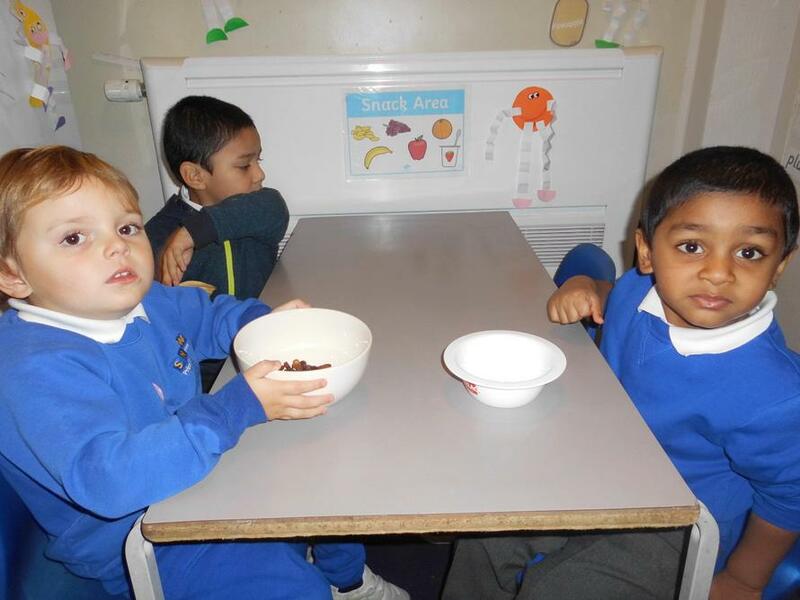 Thank you to all of those who donated to the Harvest Collection. 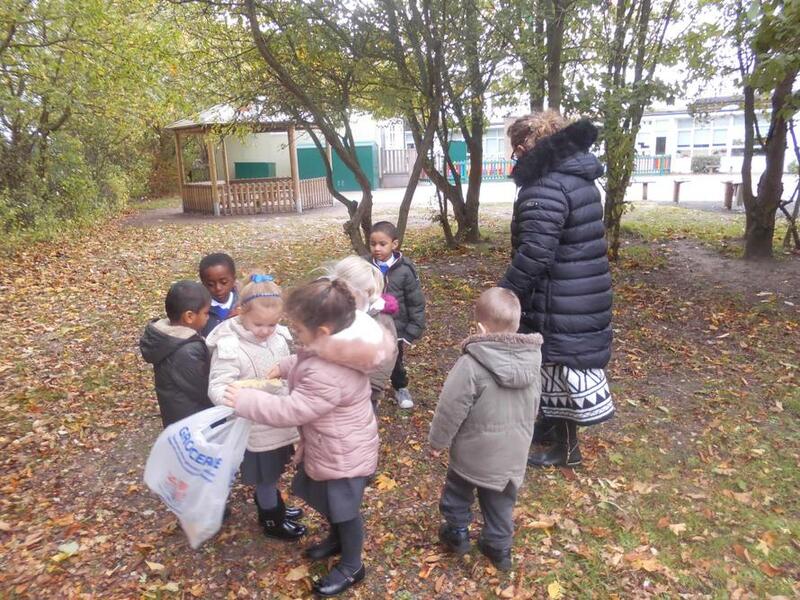 The donations have been sent out to local food banks Thank you!!! 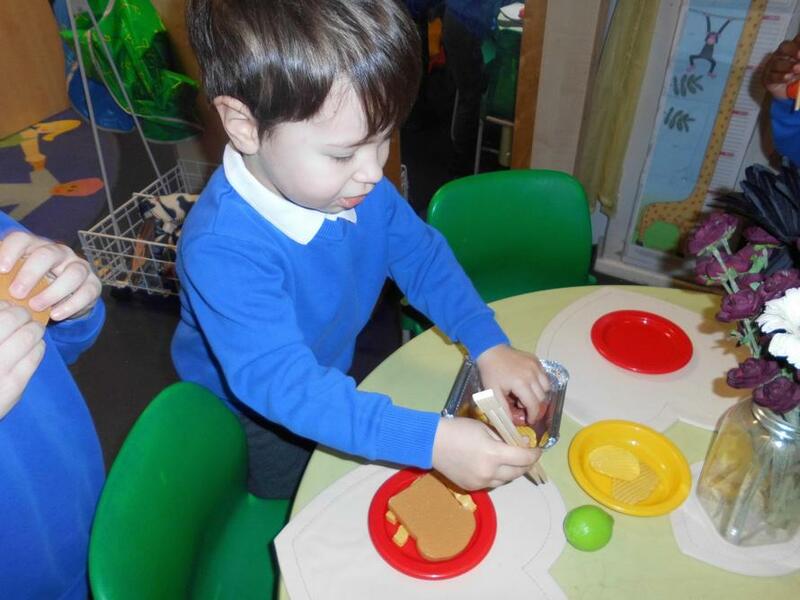 The Little Red Hen’ and ‘The Gingerbread man’. 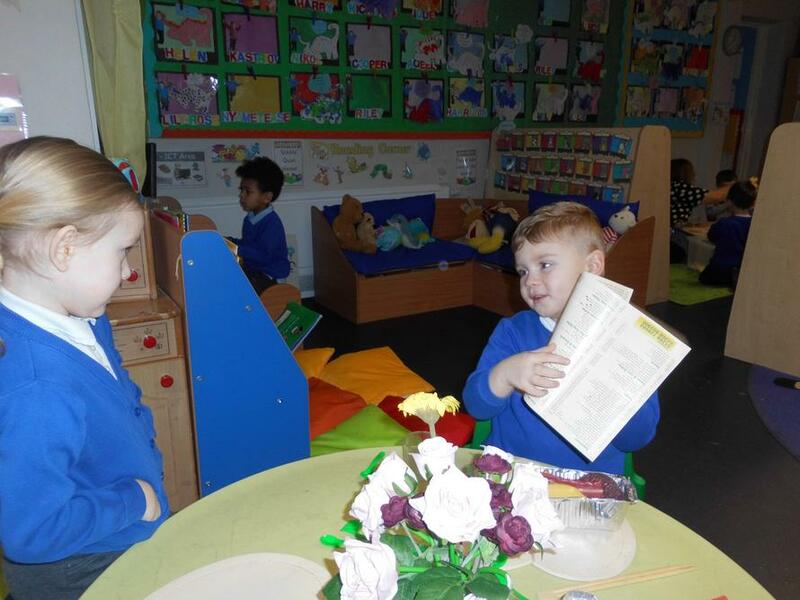 And our topic is ‘Story telling’. 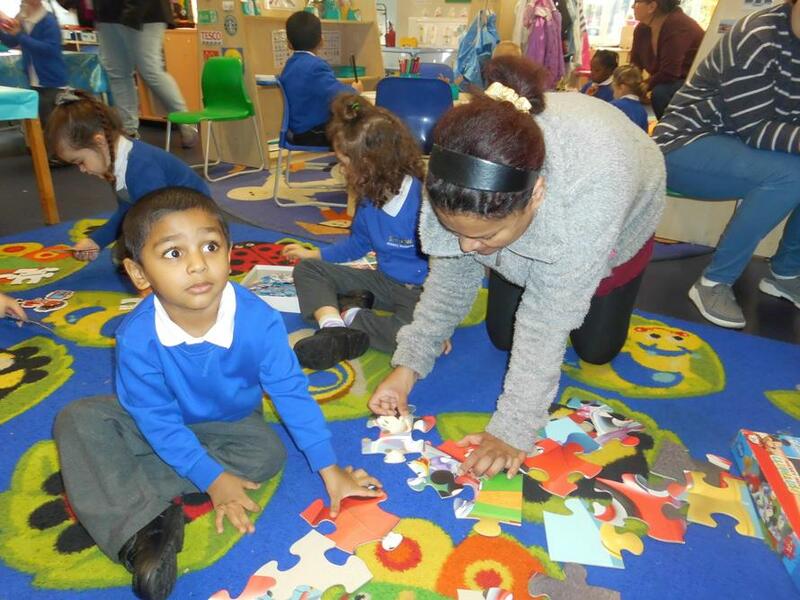 We will be learning lots of new concepts through lots of familiar and traditional tales. 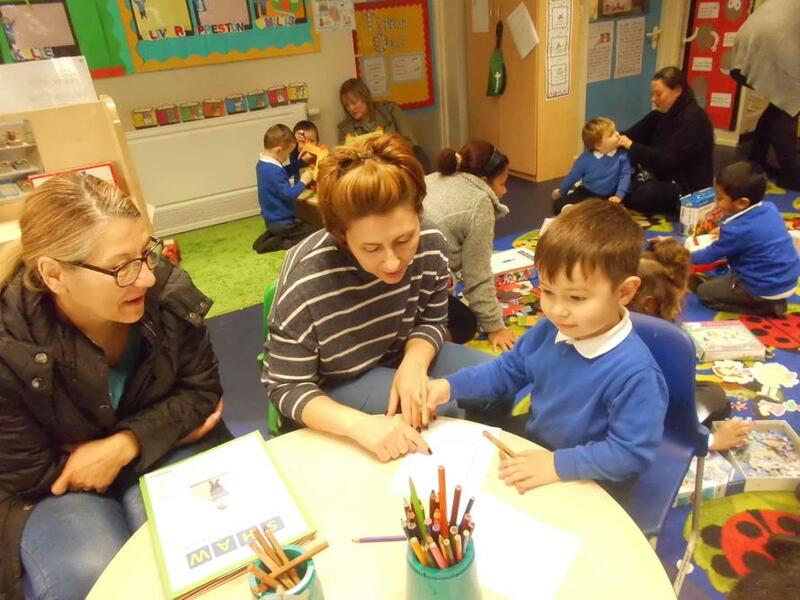 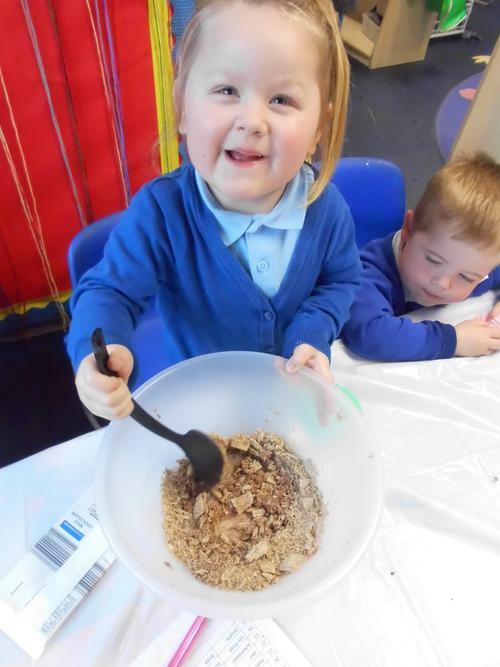 This half term there are lots of festivals and celebrations for Nursery to learn about, these include Halloween, firework night, Diwali, Hannukah and also Christmas. 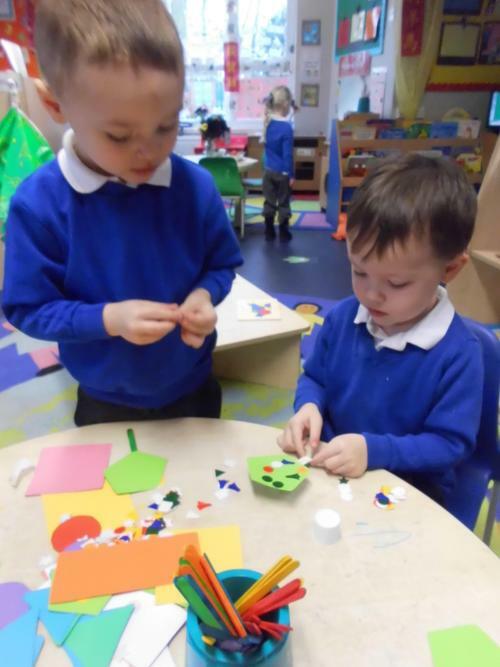 We will have lots of creative activities based around these celebrations and discuss them during our circle time. 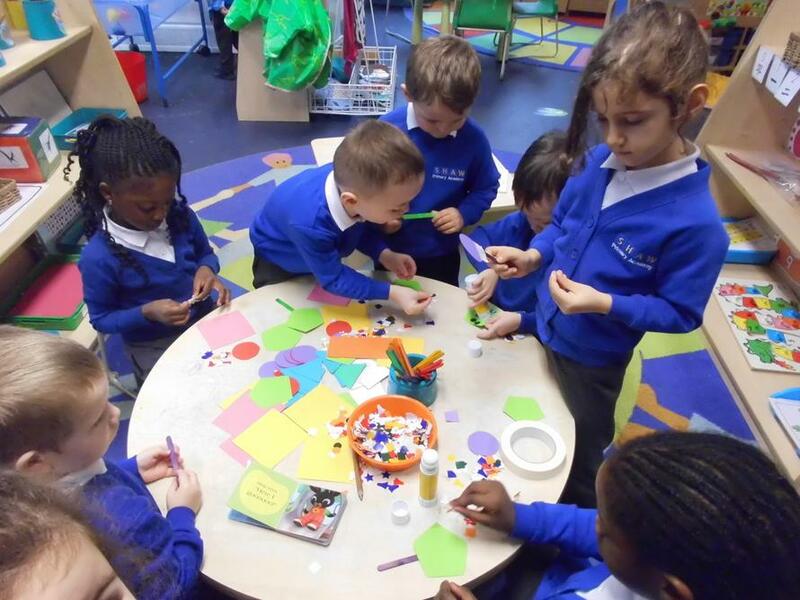 In Mathematics we will be using some traditional tales to help learn maths concepts. 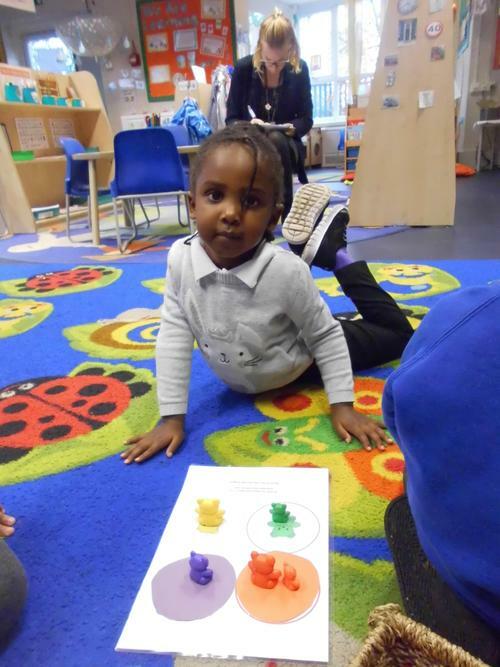 Goldilocks and the three bears will be used to teach language related to size, and the three billy goats gruff will help us learn about ordinal numbers along with others along the way. 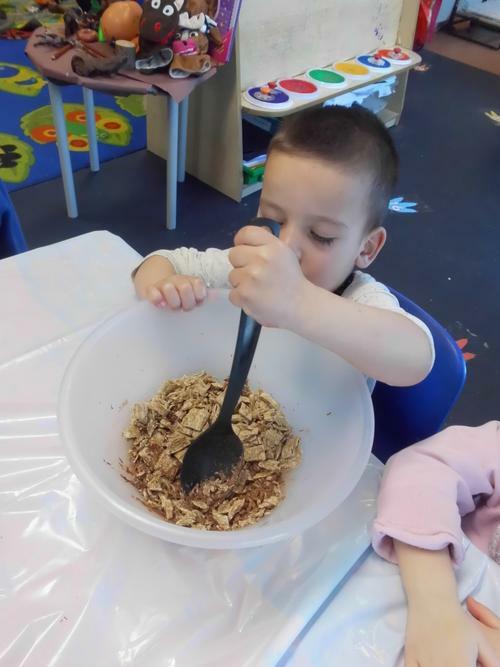 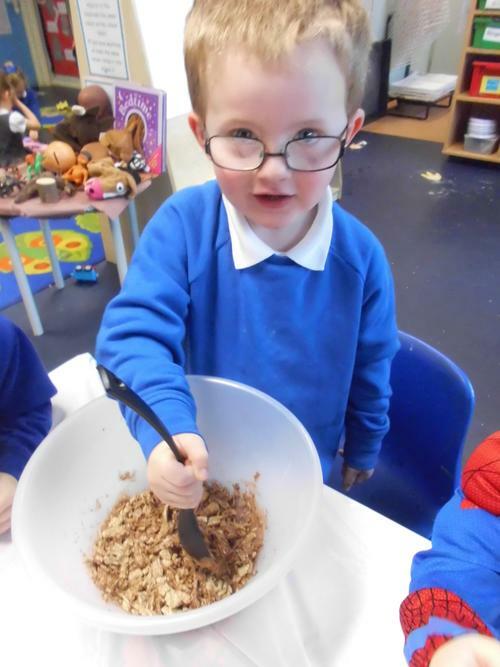 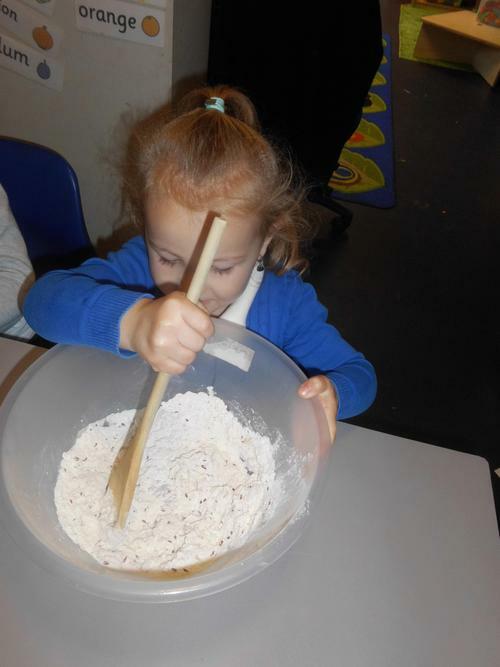 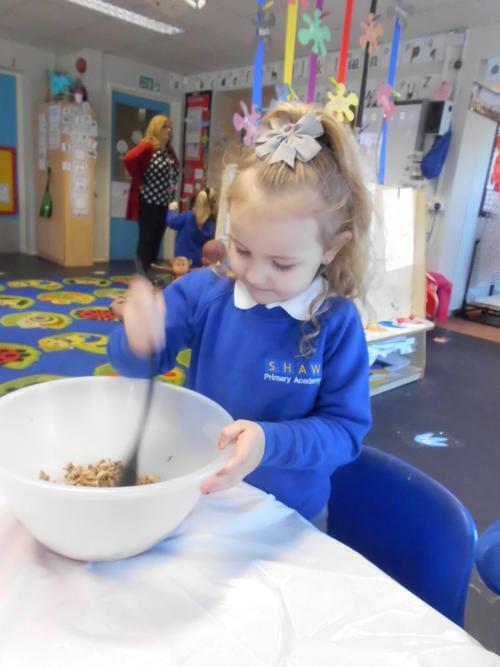 After reading the story 'The little Red Hen' we baked bread and shaped it into Hedgehogs! 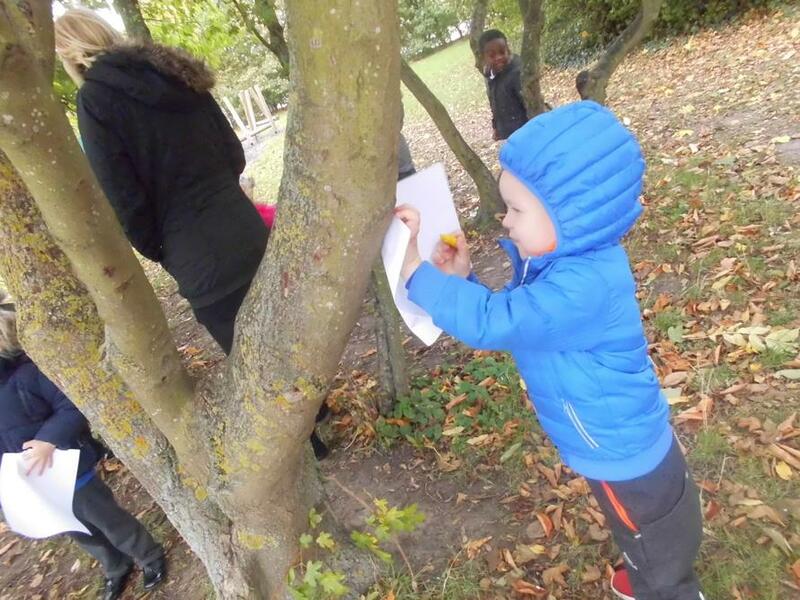 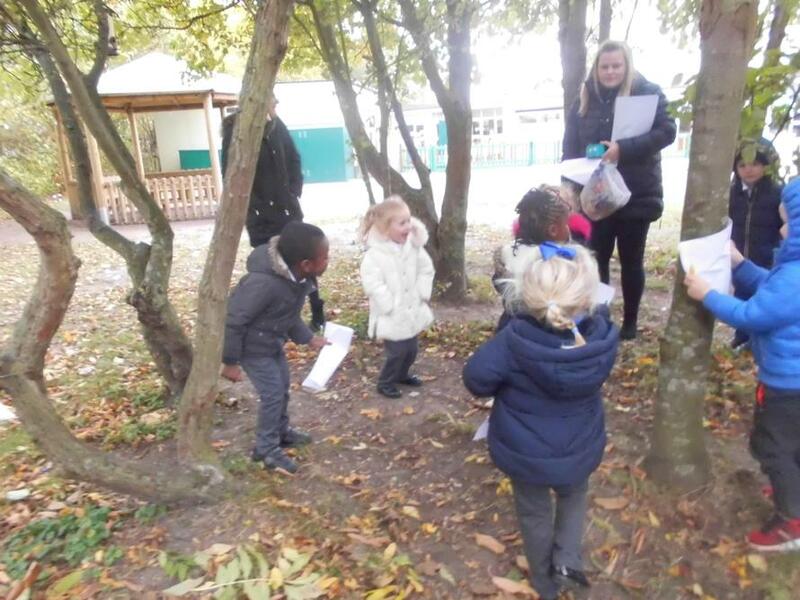 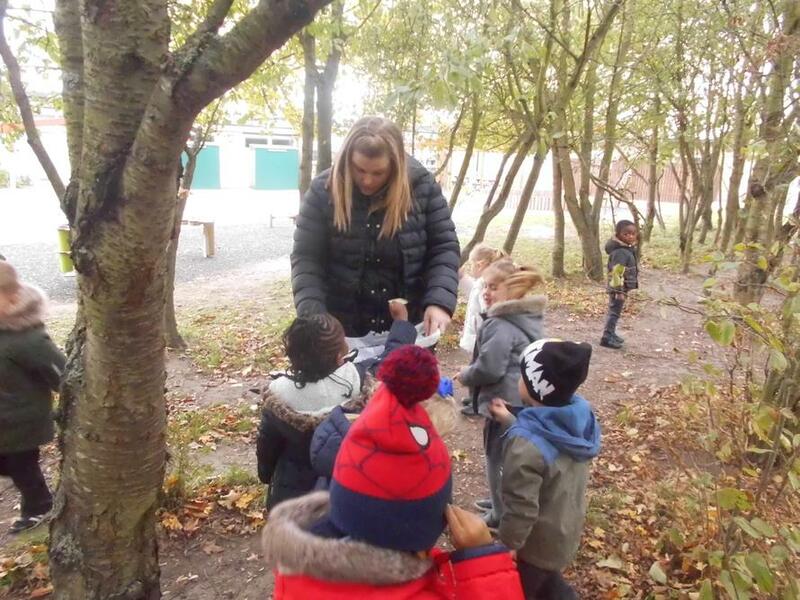 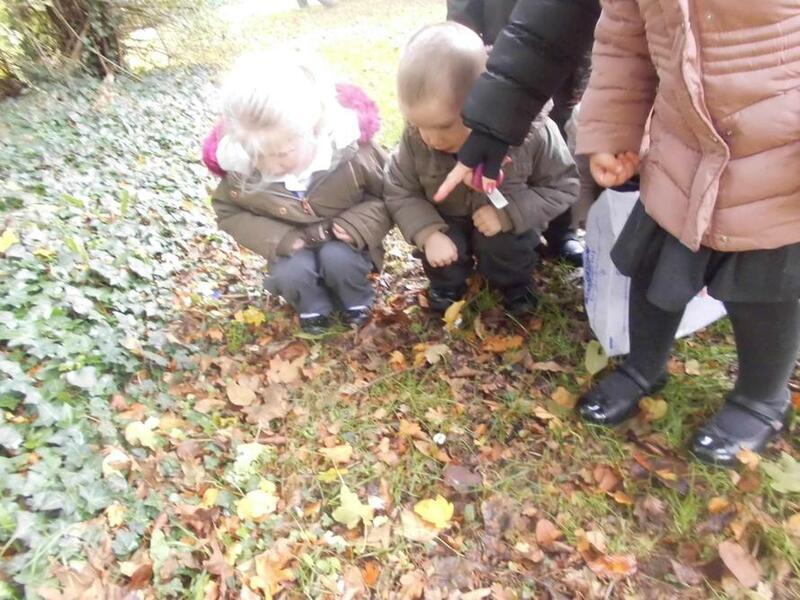 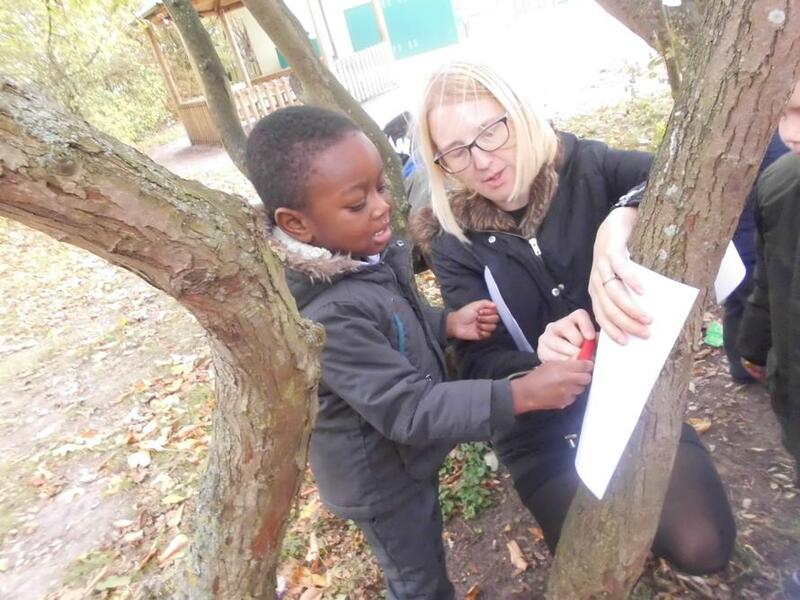 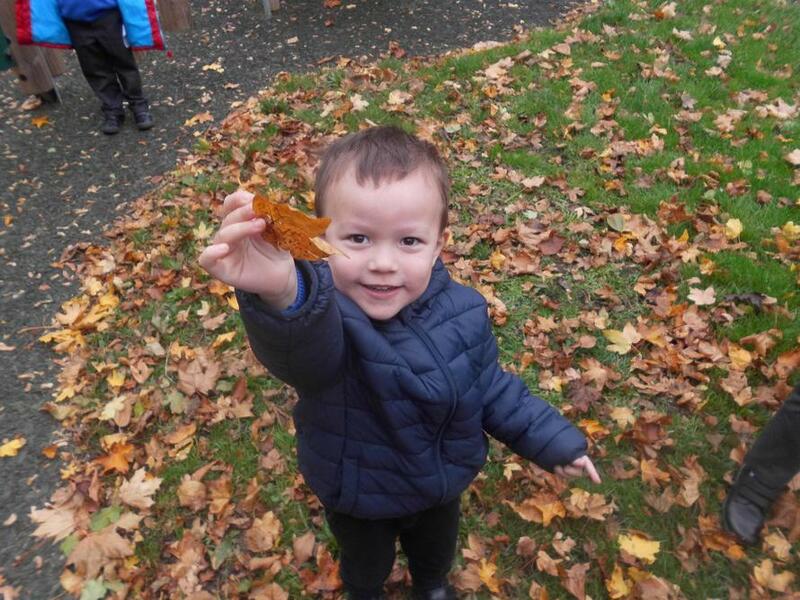 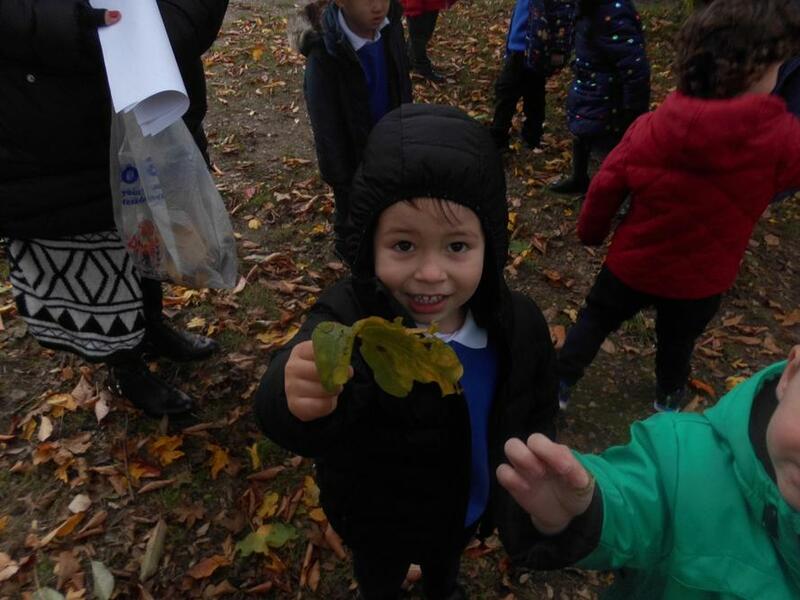 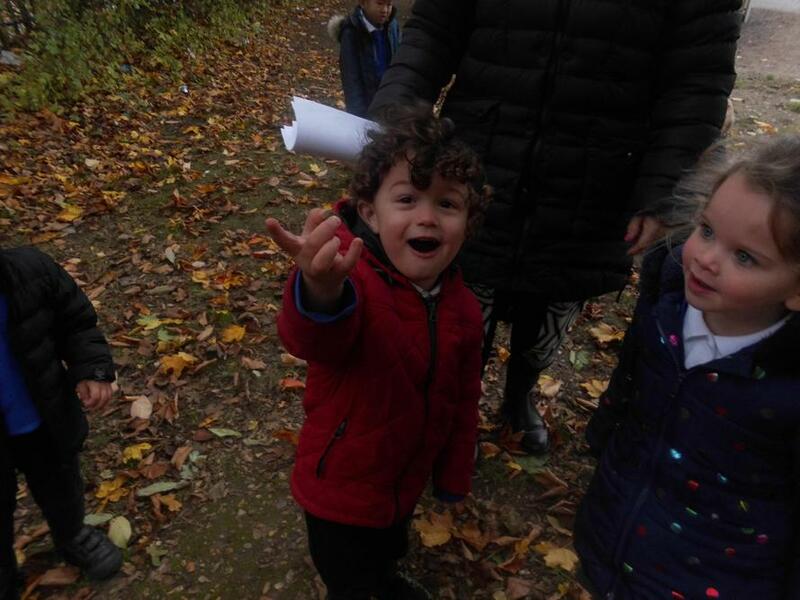 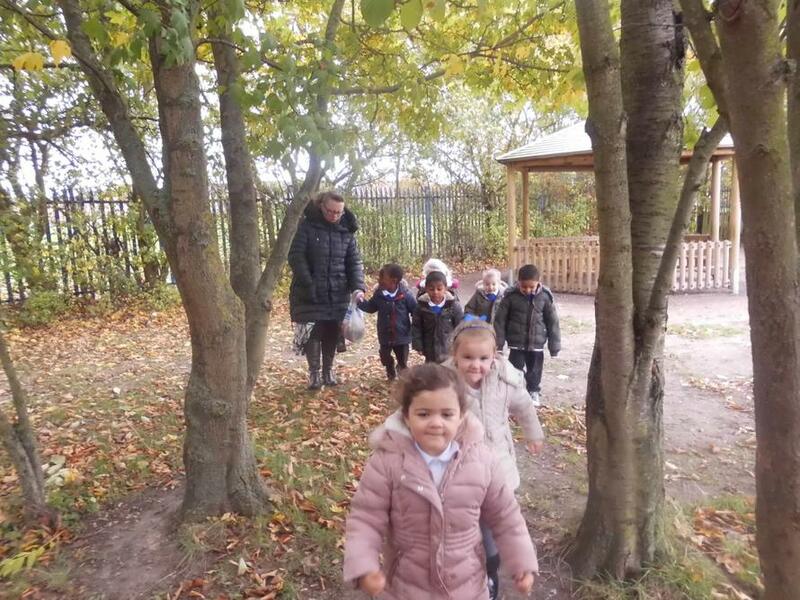 Nursery went on an Autumn walk. 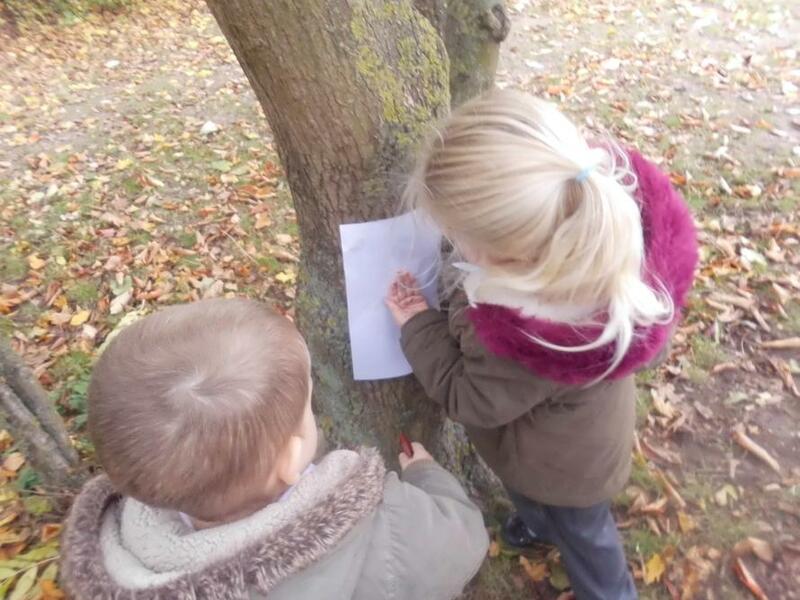 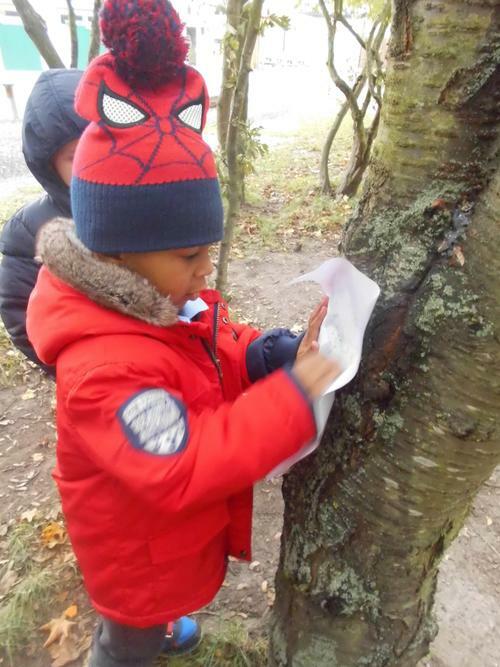 We collected leaves for our class sensory tray and made bark rubbings! 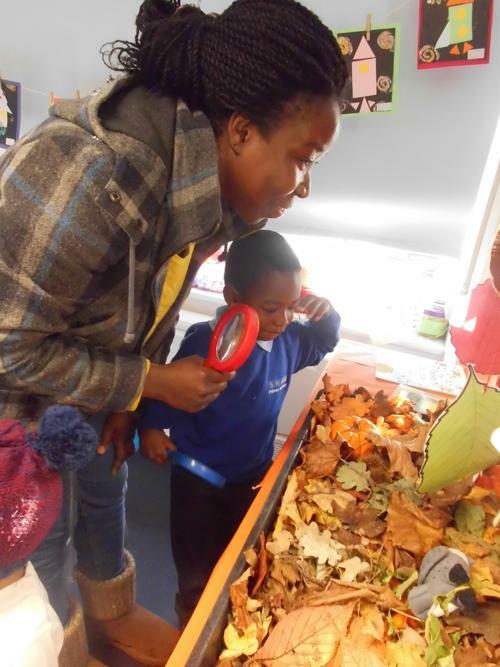 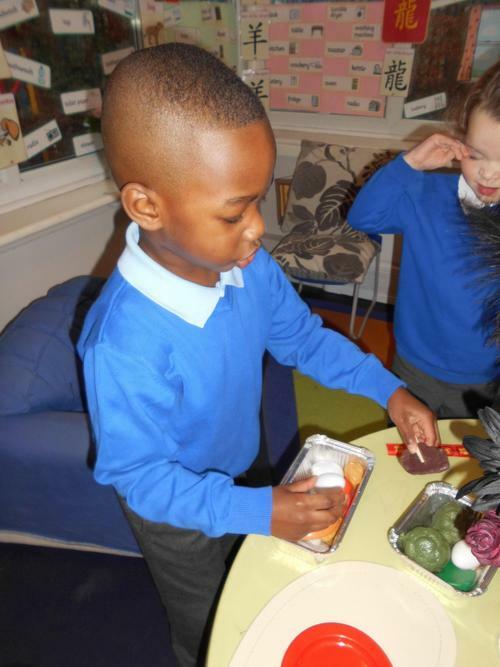 Nikol investigates the different fruits and veg! 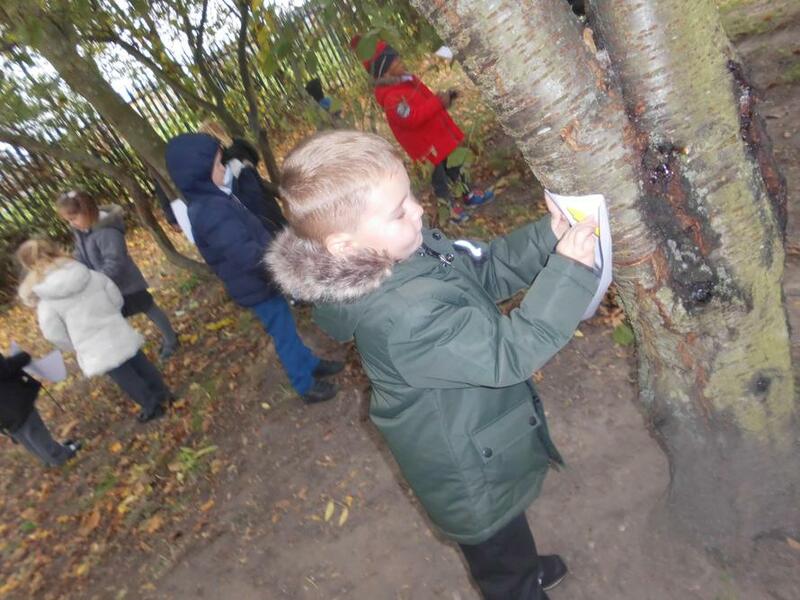 Nikol counted the conkers 1,2,3,4,5,6,7,8! 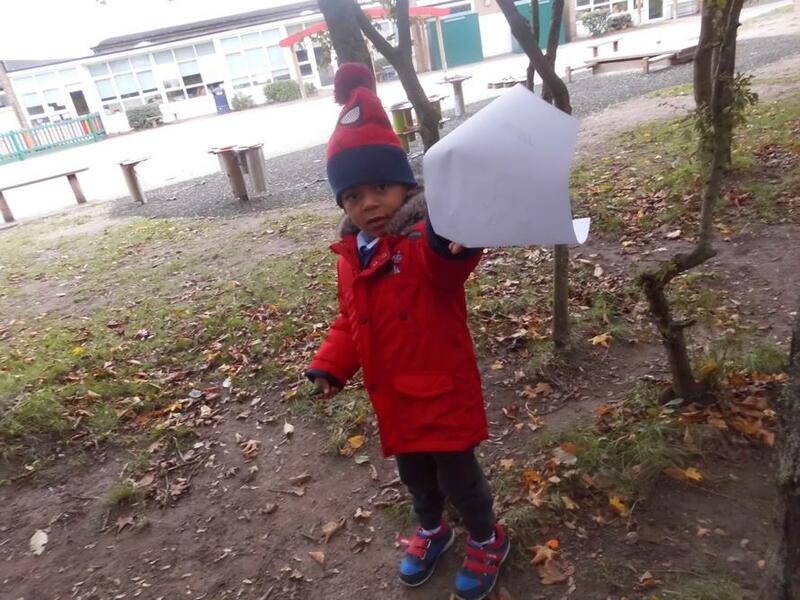 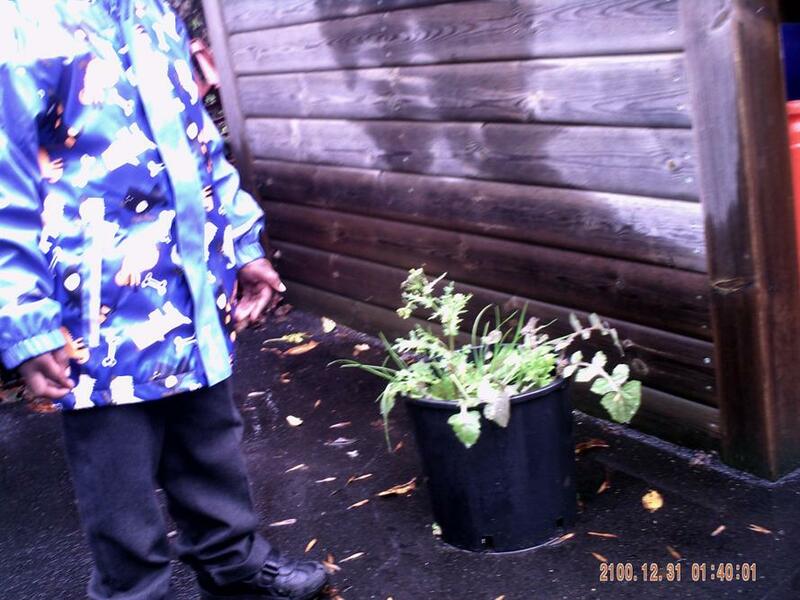 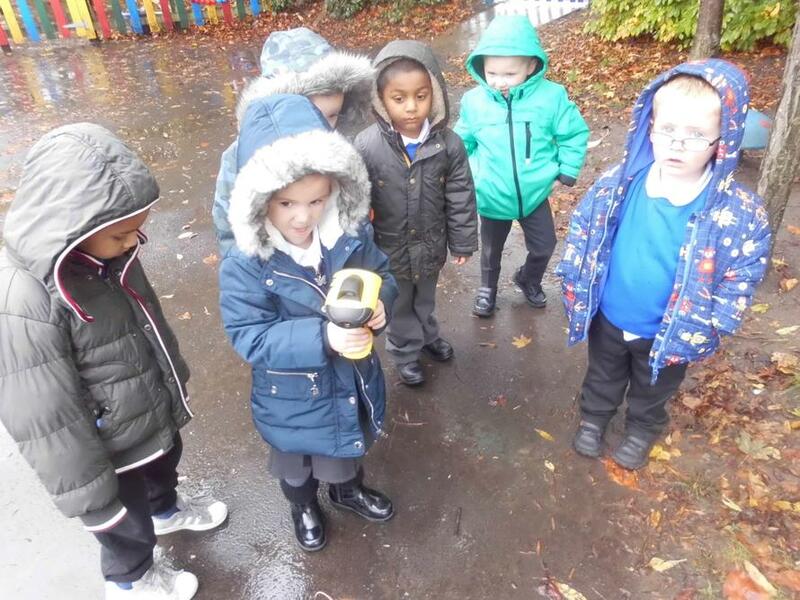 We went on a shape walk and the children used the tough cams to take pictures of the shape they found! 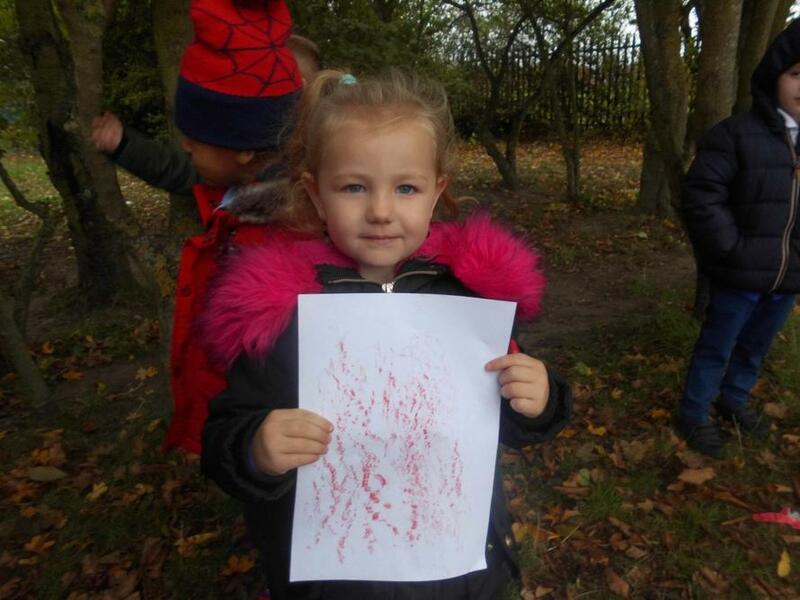 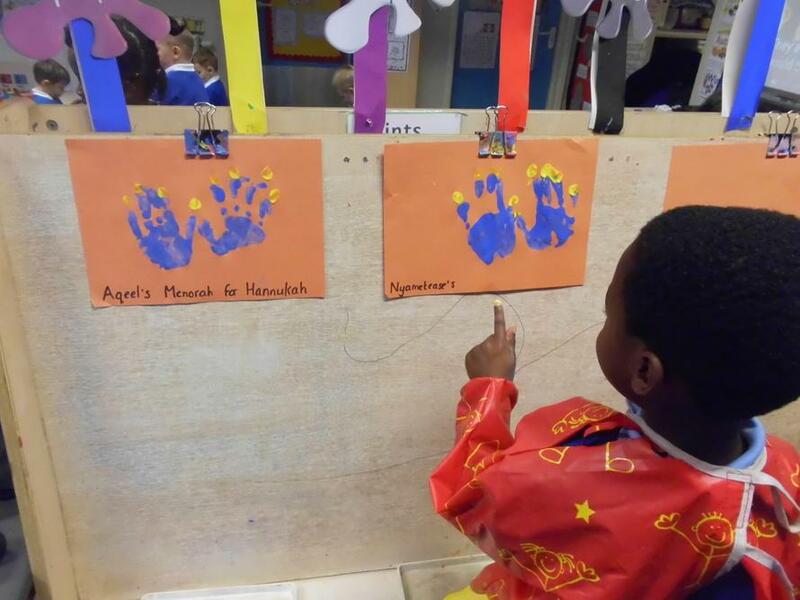 We have been doing lots of activities about our story,The Litle Red Hen and about Divali and fireworks too! 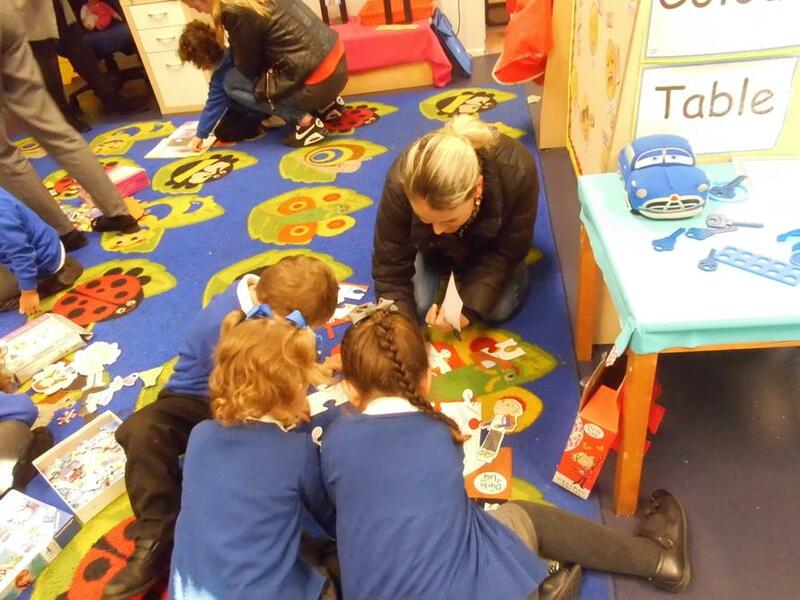 Here are some pictures of us busy at work! 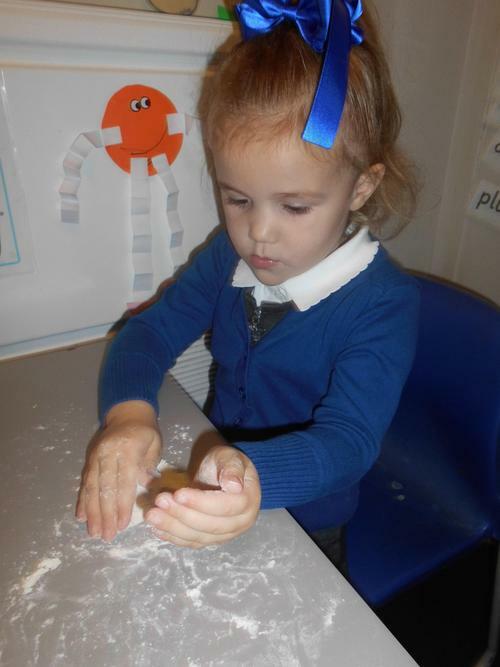 Kylie carefully cutting her puppet out! 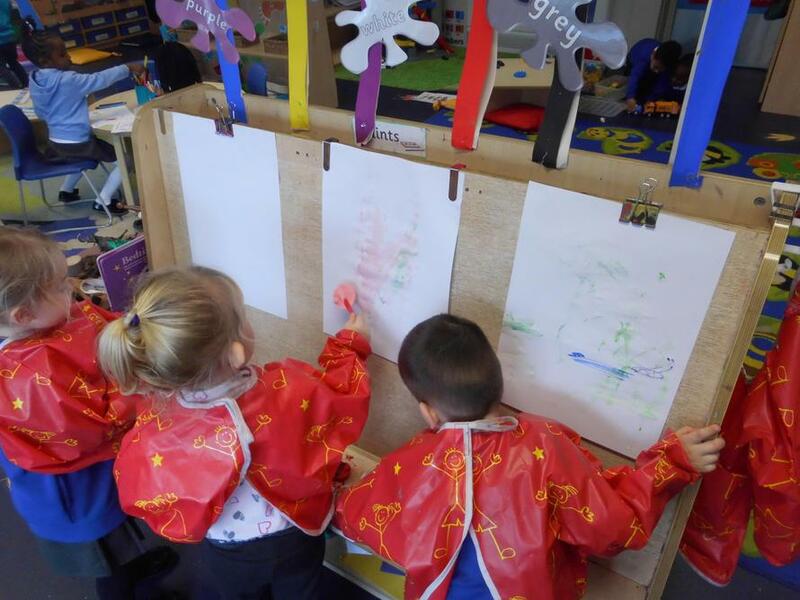 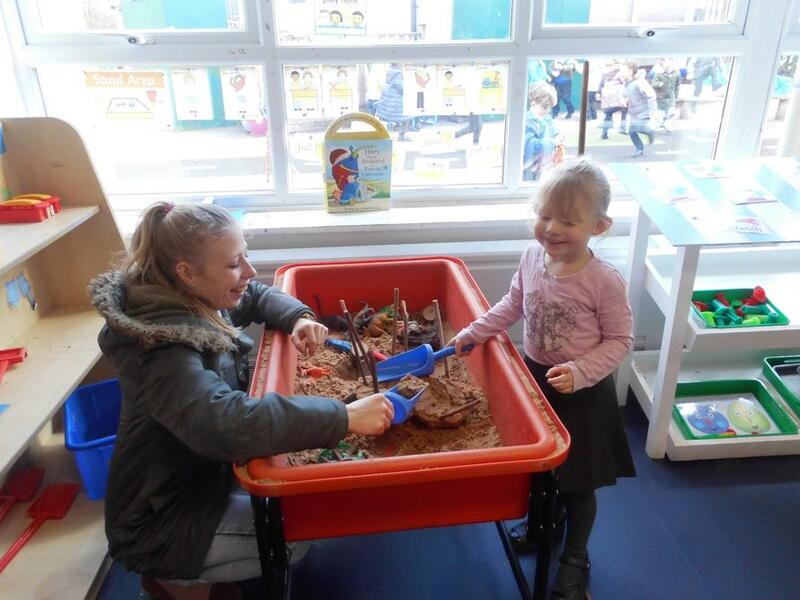 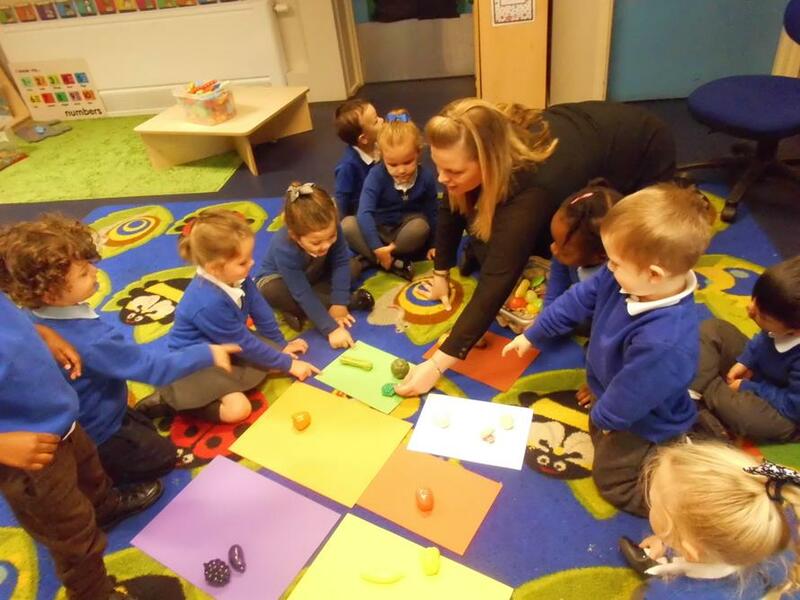 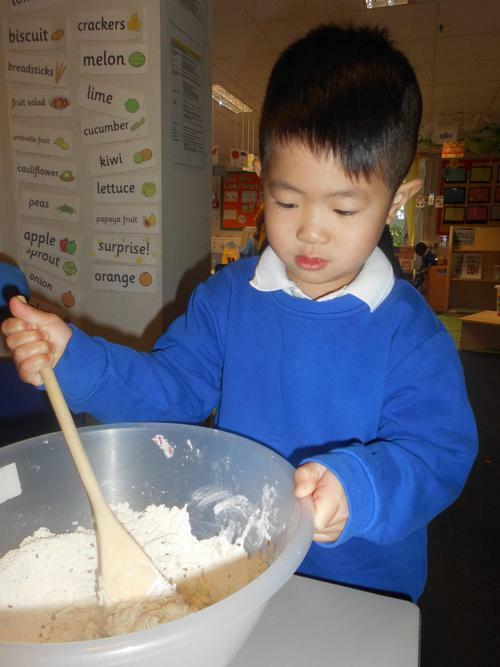 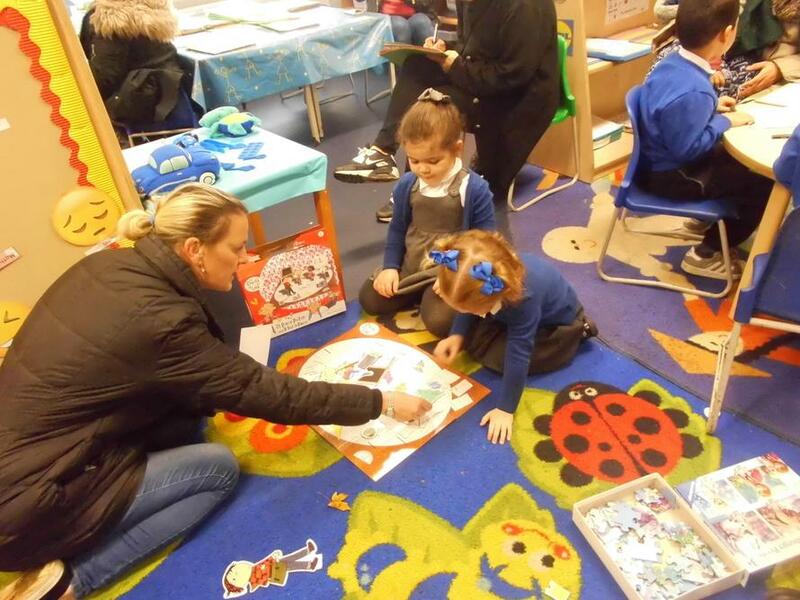 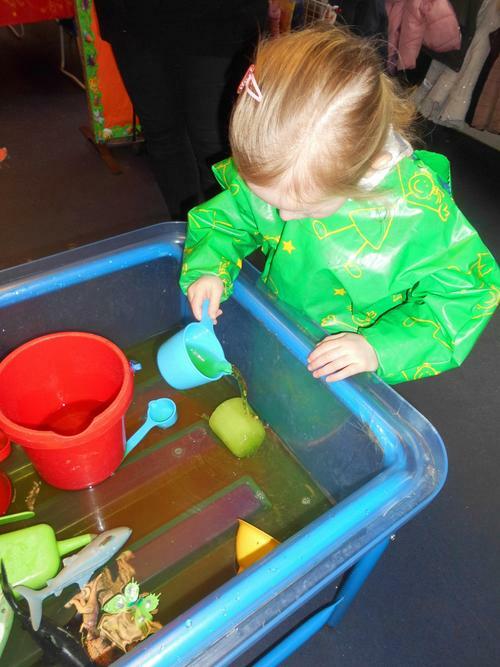 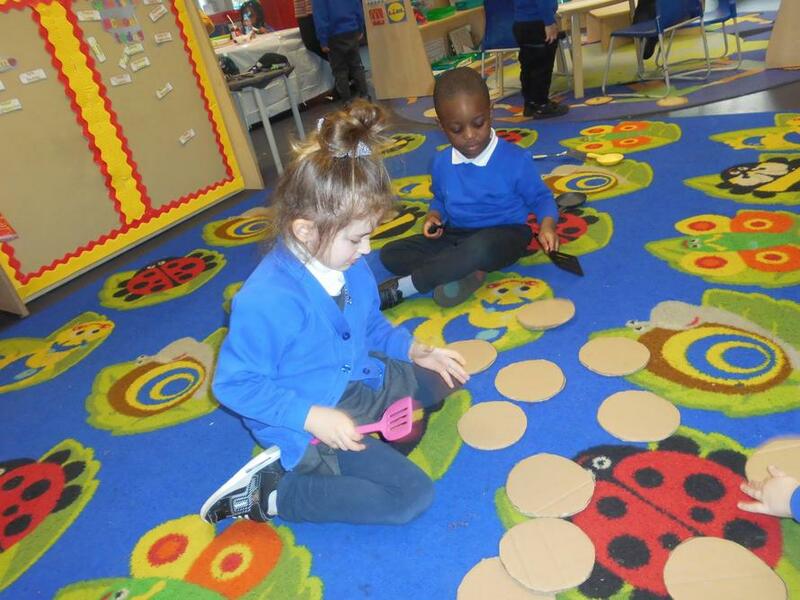 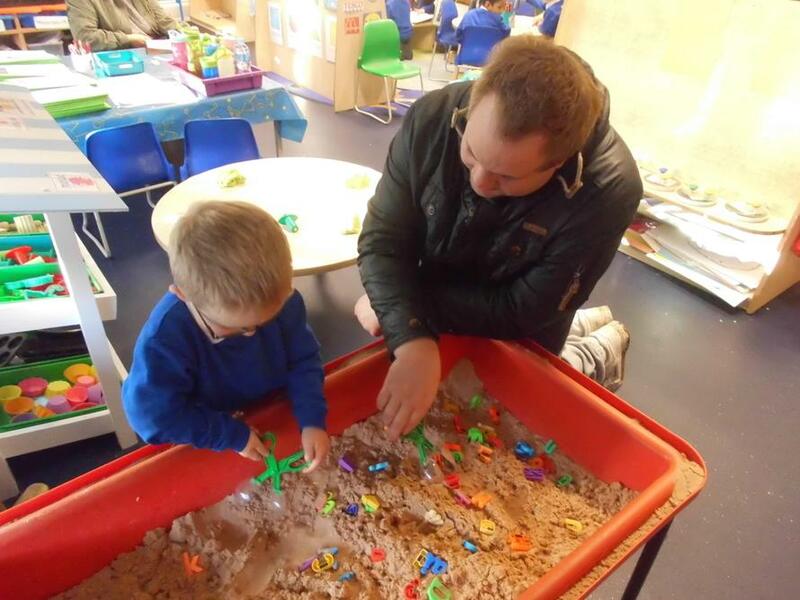 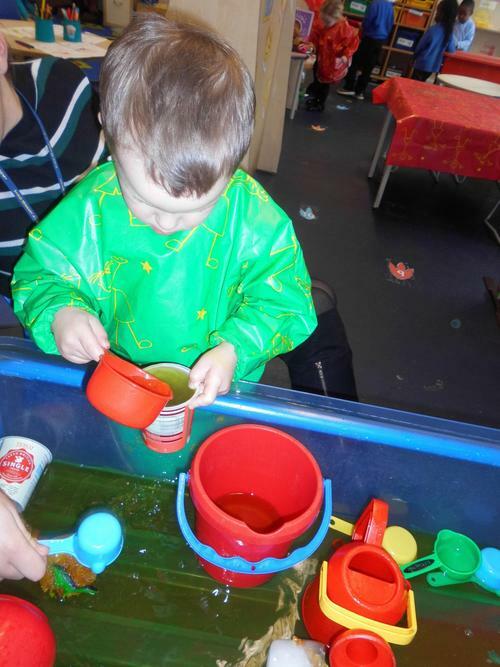 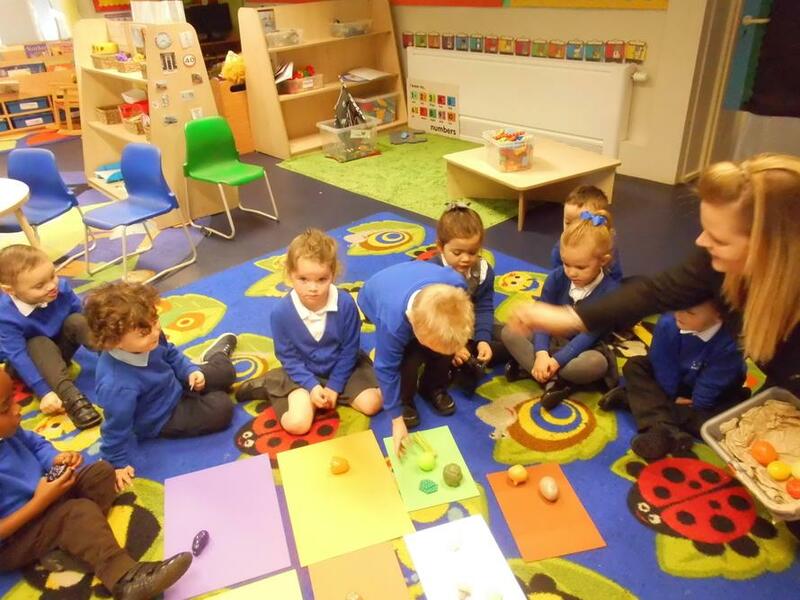 We have been really busy over the past few weeks in Nursery, learning lots through our play and activities. 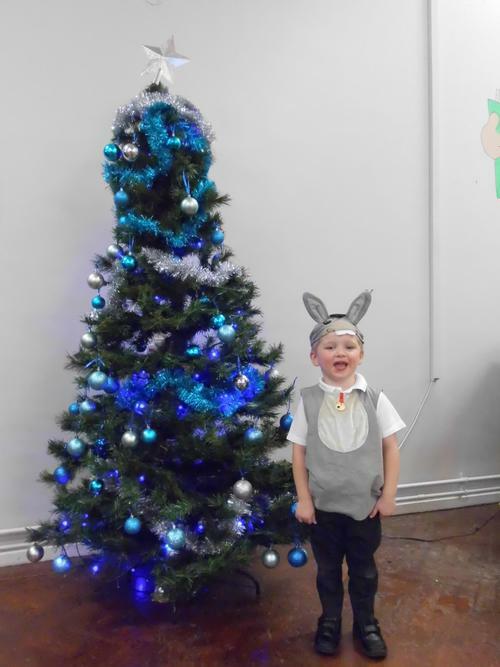 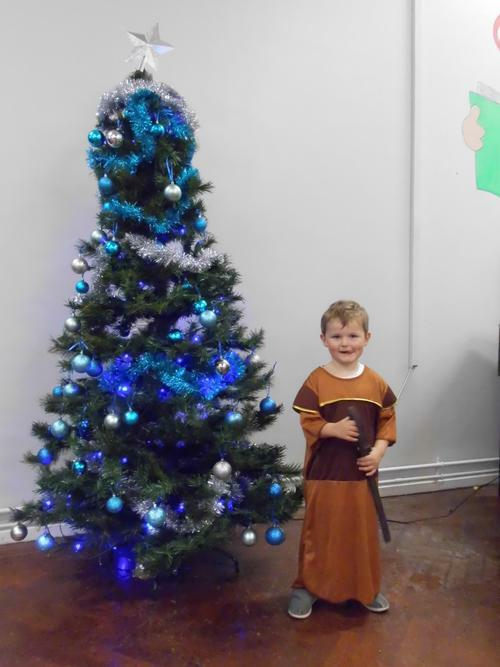 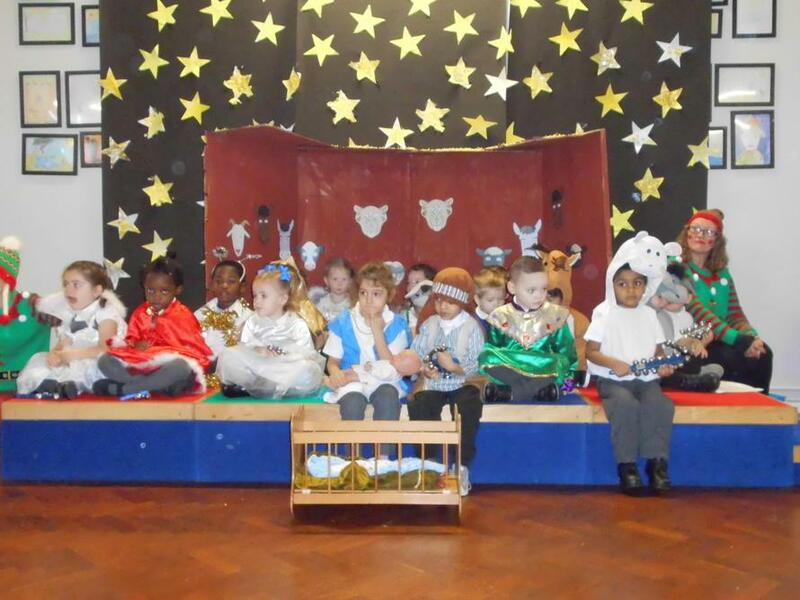 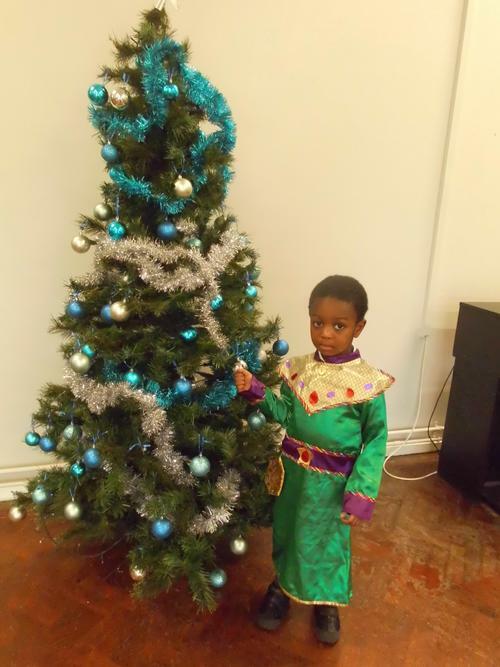 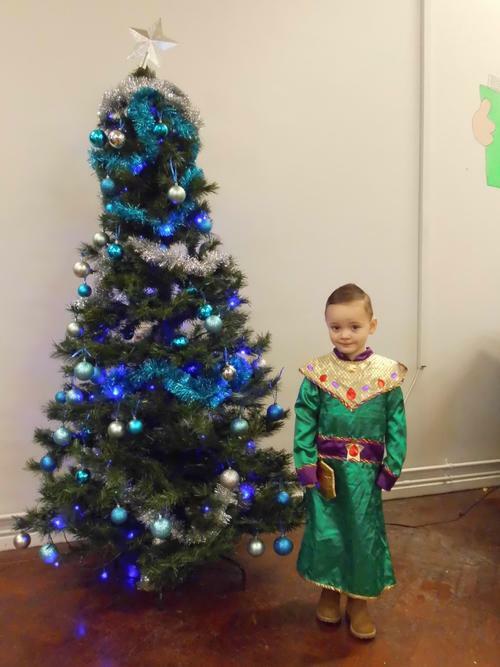 On 4th December we performed our Christmas production called 'The naughty elves' with both reception classes. 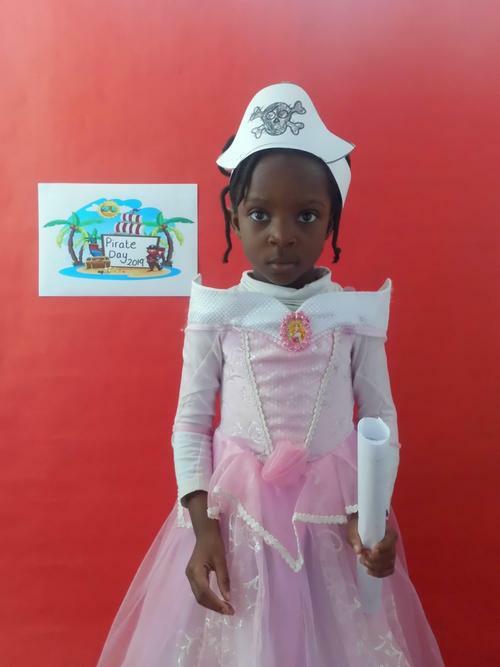 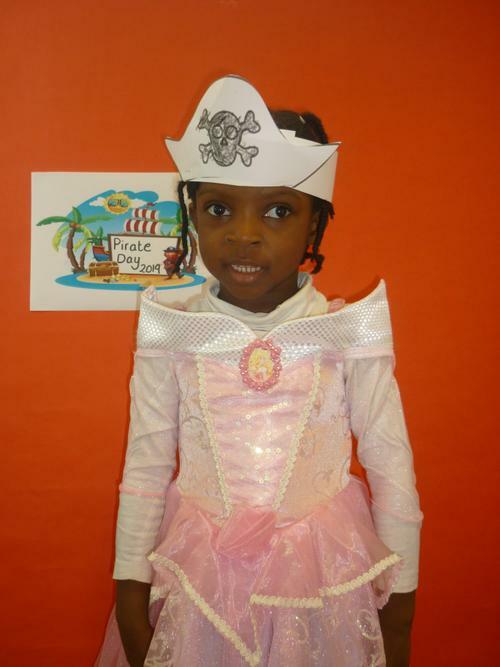 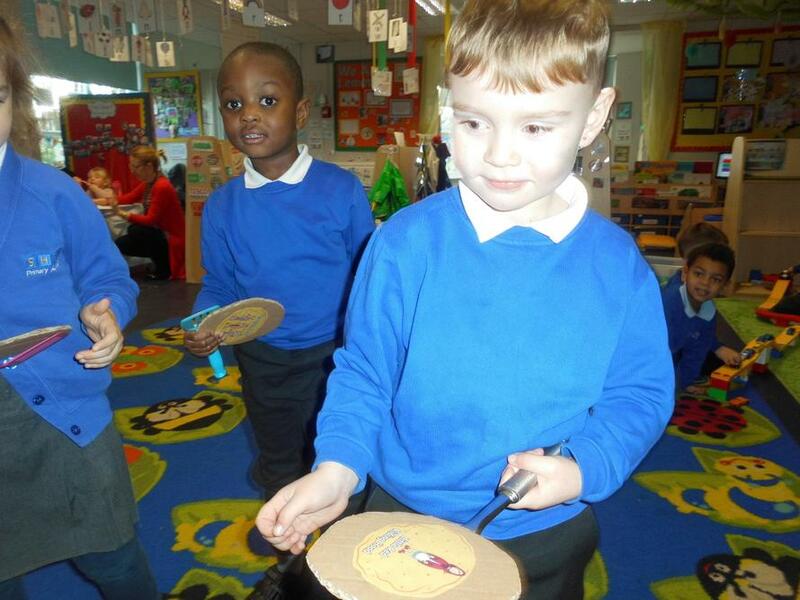 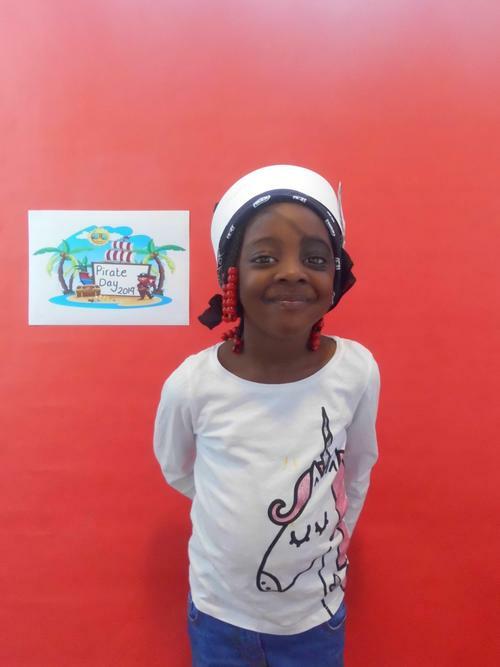 we had lots of songs to learn and we had special costumes to wear. 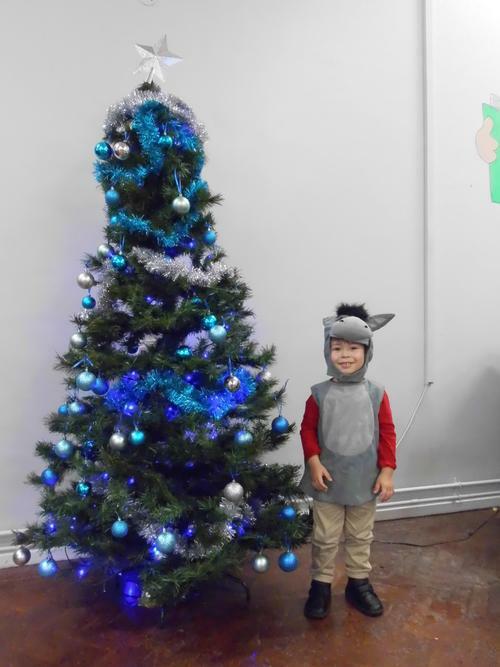 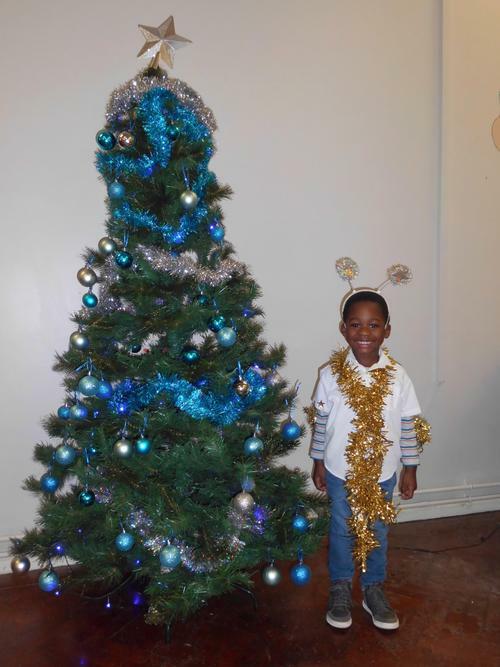 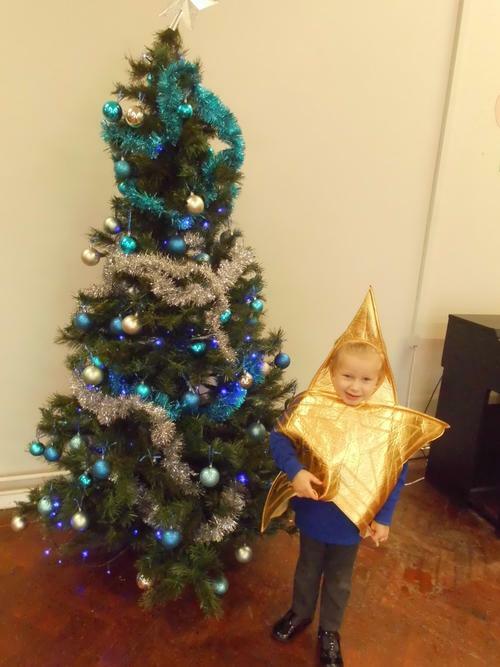 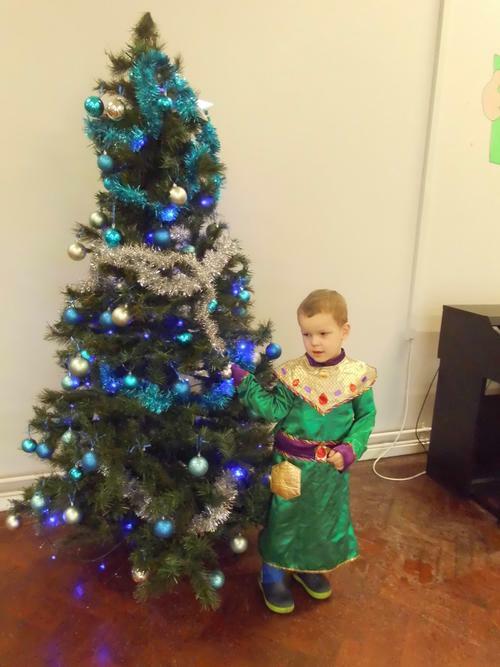 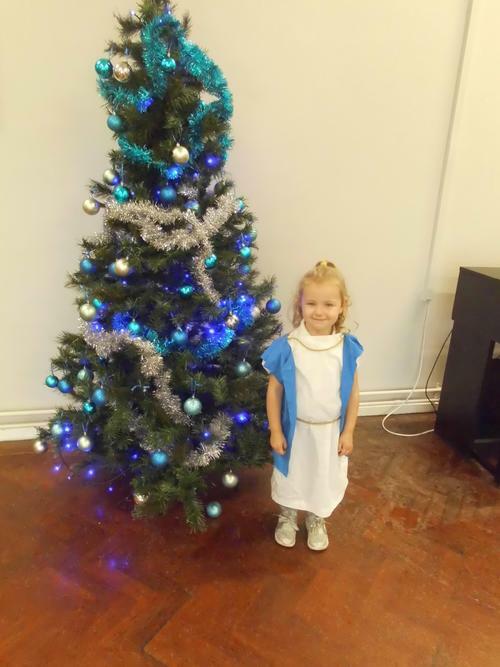 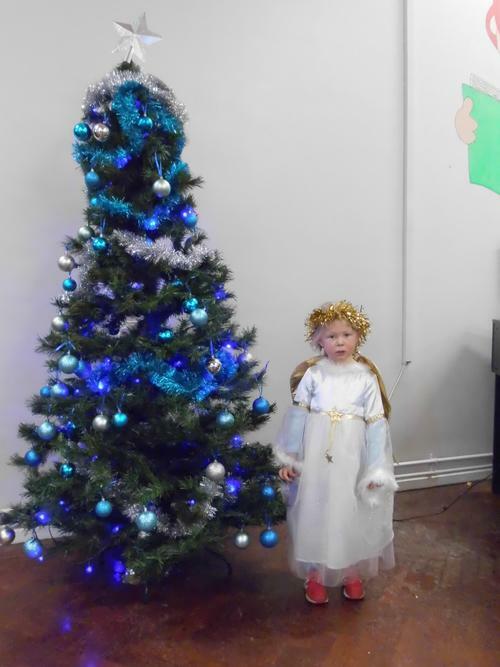 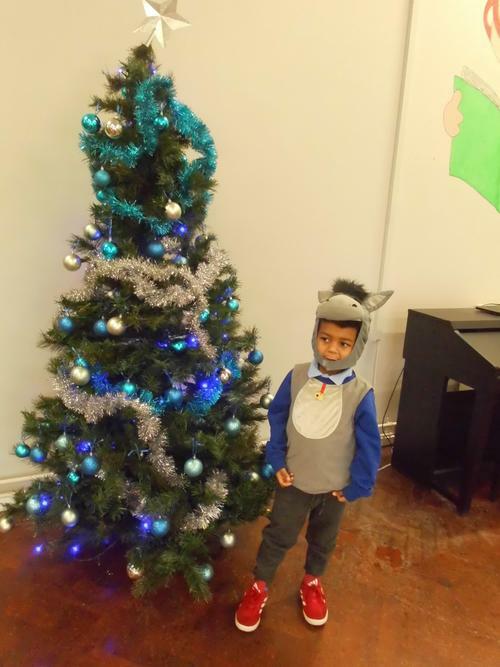 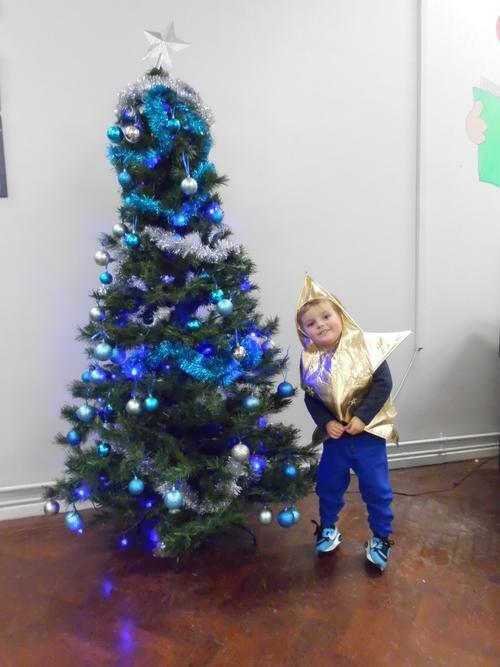 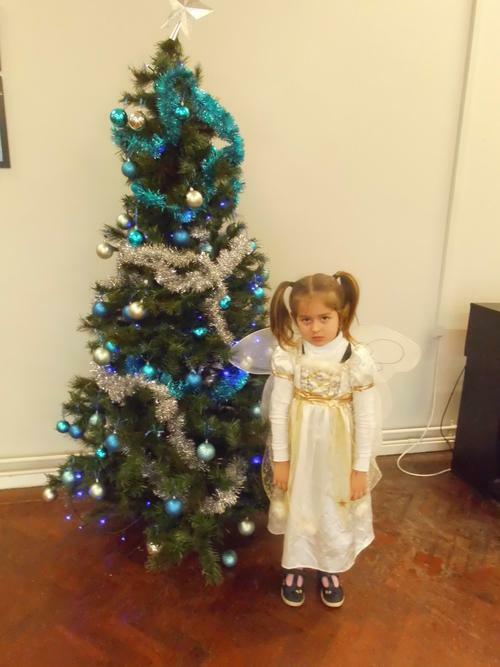 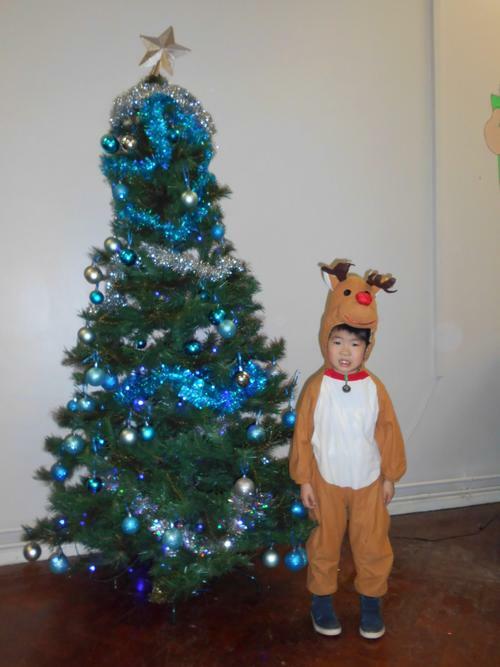 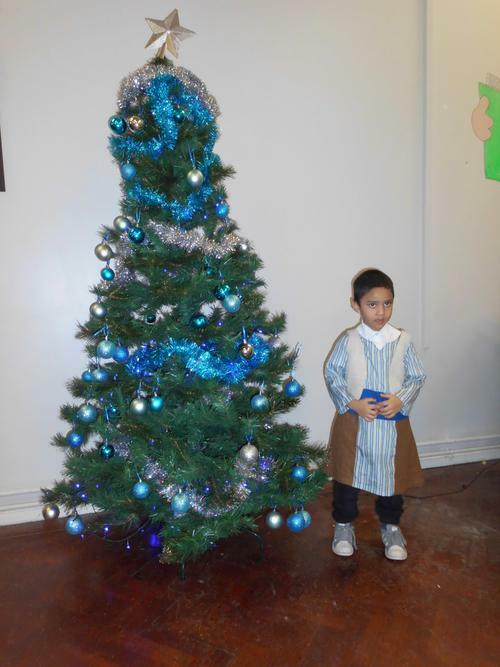 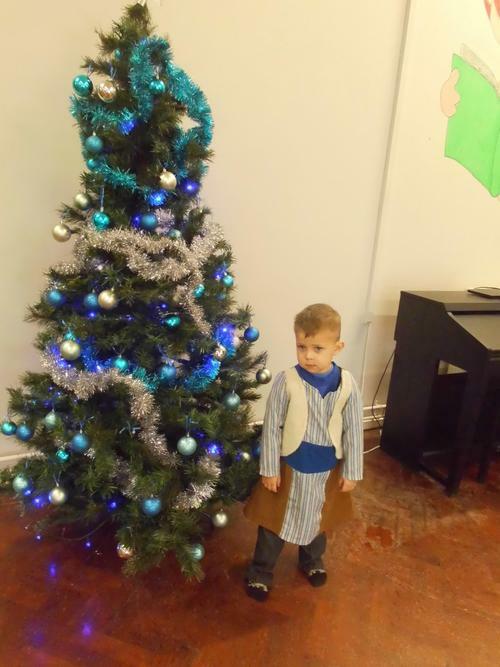 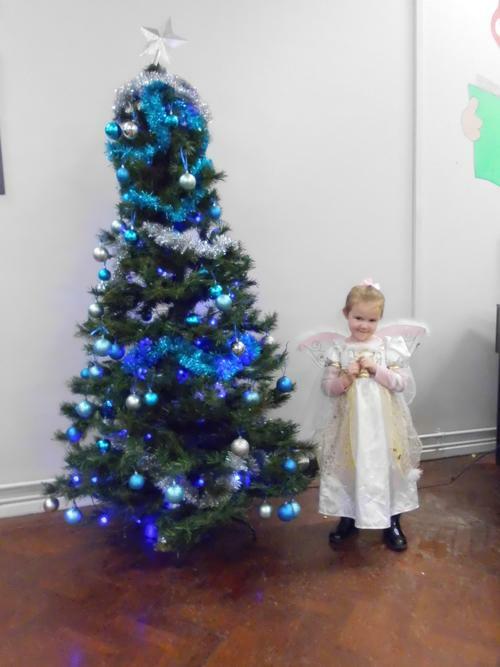 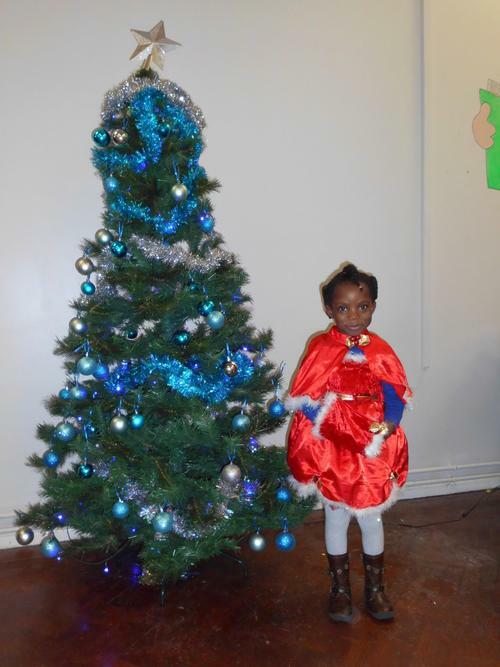 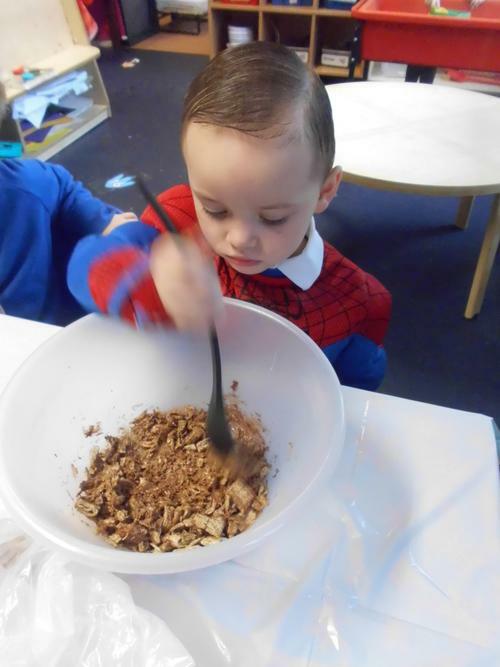 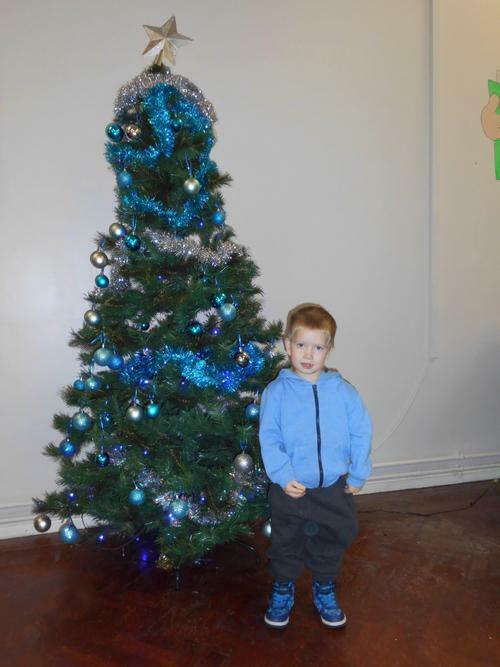 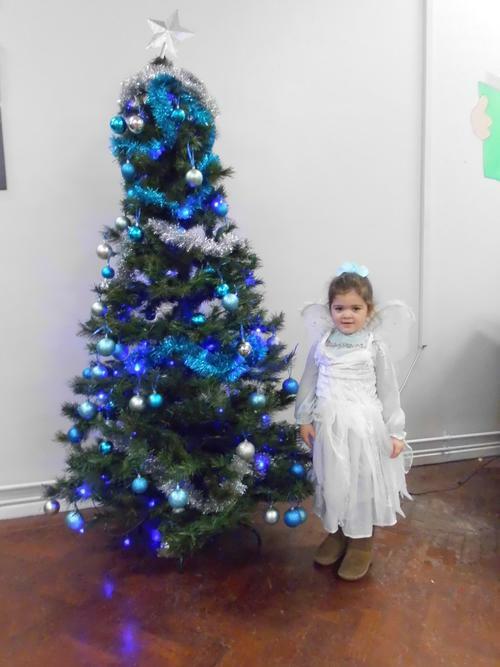 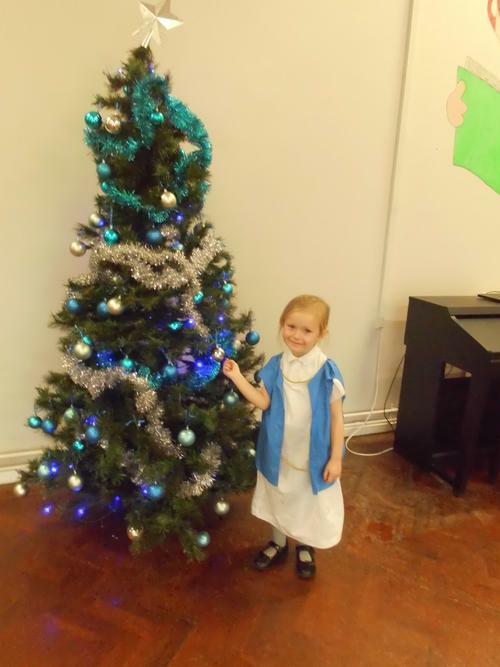 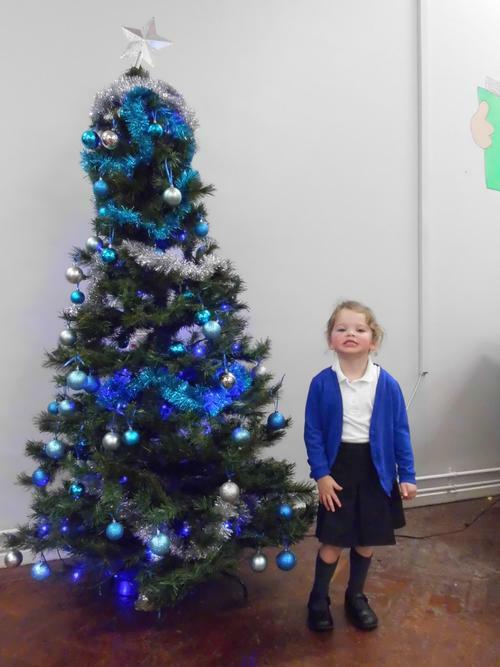 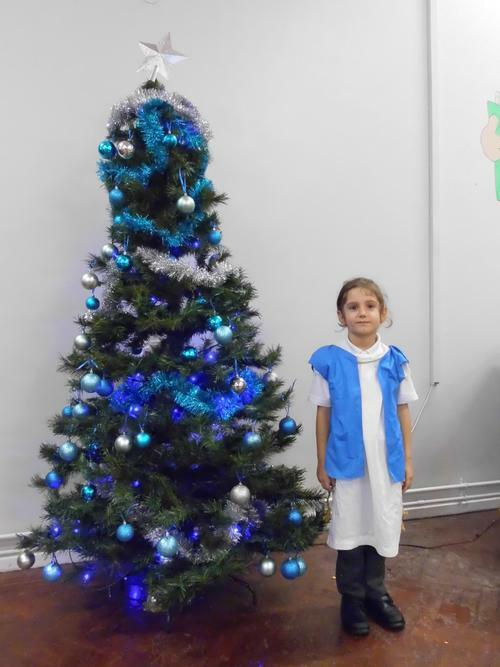 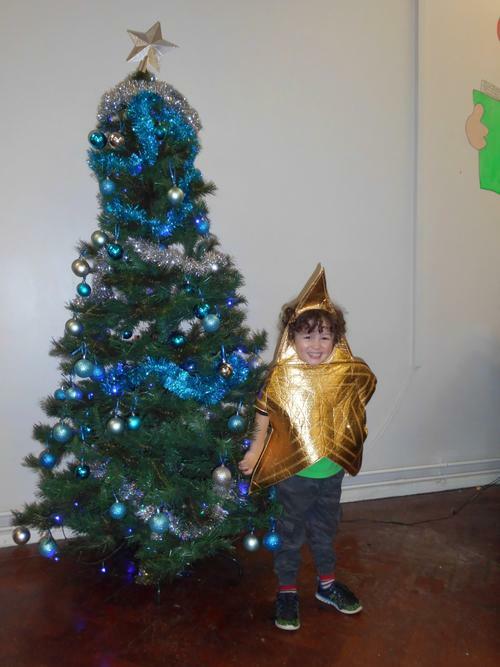 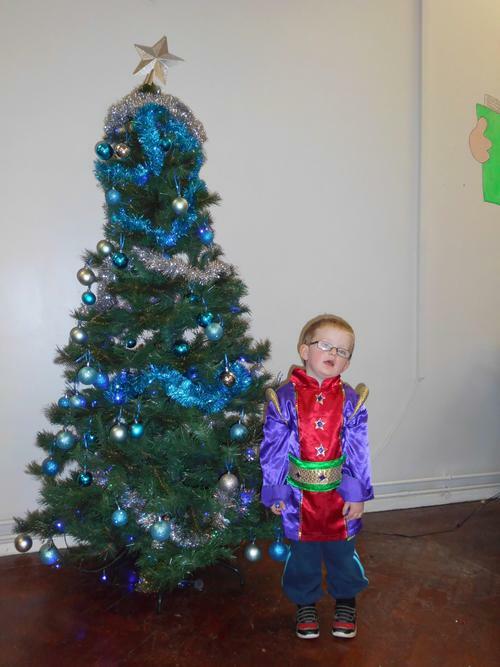 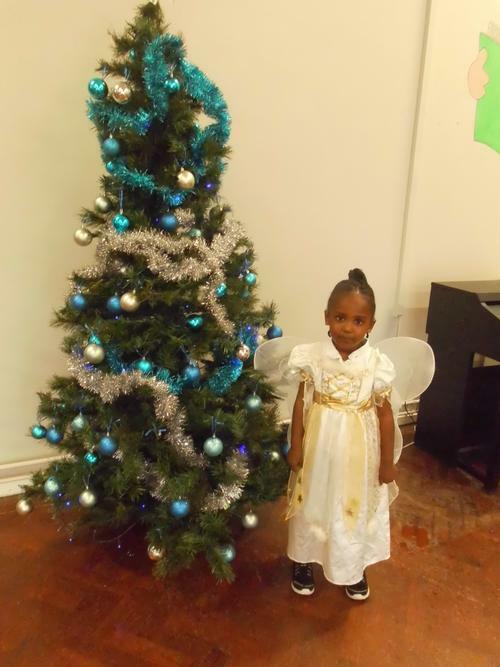 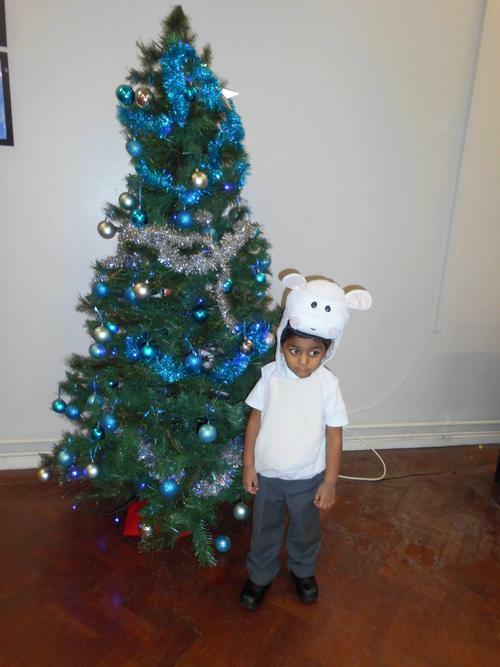 Some of the photos below show you the activities we have been doing in Nursery and our Christmas production. 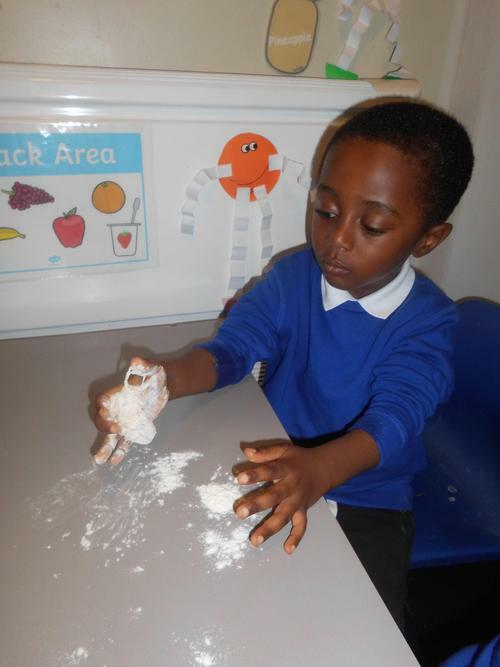 This term our topic is 'Dinosaurs' and we will be learning lots about them! 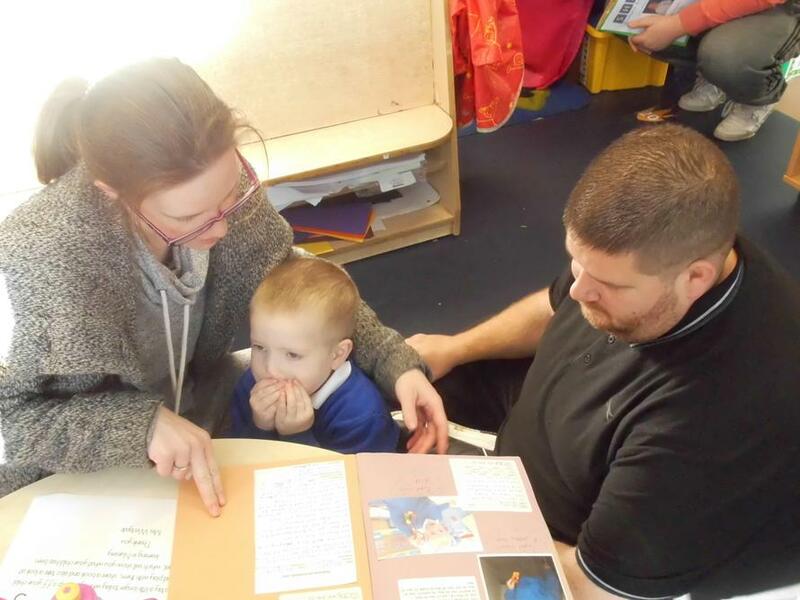 We will be reading the stories in the 'Harry and his bucketful or dinosaurs' collection as well as stories like 'Dinosaurs love underpants' by Claire Freedman & Ben Cort, 'Tyrannosaurus drip' by Imelda Staunton and 'Dinosaur Roar!' 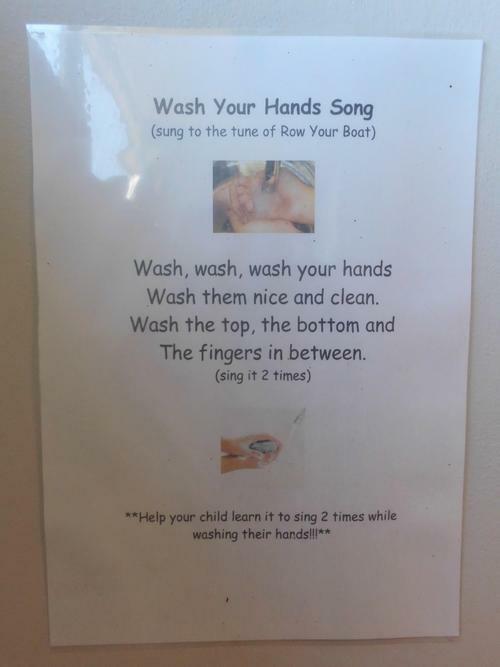 by Paul & Henrietta Stickland. 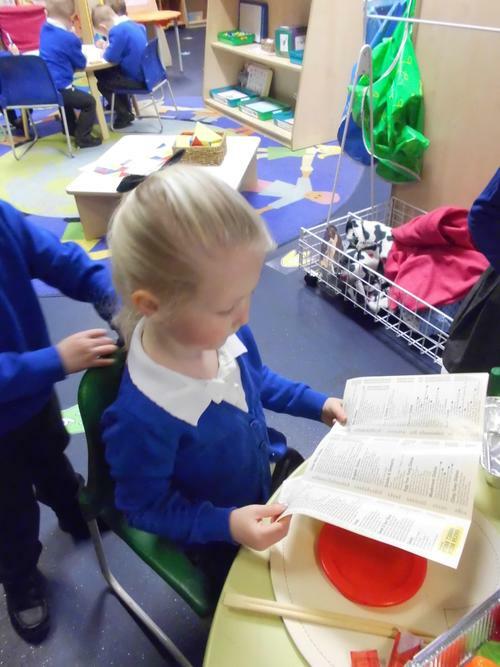 We will be using what we learn from our reading activities to help us with making up our own stories for storytelling. 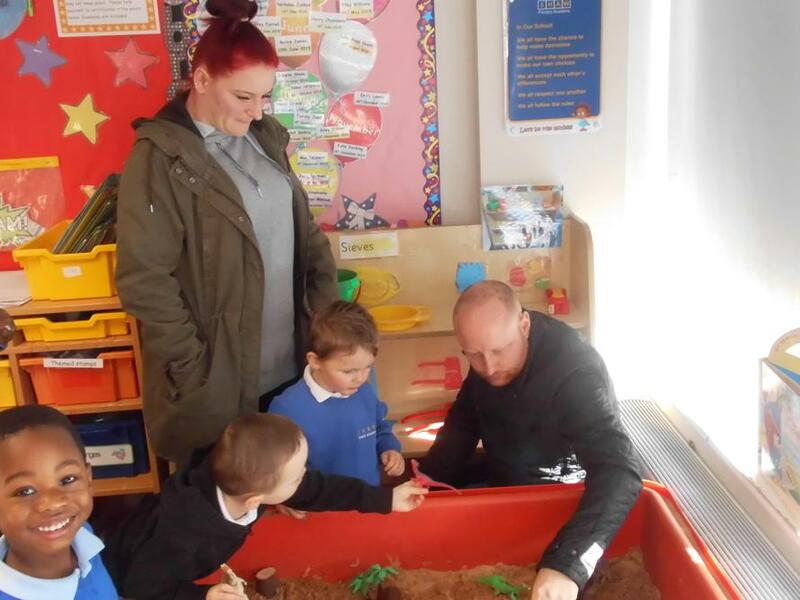 Dinosaur visit to Shaw Primary Academy! 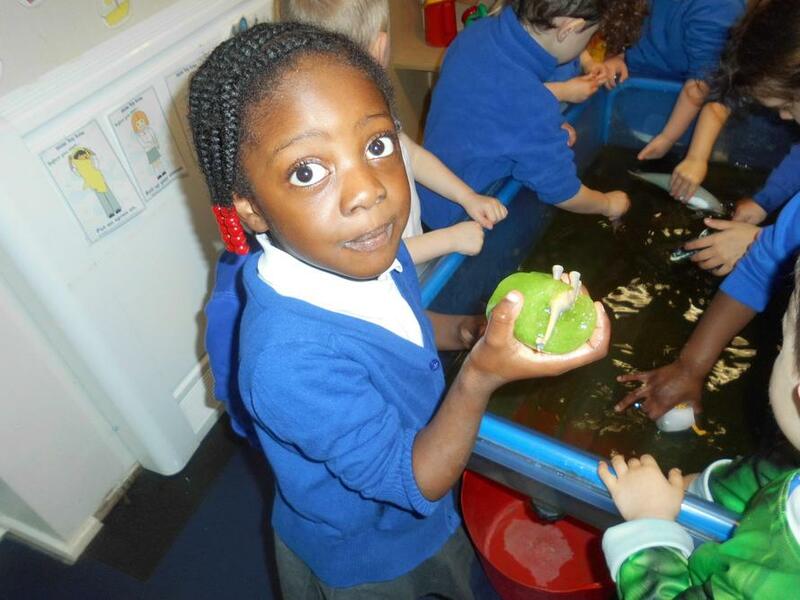 We found some dinosaur eggs in our Nursery! 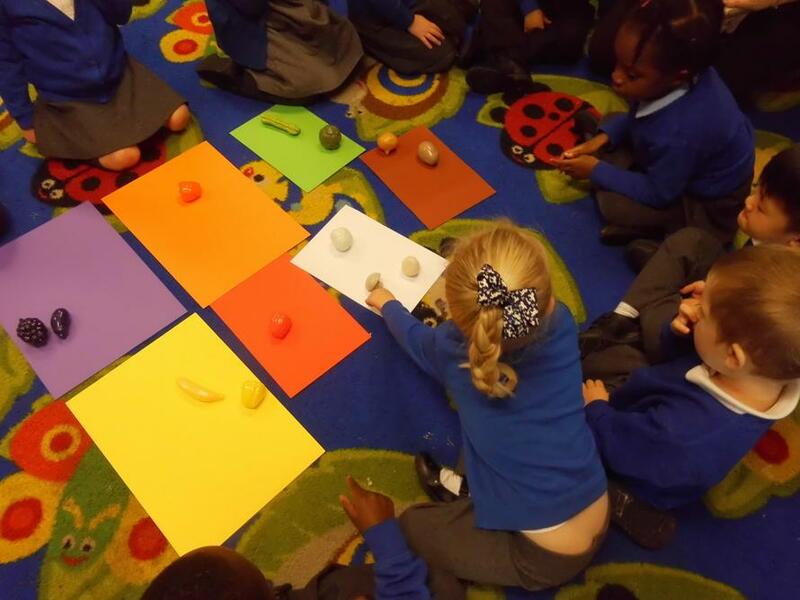 The eggs were pretty colours in a nest. 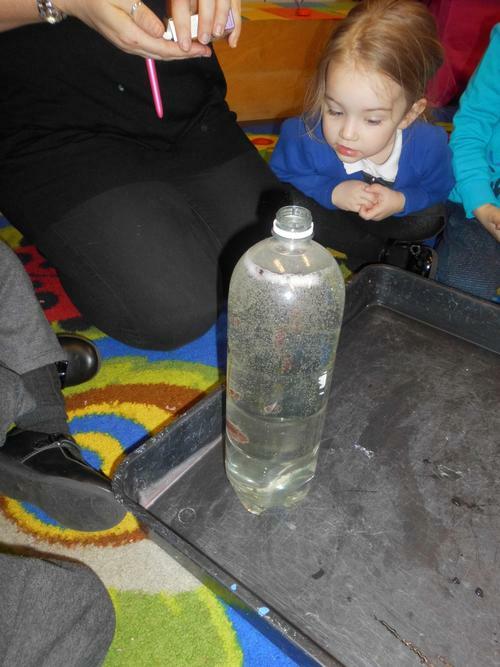 The children were very curious how they got there? 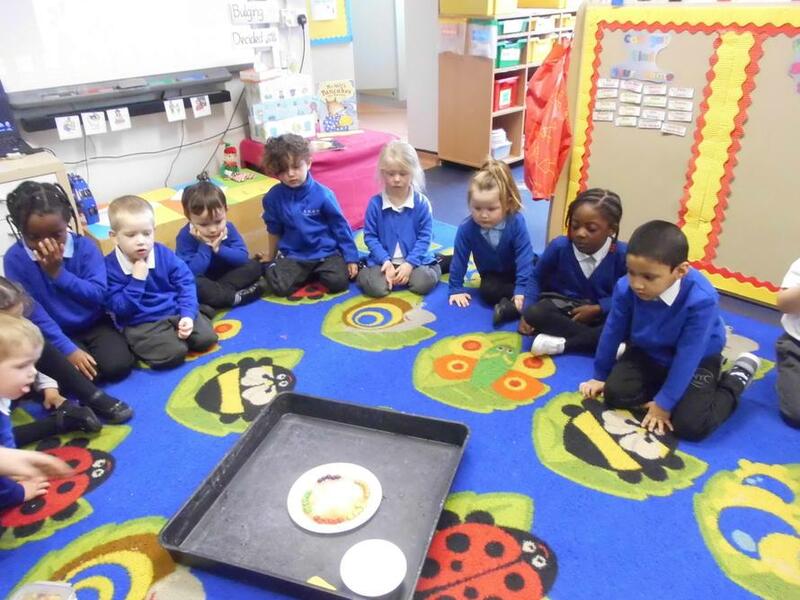 The eggs created alot of discussion! 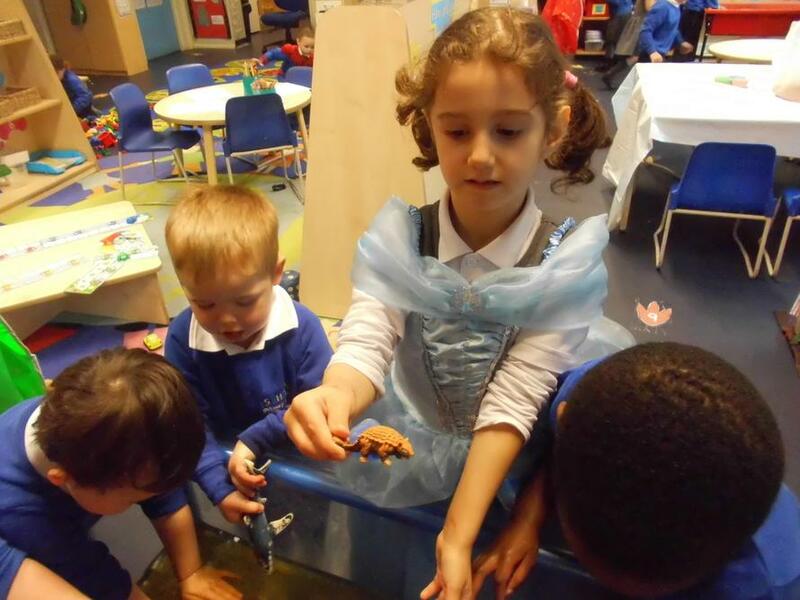 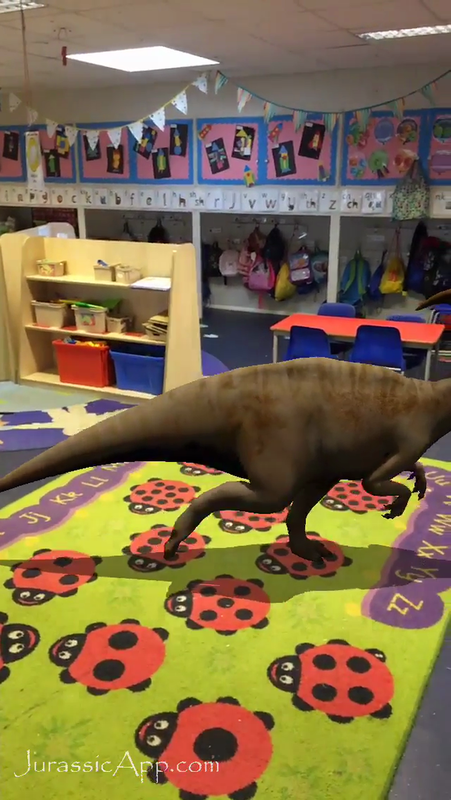 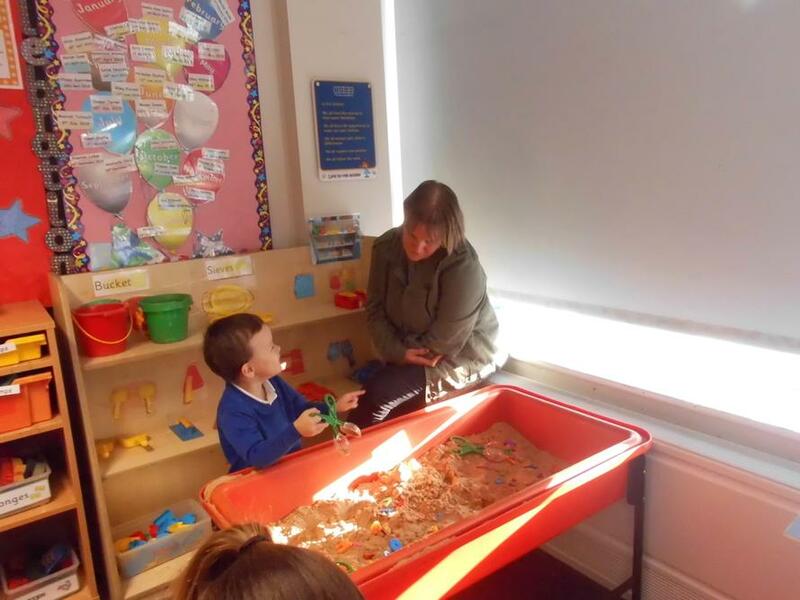 A dinosaur was spotted in Reception class! 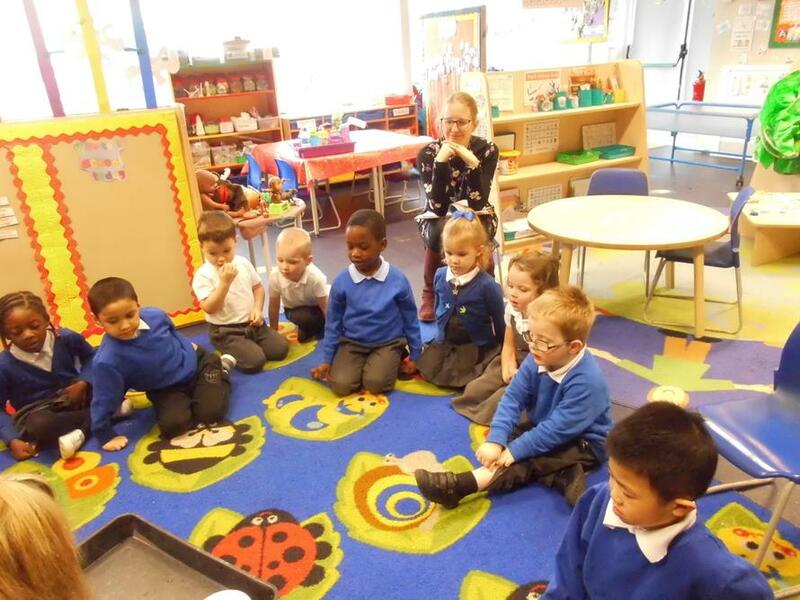 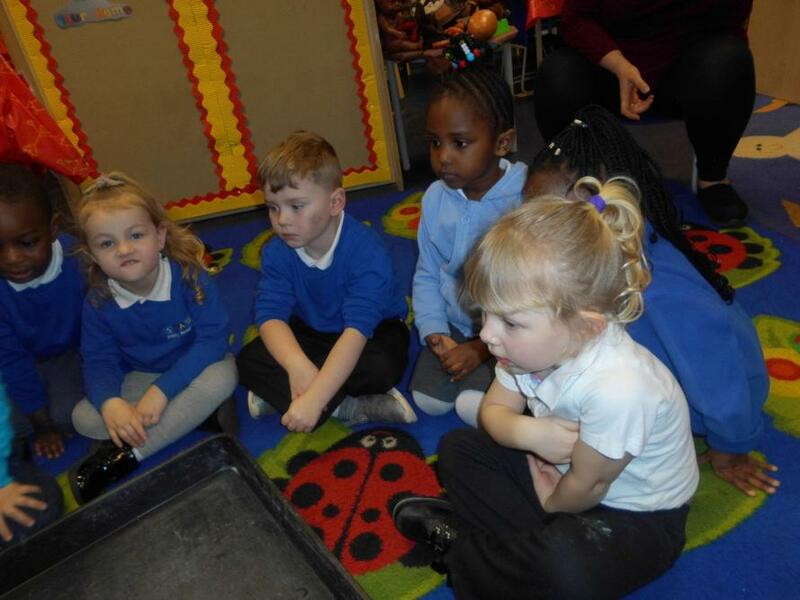 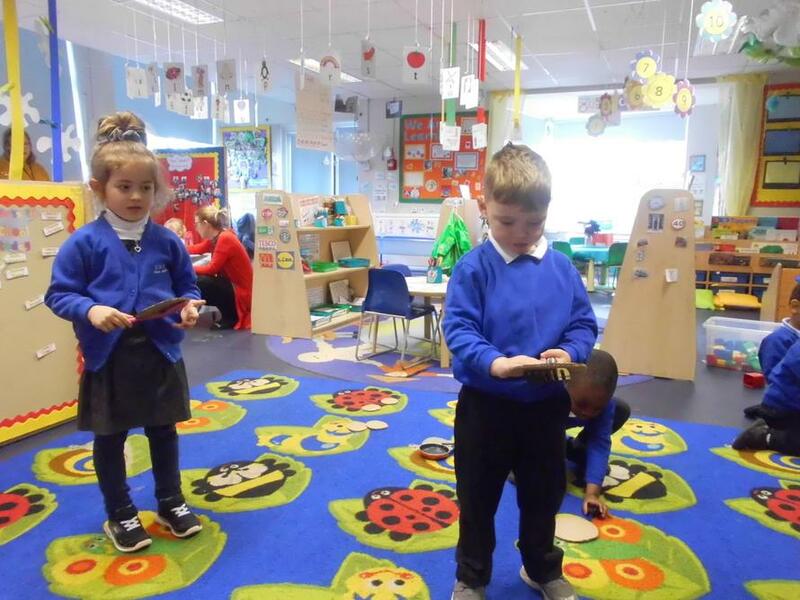 We were confused as to where the eggs in Nursery had come from so we asked Mr Anderson the caretaker to check his cameras and he came across this video from class RS! 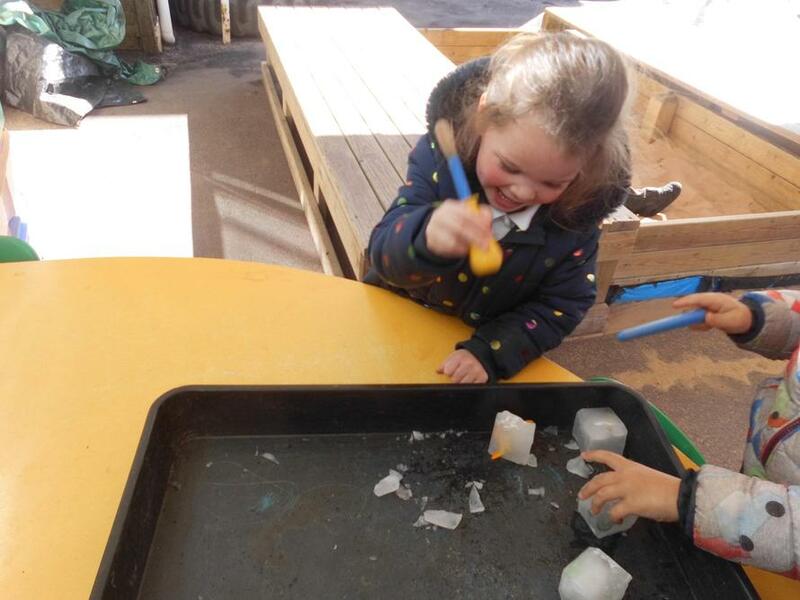 We decided to cover the eggs with blankets to keep them warm and some of the children made 'fans' from construction toys to keep the eggs cool. 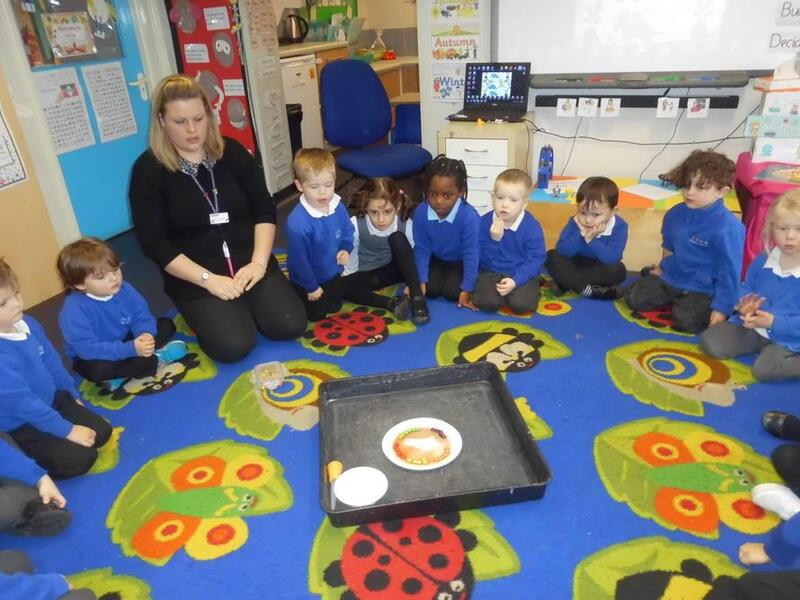 During a class discussion about how we could care for the eggs until the Mummy dinosaur comes back, one of the children suggested 'we can use a little bit of hot and a little bit of cold water to make warm and put the eggs in it'. 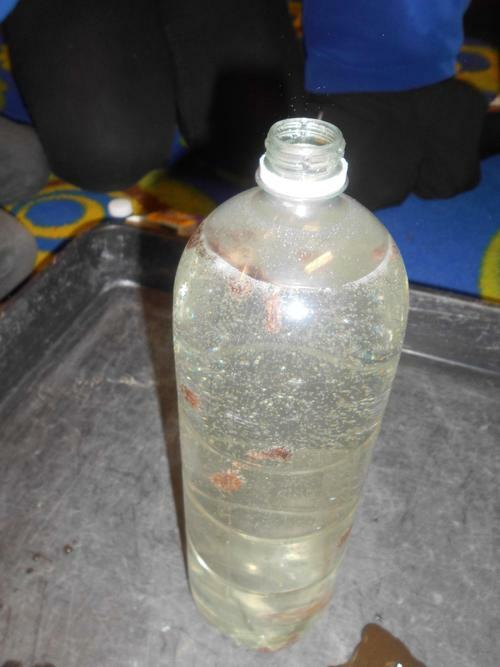 We all decided this was a good idea and filled containers with warm water and put the eggs inside. 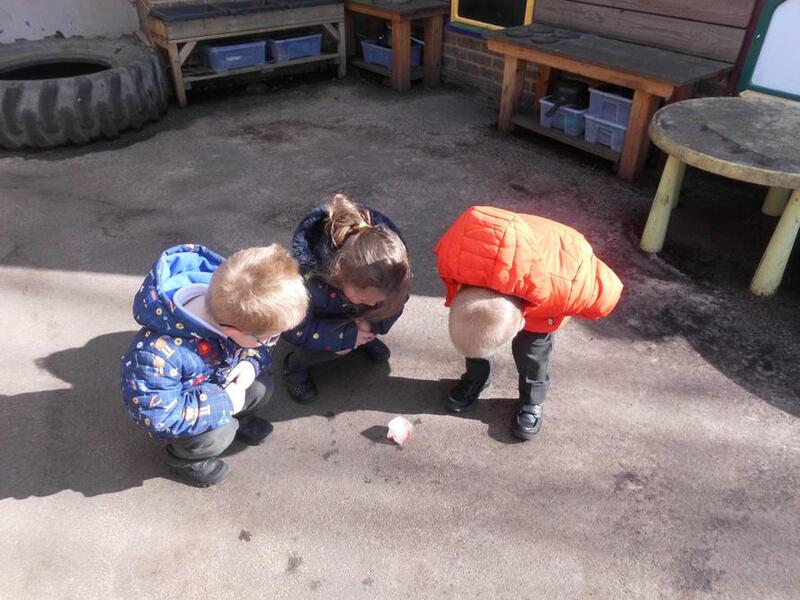 When we returned to school, the eggs had started to crack! 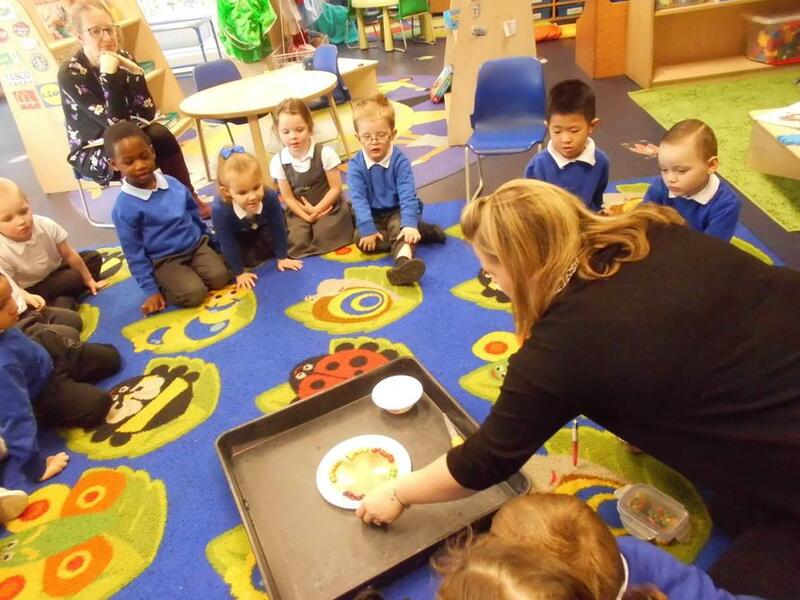 Baby dinosaurs were coming out from the eggs! 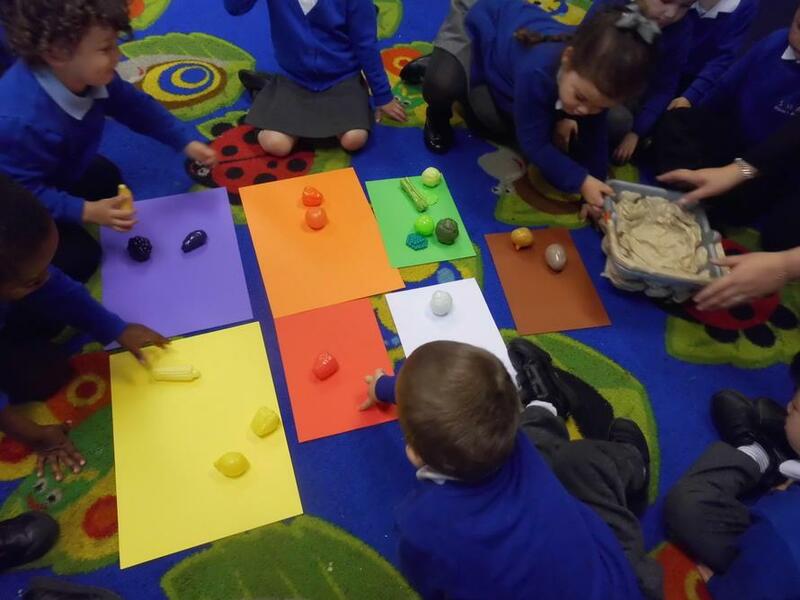 Dinosaurs hatched from the eggs! 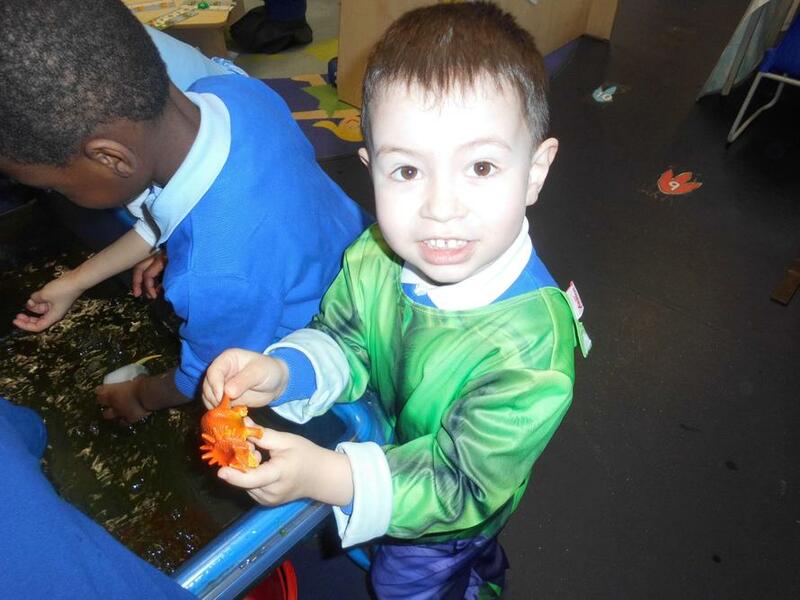 The dinosaurs were all very colourful! 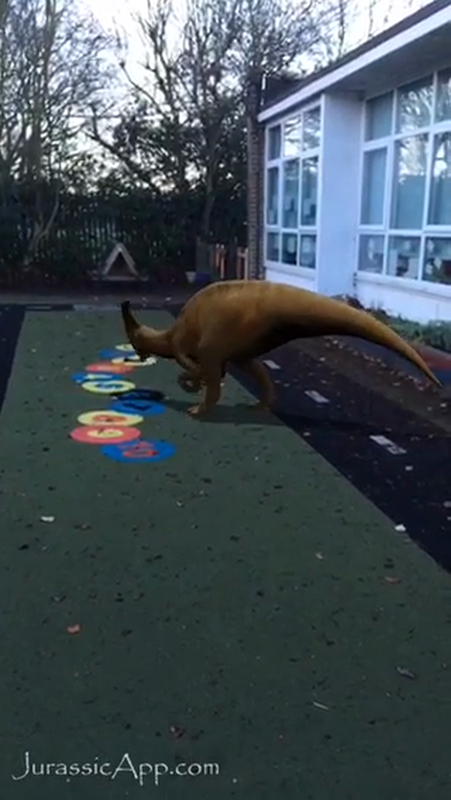 The dinosaur that came to visit us was caled a 'Parasaurolophus'. 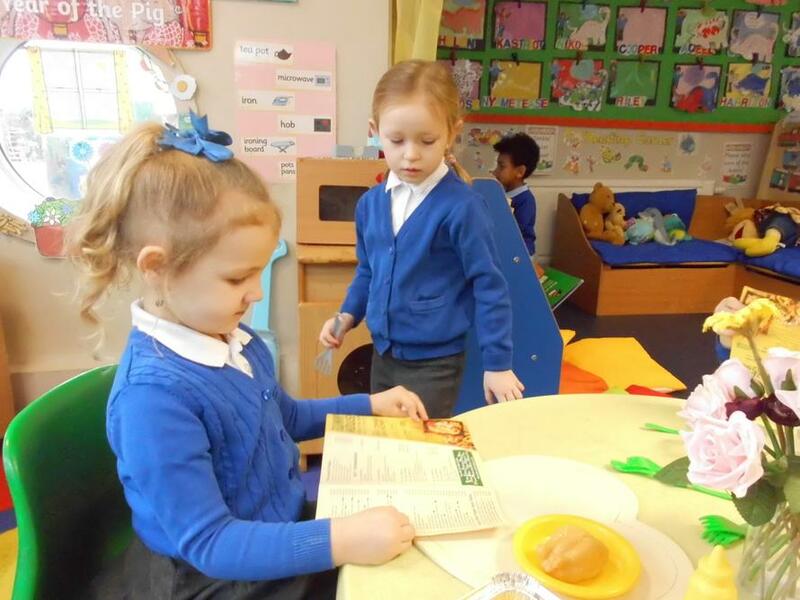 We found out from lots of different books they like to eat plants and love cuddles! 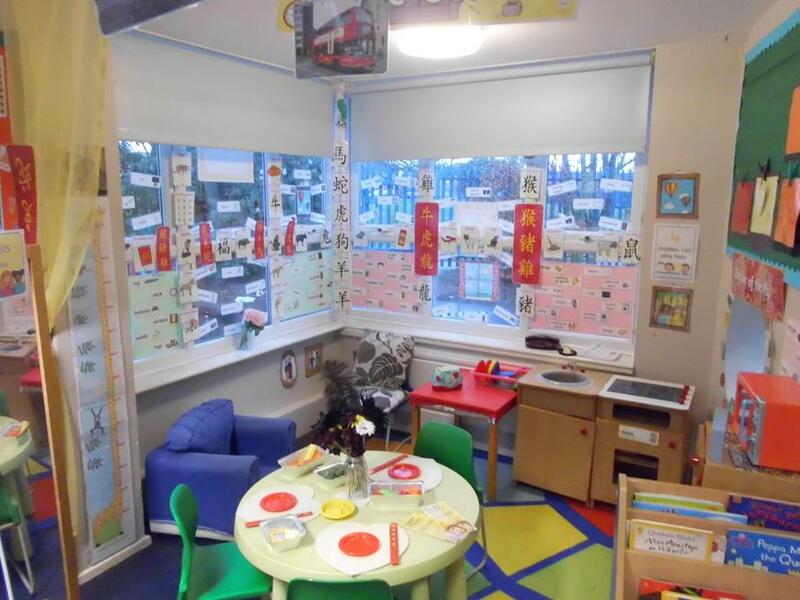 We began learning about Chinese new year from watching a video about a little girl called Abbie on CBeebies who showed us how she and her family celebrate. 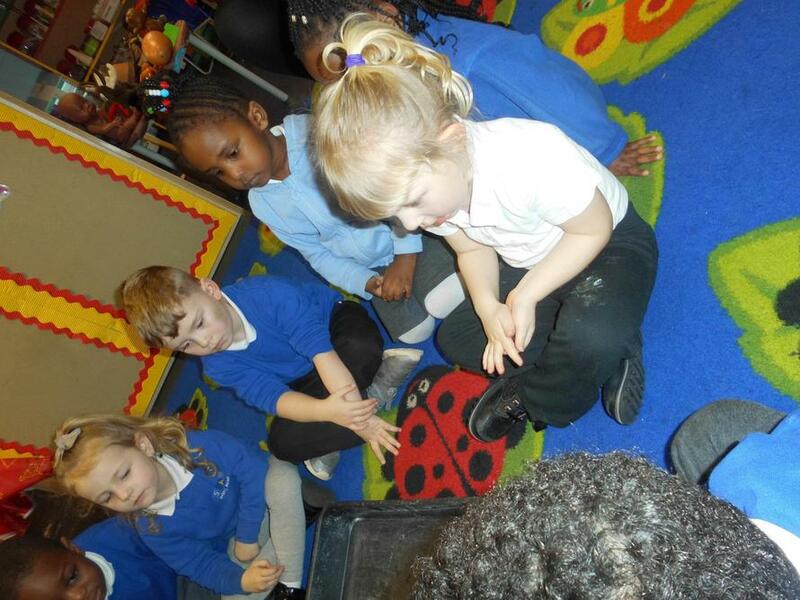 We also read the story called 'The big Race' and watched it online and we learnt this year ids the year of the pig. 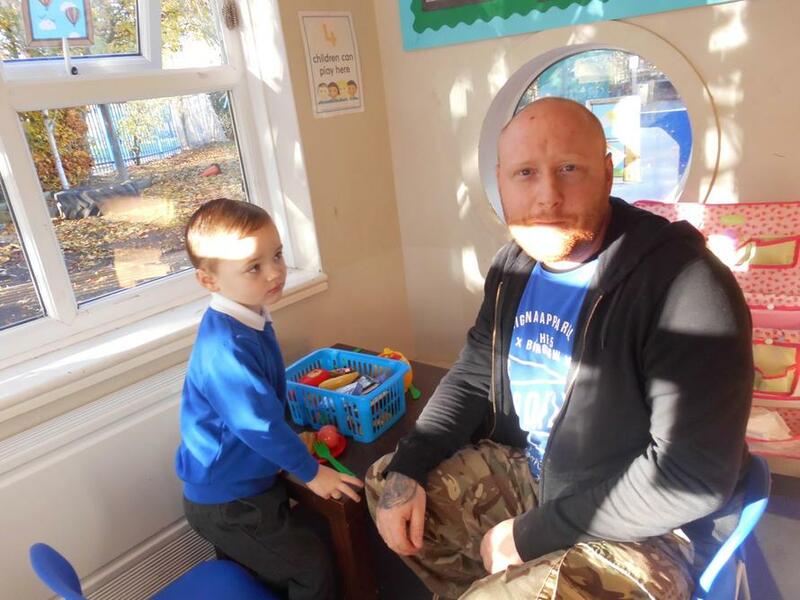 A VIDEO OF THIS STORY CAN BE SEEN BELOW. 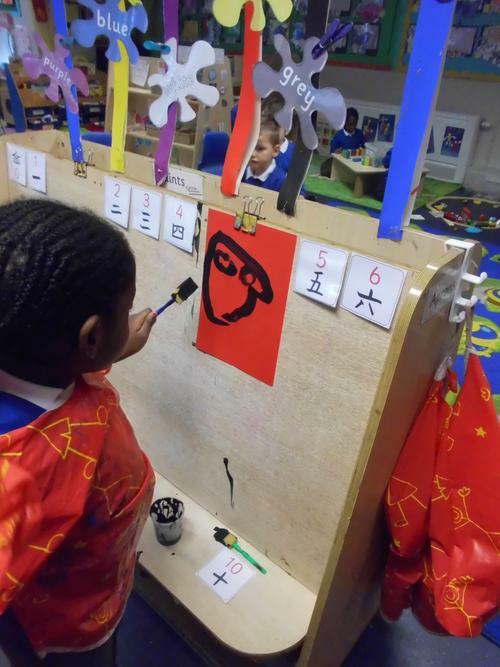 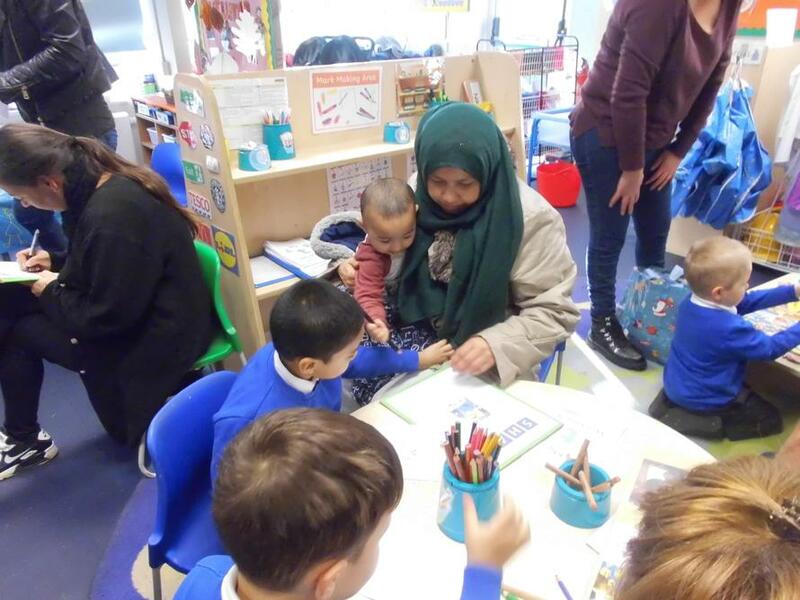 We had lots of fun activities to help us learn about chinese new year including making Chinese lanterns, cutting and colouring our own Chinese dragon puppets, cutting and sticking chinese money wallets, painting Chinese numbers and pretending to role play being in a Chinese restaurant. 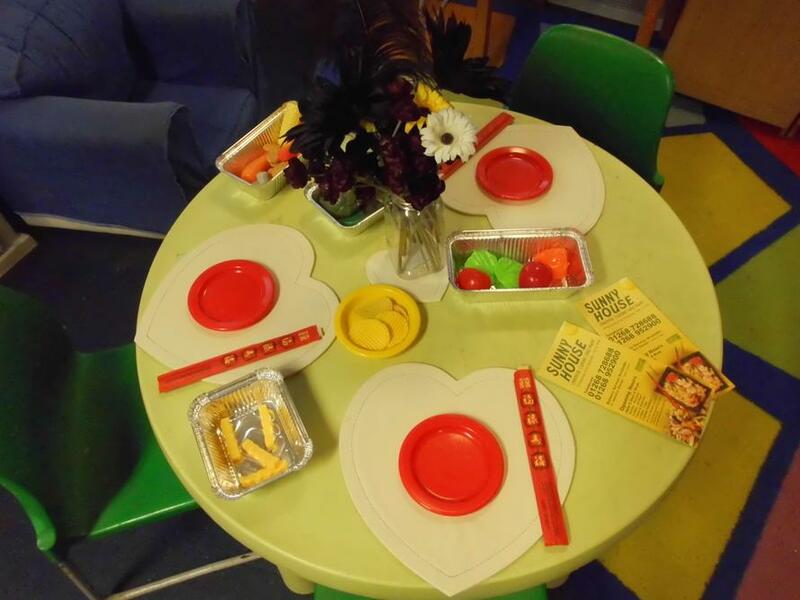 Our home corner was transformed into a restaurant with lots of Chinese writing on the walls, chinese menus and take away dishes. 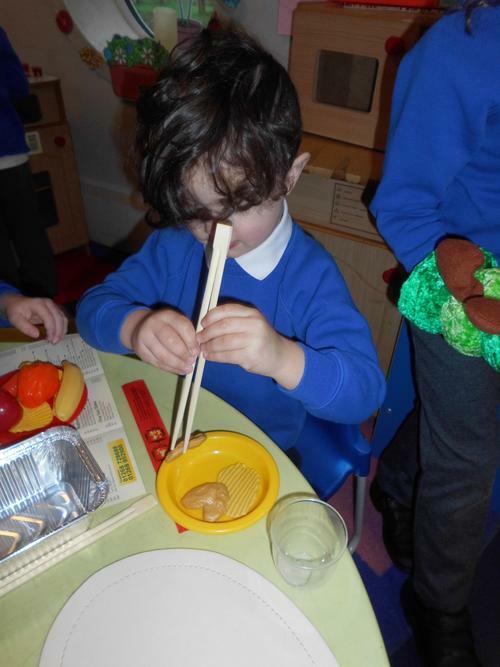 We also had a good try at using the chopsticks, as you can see from the pictures! 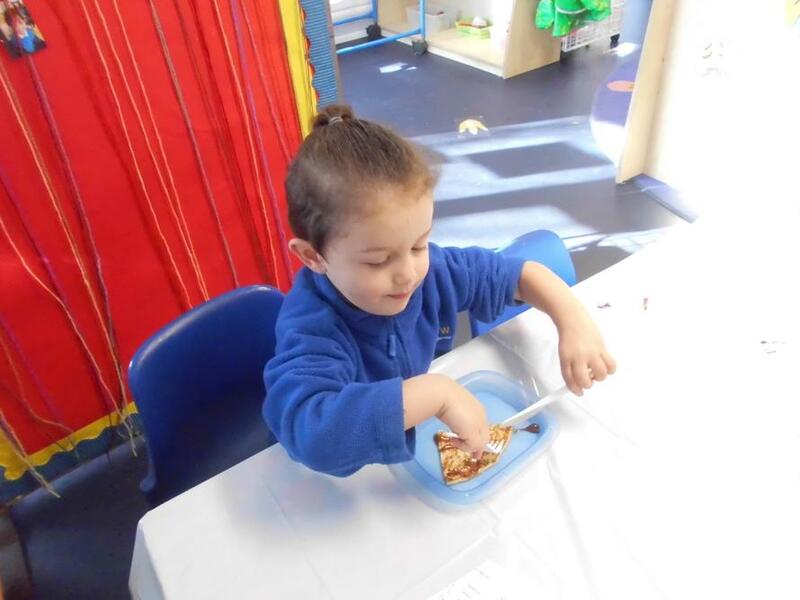 At the end of the week we enjoyed tasting Chinese food, we had prawn crackers, vegetable spring rolls, egg noodles and a fortune cookie. 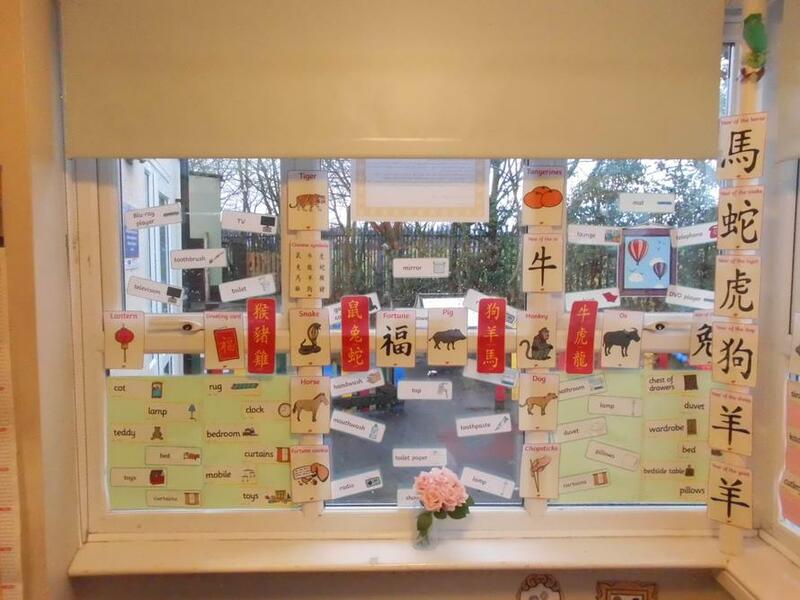 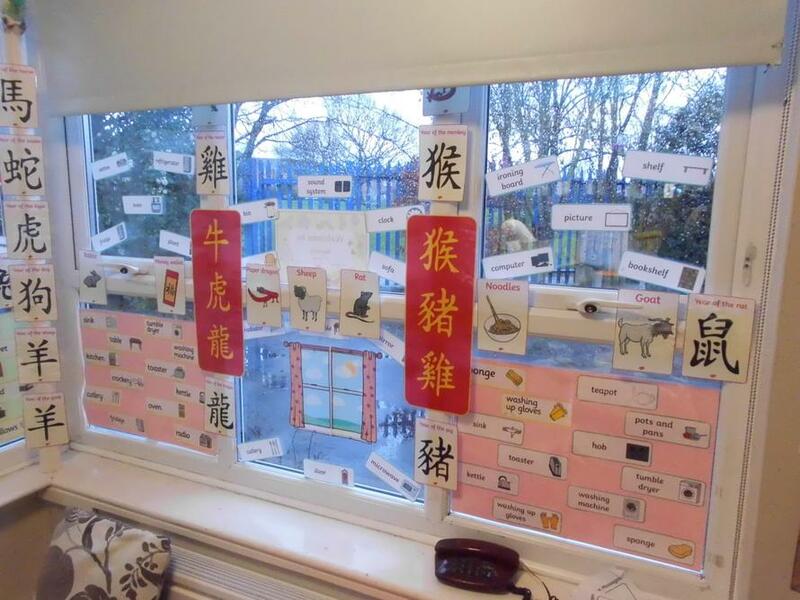 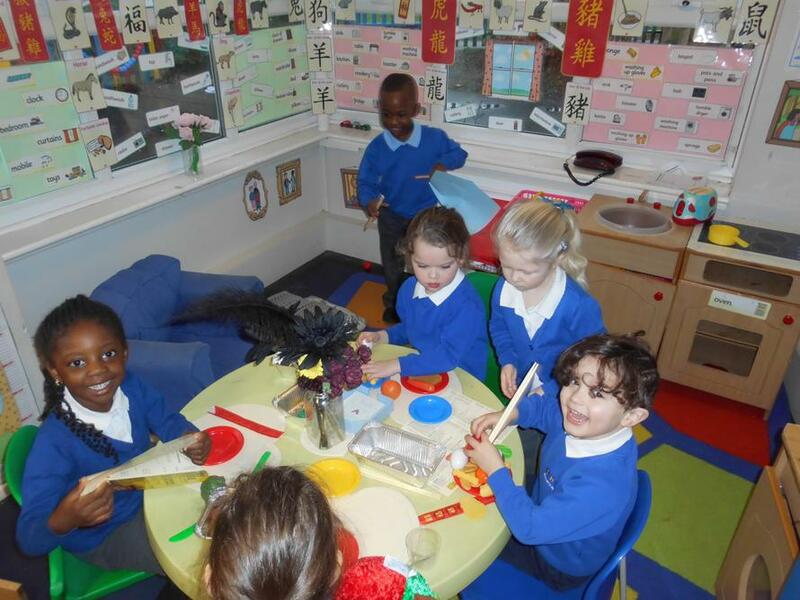 We have really enjoyed learning about Chinese new year! 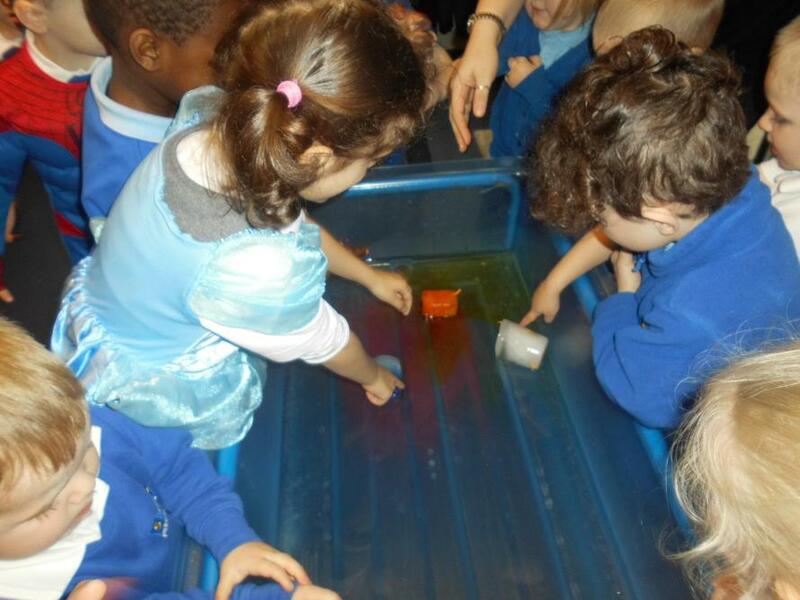 We had hearts and sparkles in the water tray! 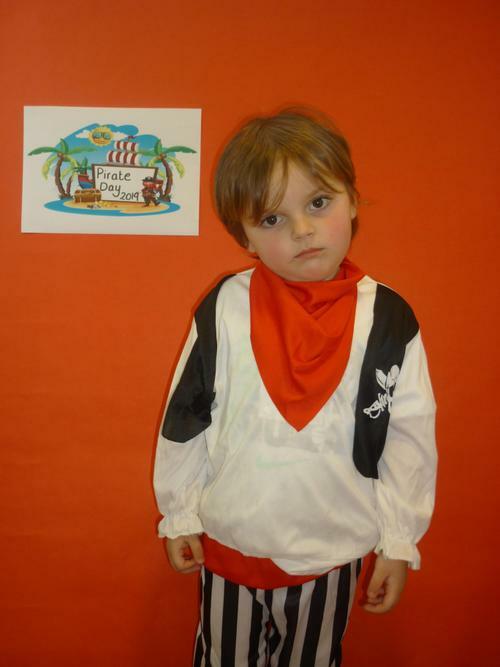 Give yourself a hug for Valentines day! 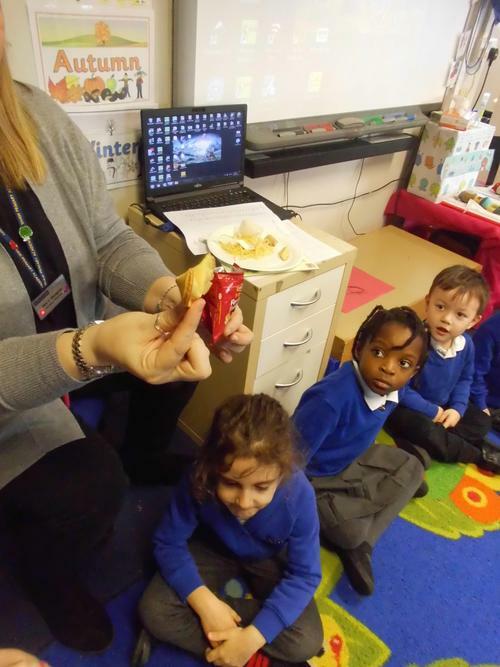 Our love heart biscuits were yummy! 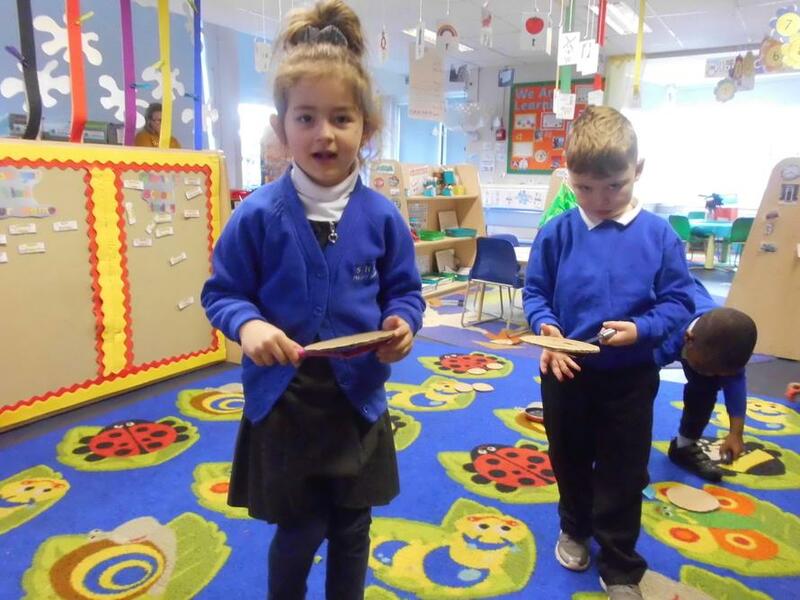 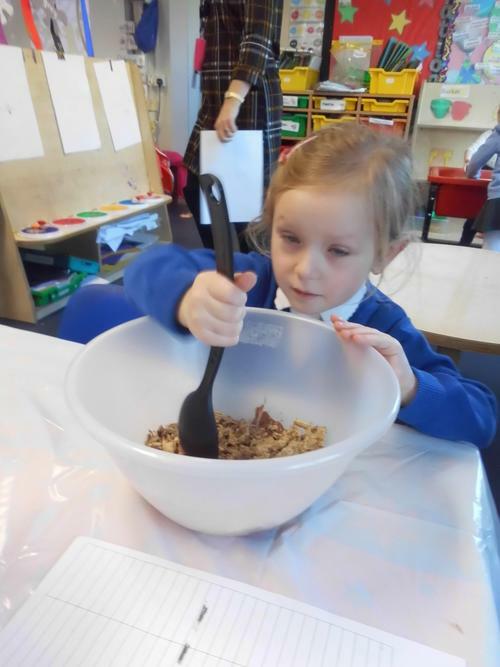 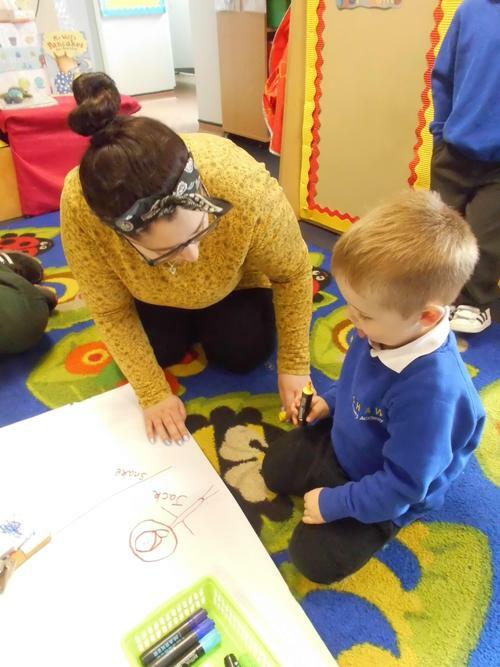 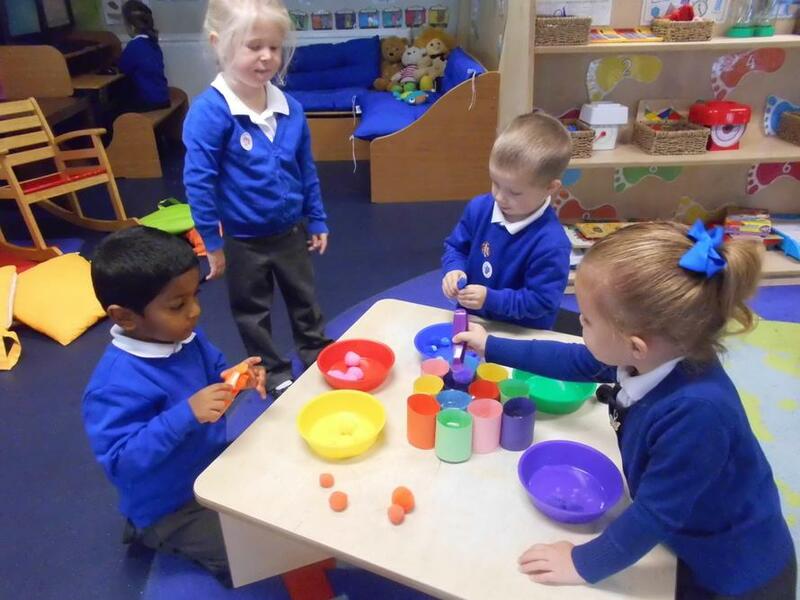 We have been learning about measuring in Nursery and we have had lots of fun activities! 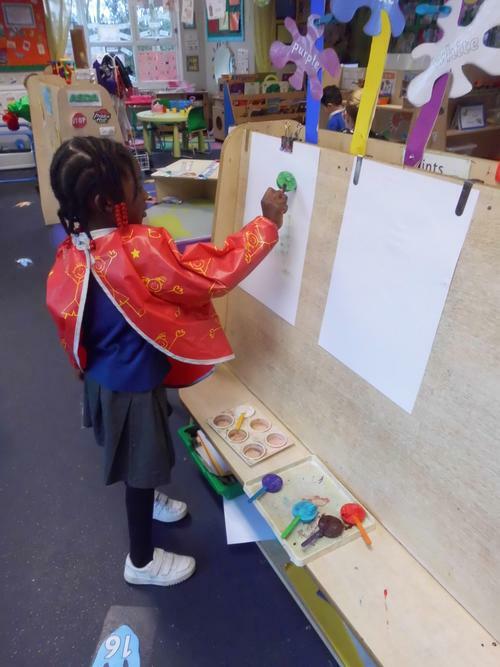 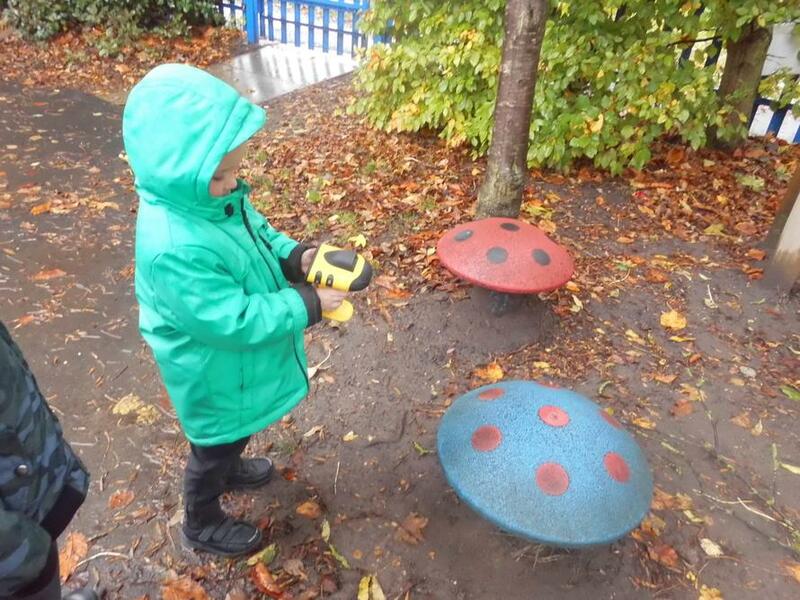 We used the Unifix to build 'big' and 'small' 'short' and 'tall' towers and we used them to measure the size of the dinosaurs and other objects in Nursery. 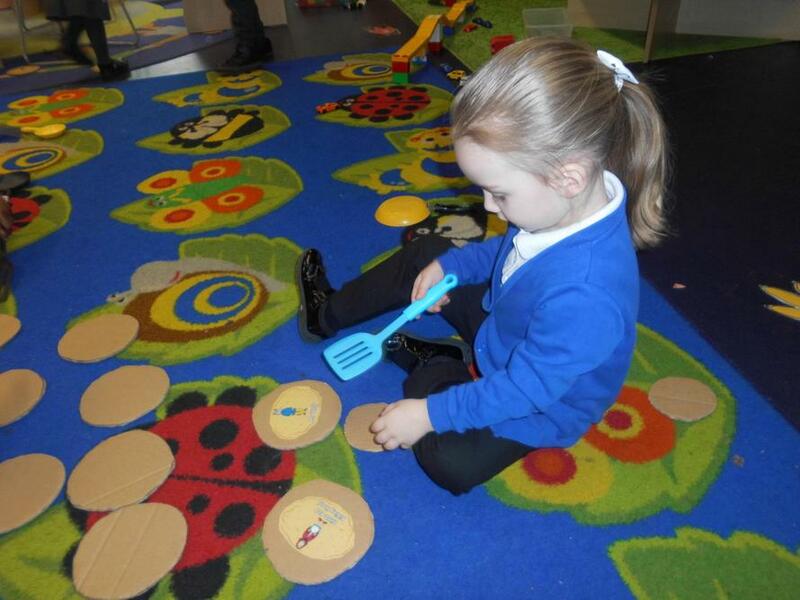 Lots of good vocabulary has been learnt and used by the children through their play. 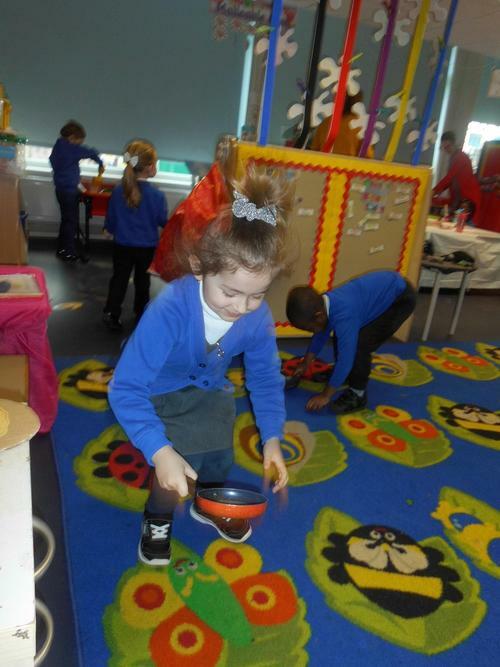 We also practiced our measuring skills and measured ourselves with string. 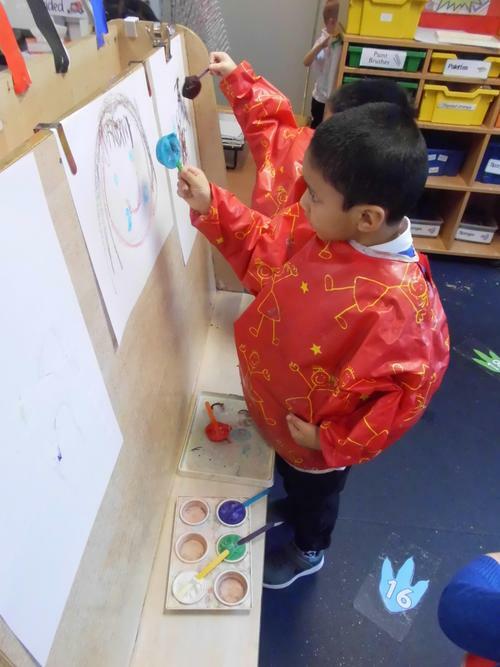 The children used string in their choice of colour to measure themselves and attached it to their photograph on to our measuring chart. 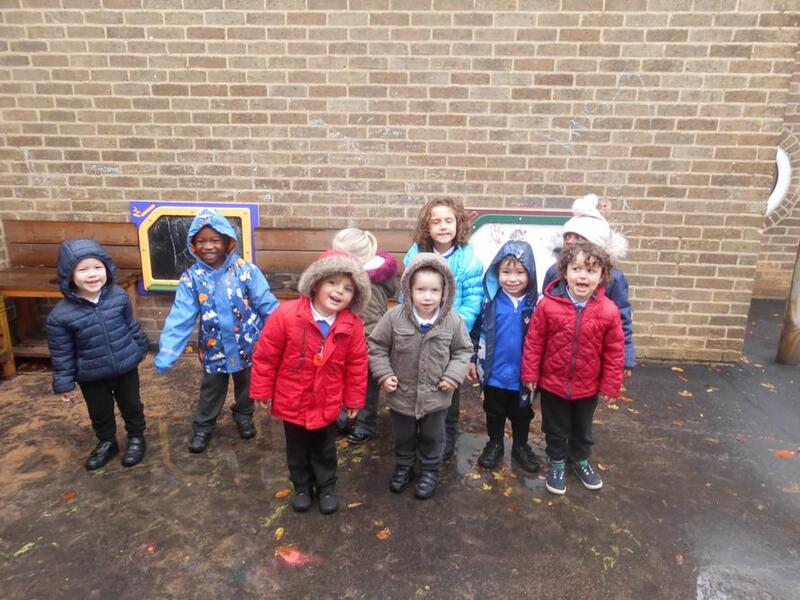 We can see now who is the tallest and who is the shortest! 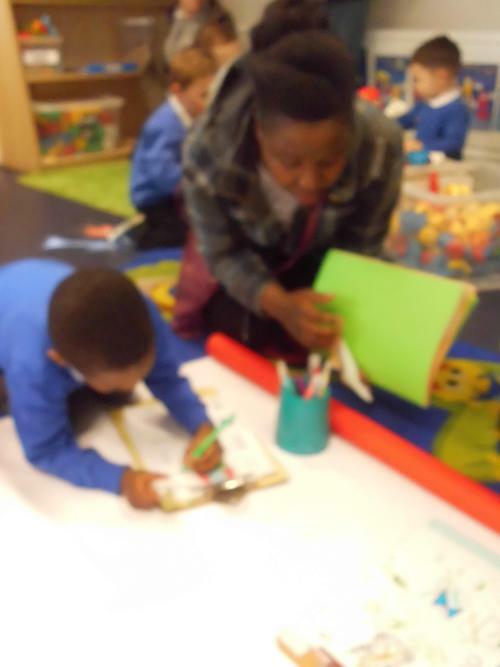 We are going to measure ourselves again at the end of the school year to see how much we have grown. 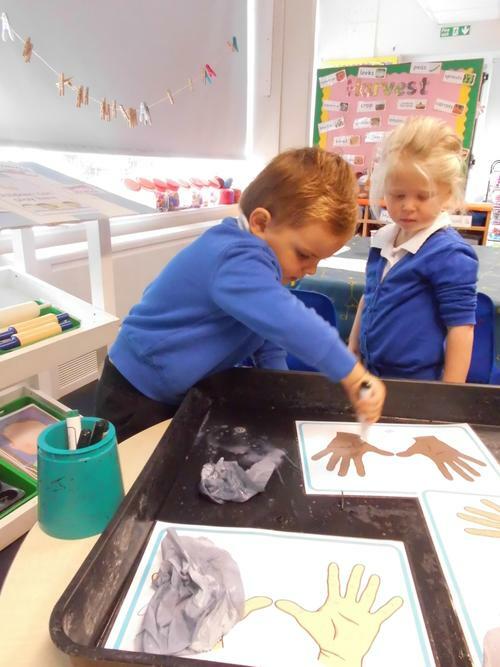 Our topic this term is dinosaurs and we have been learning about all sorts of dinosaurs so this week we had a life size cut out of a T-Rex footprint in Nursery, which the children described as 'jimongous'! 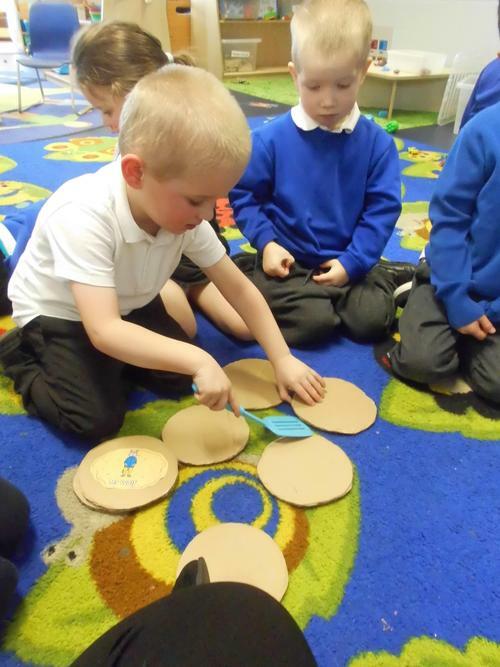 It only had three toes on it so we then began to talk about how many toes we had and we took our shoes of to count them. 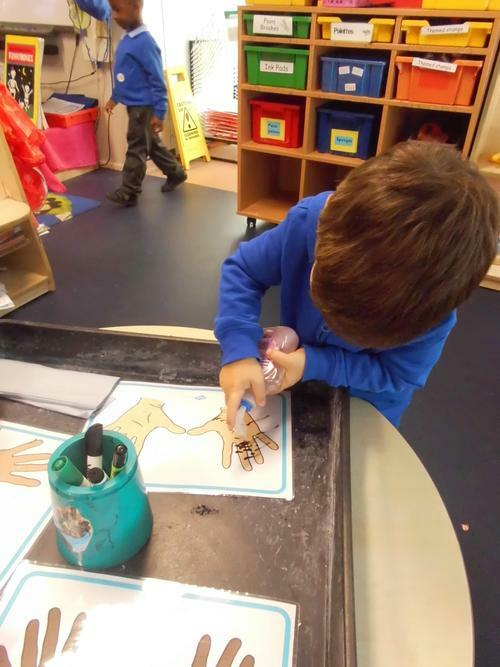 We found out that we have ten toes but the T-Rex only had 6 toes. 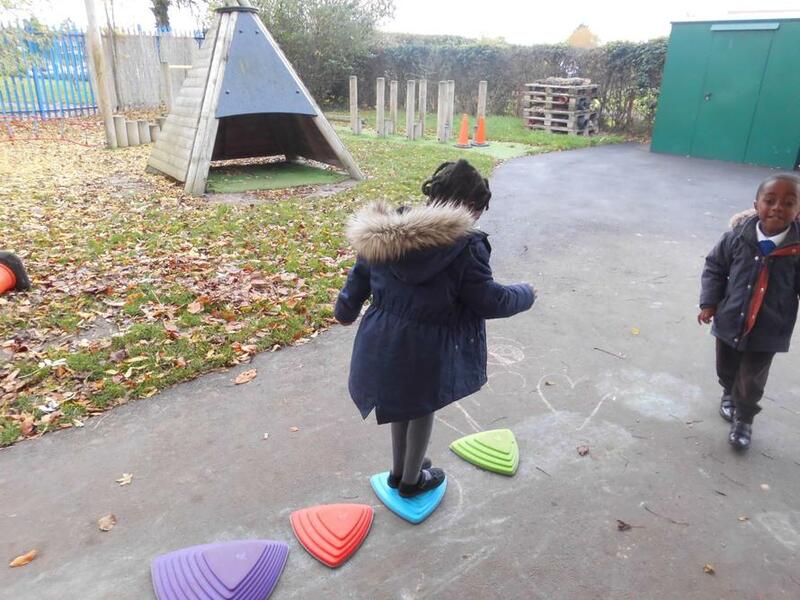 With our shoes off, we decided to see how many of our shoes would fit into the footprint so one at a time, we put our shoes into the footprint. 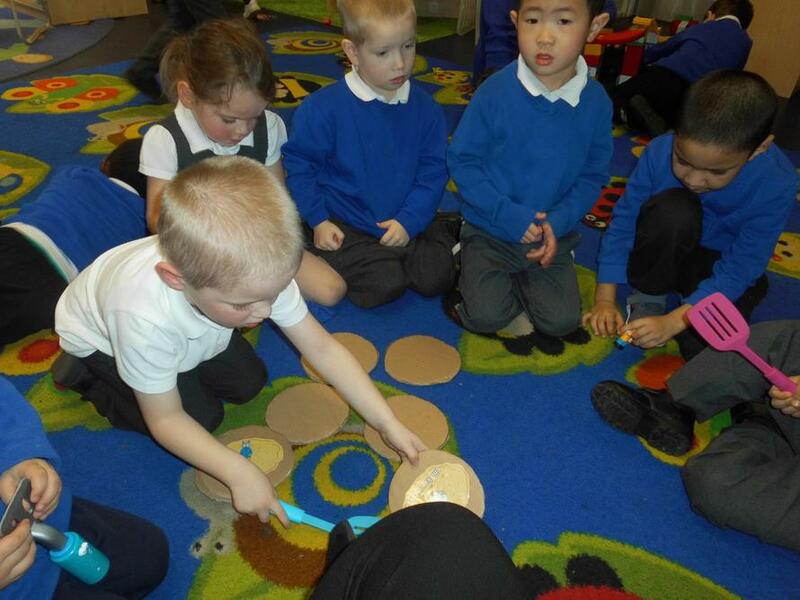 We found out that we could fit 46 shoes into the T-Rex footprint! 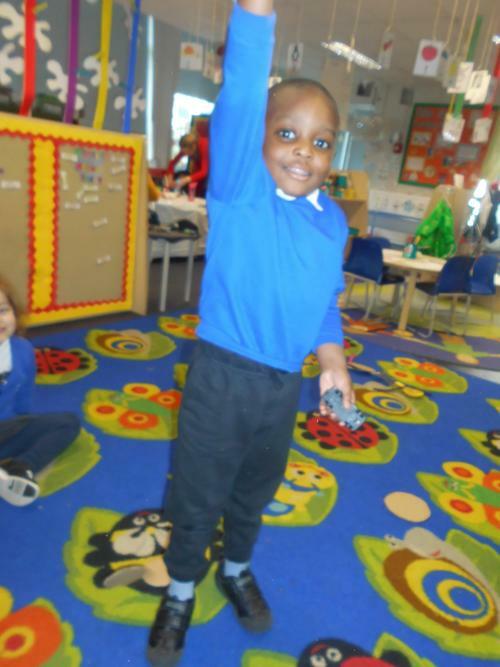 That's a lot of shoes! 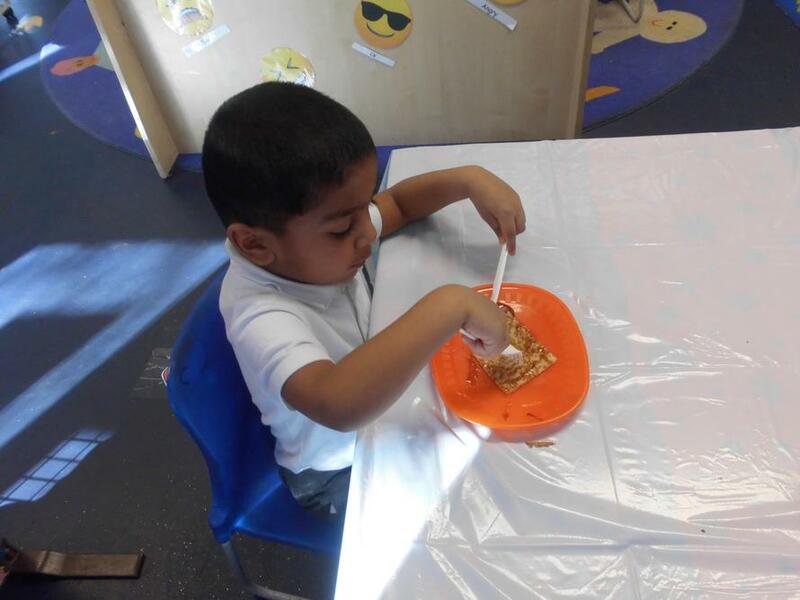 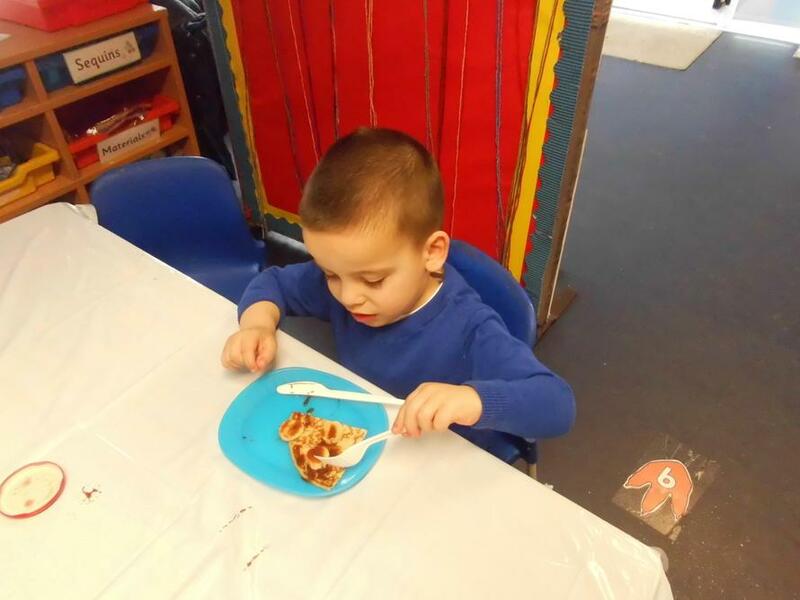 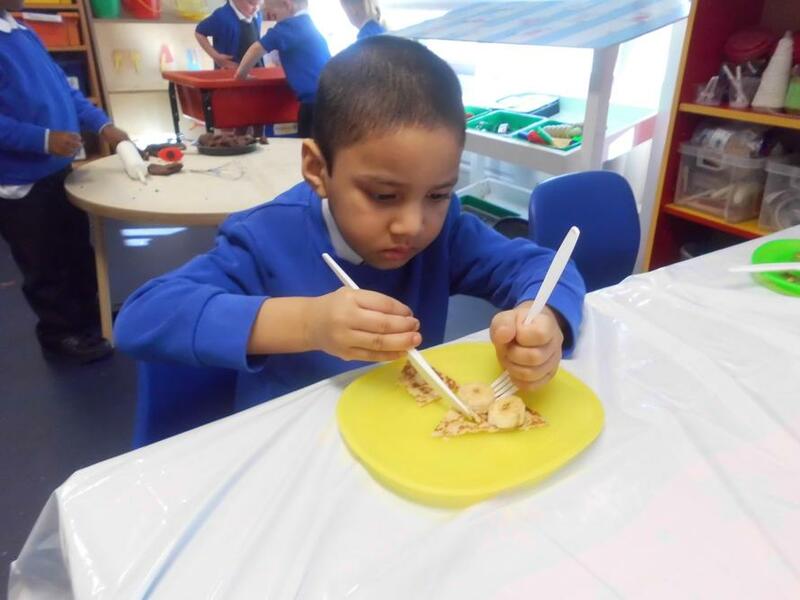 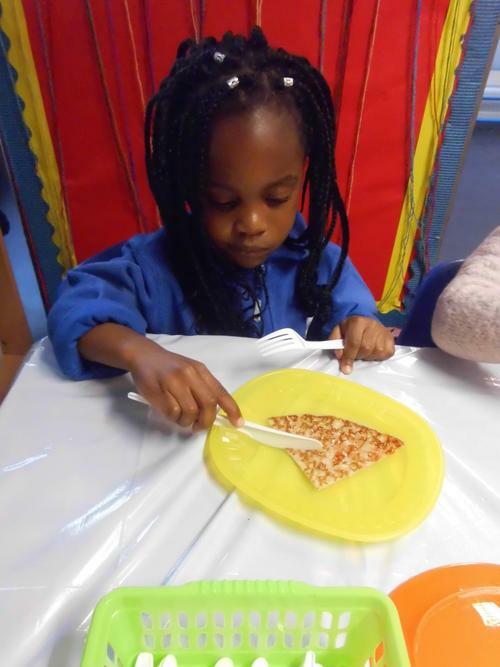 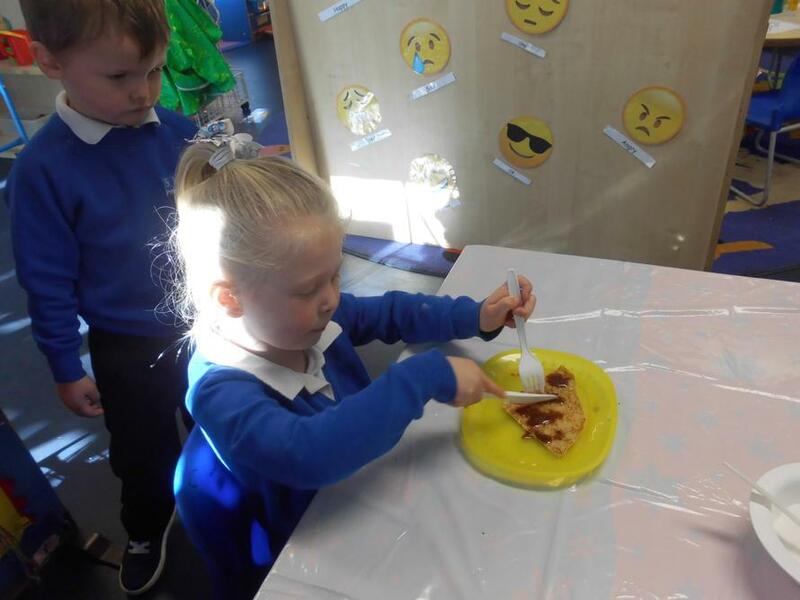 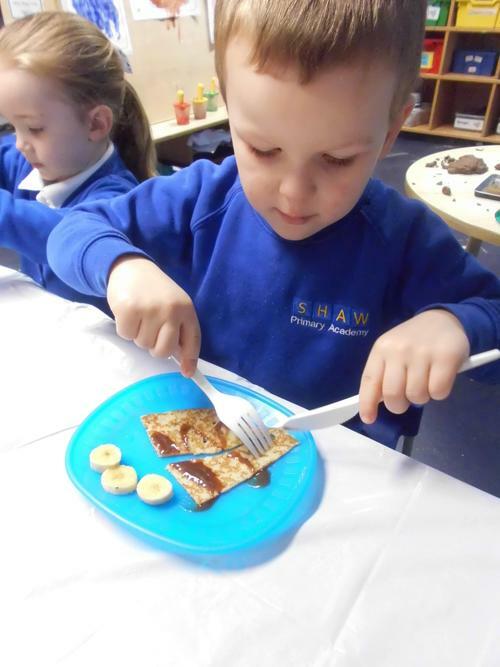 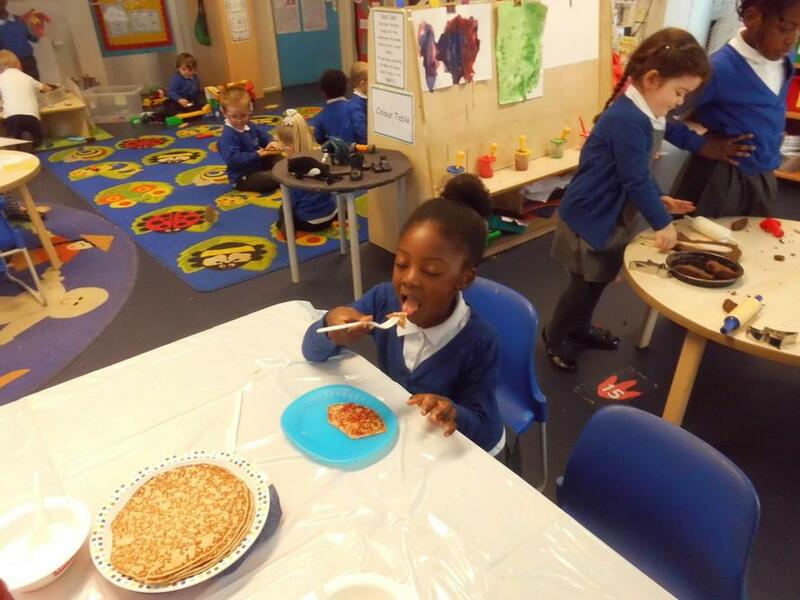 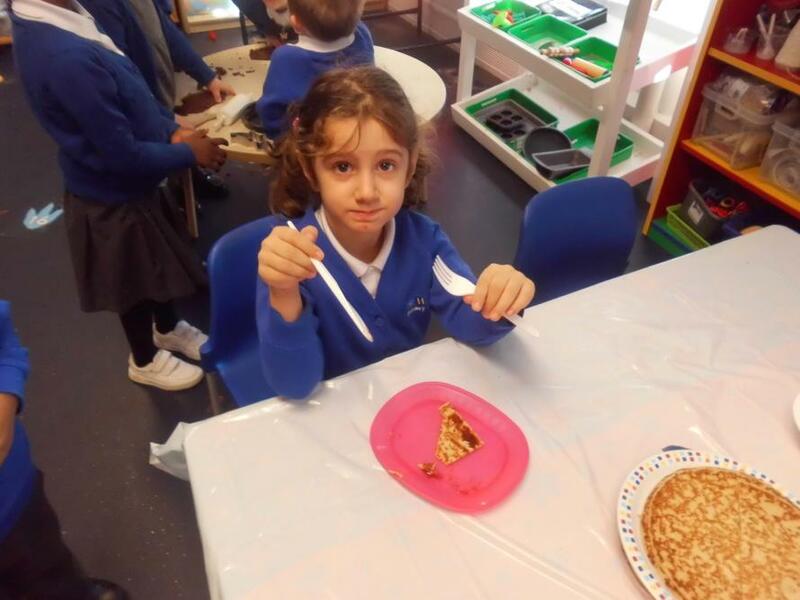 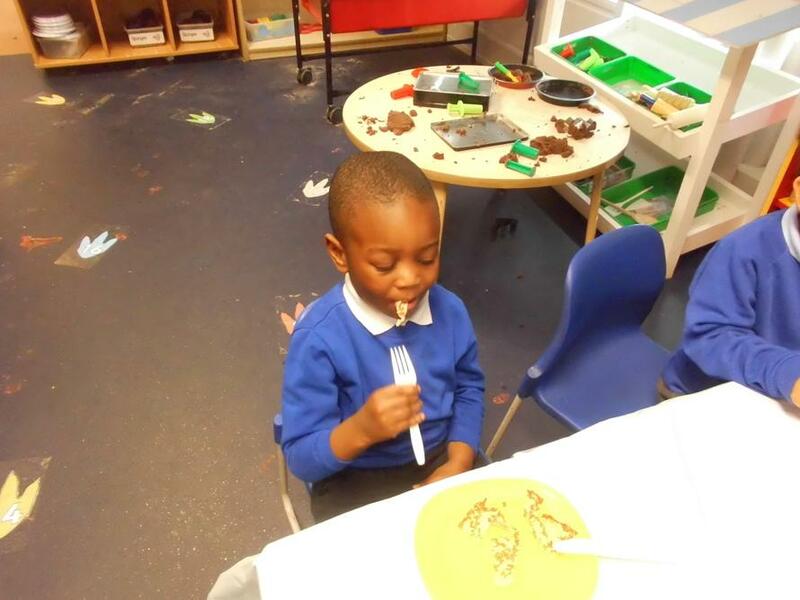 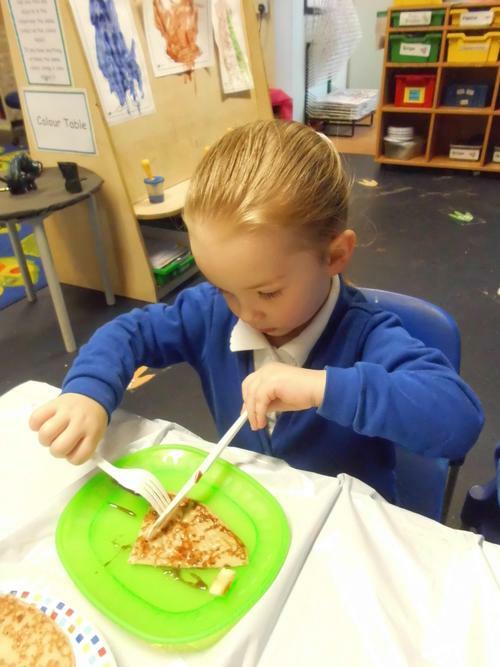 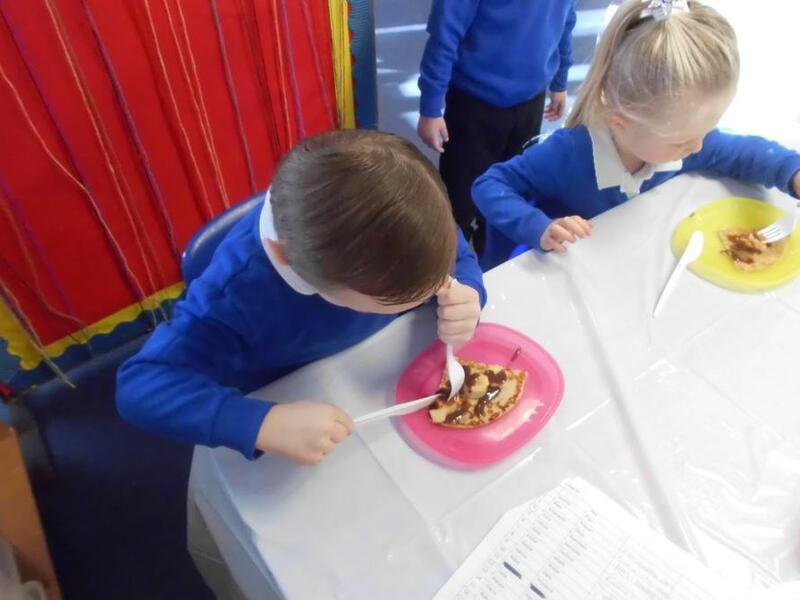 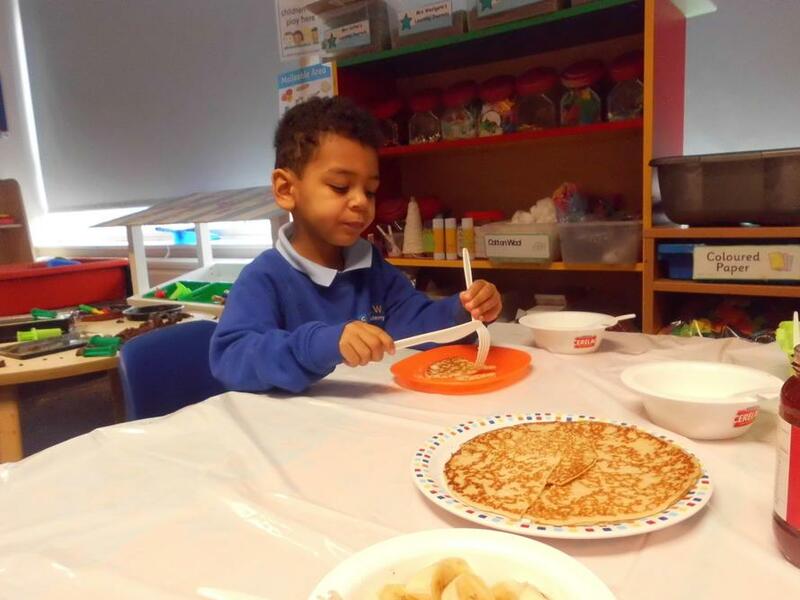 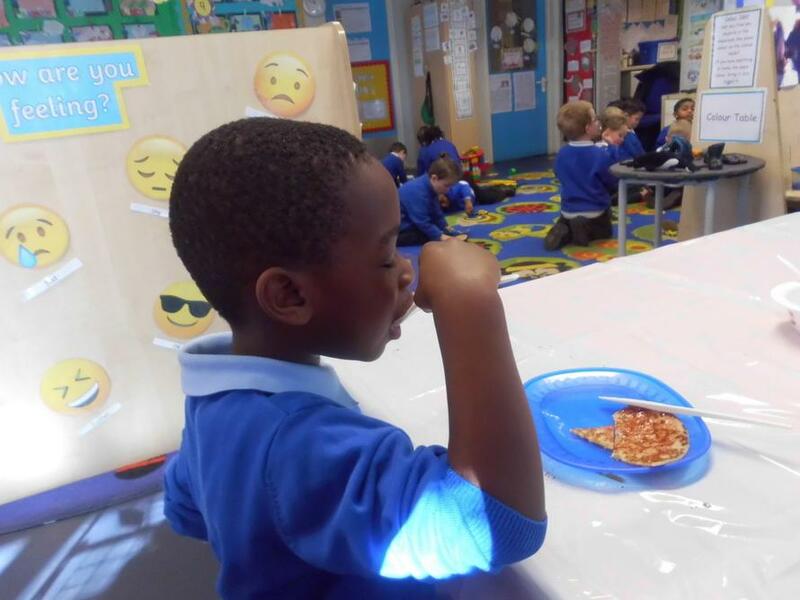 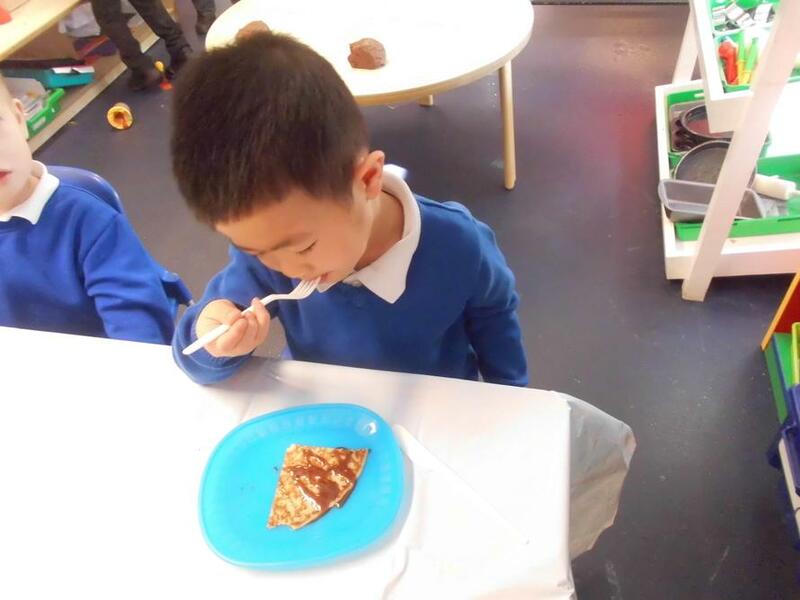 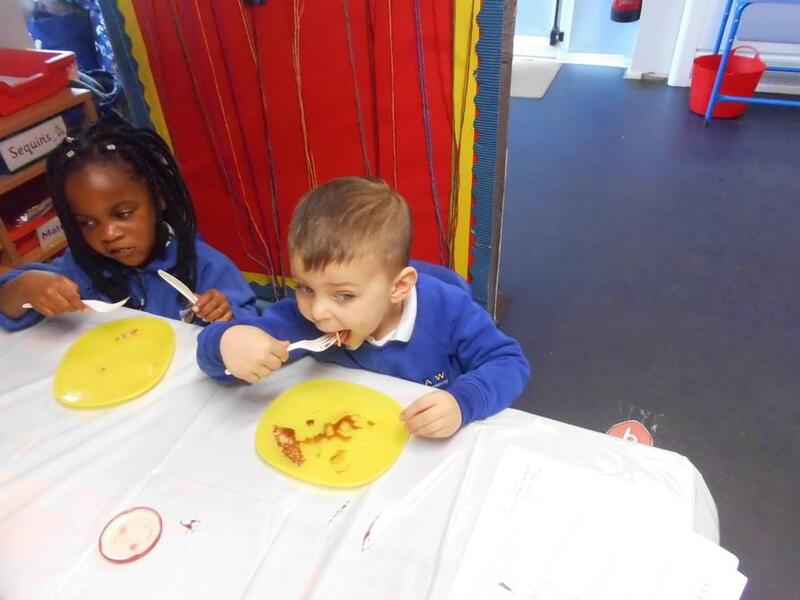 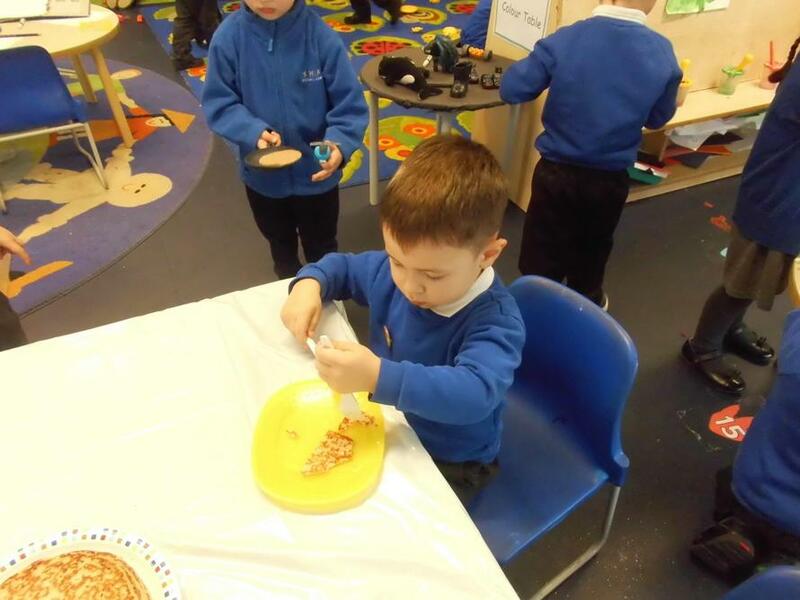 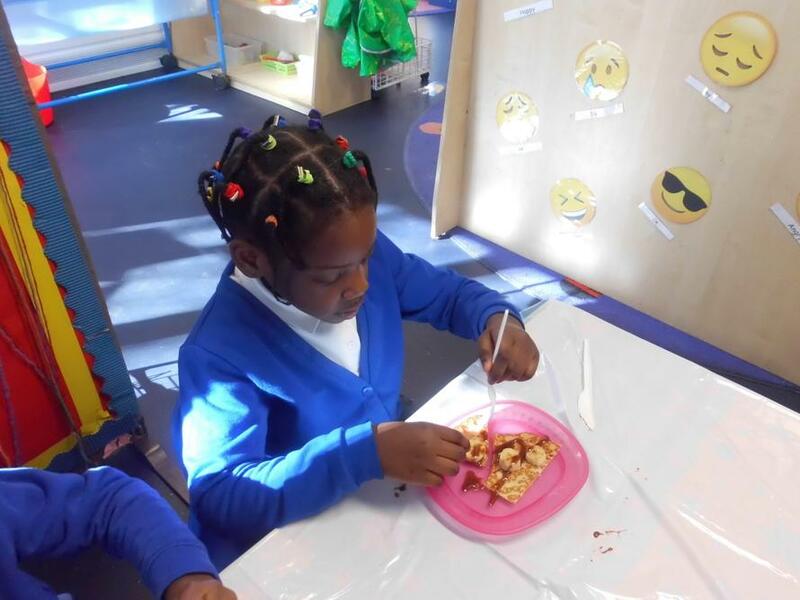 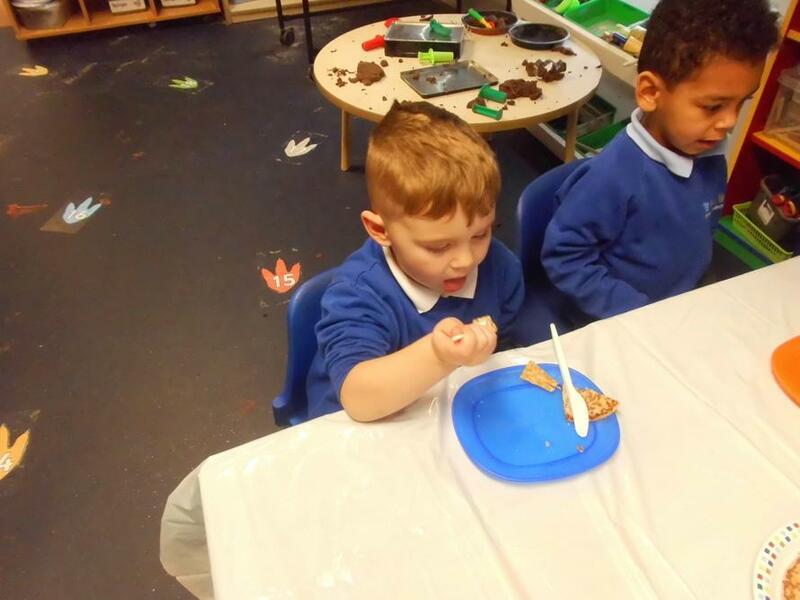 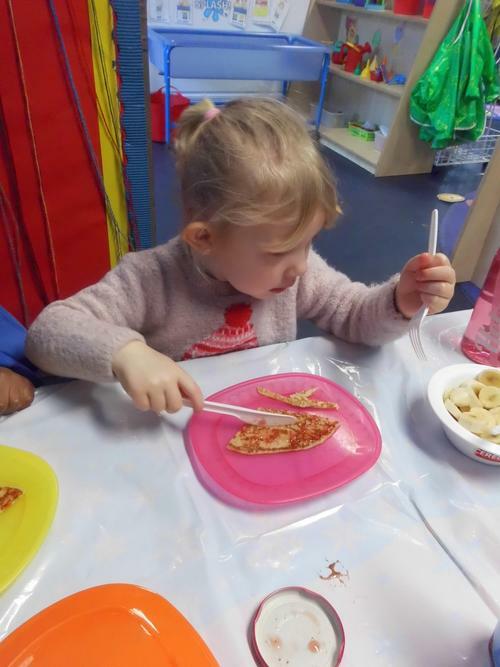 Pancake day - We tasted pancakes for our snack and practiced using knives and forks. 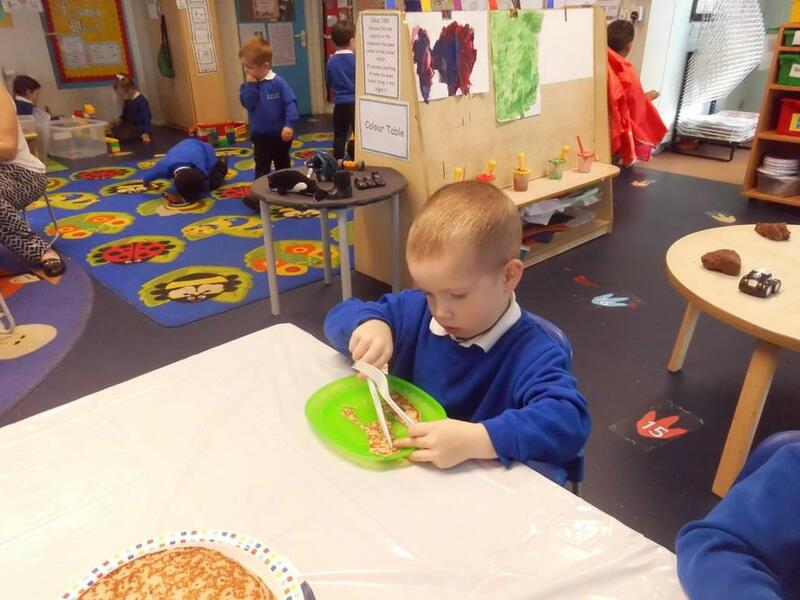 We also played lots of pancake games! 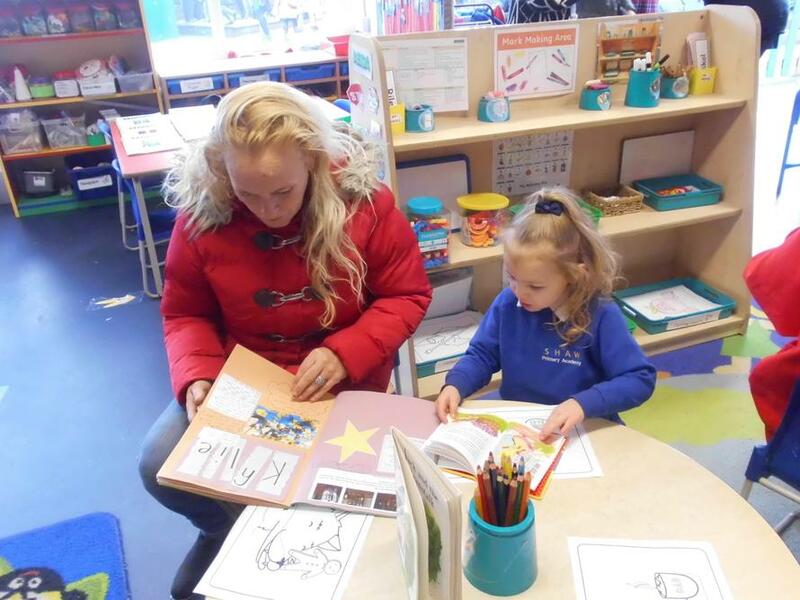 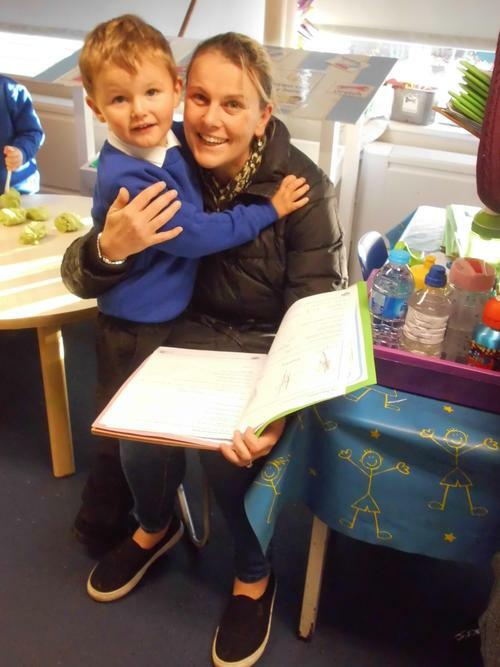 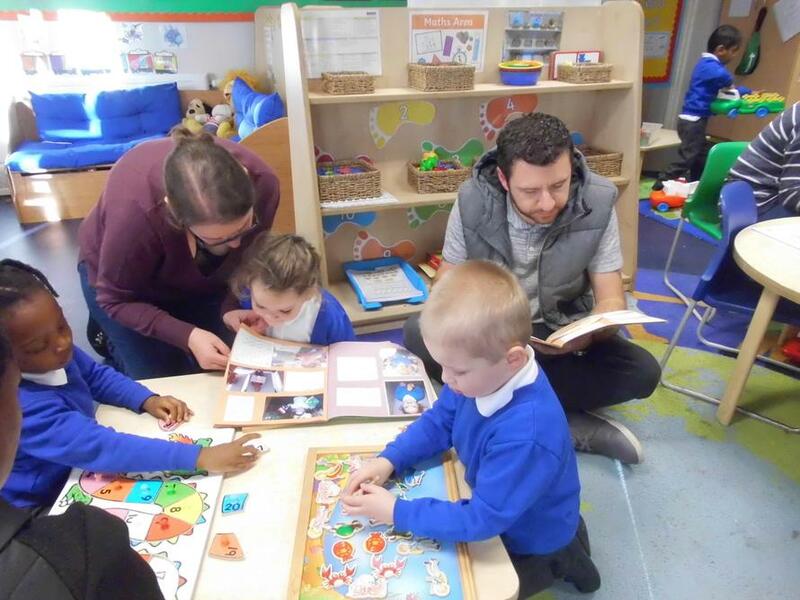 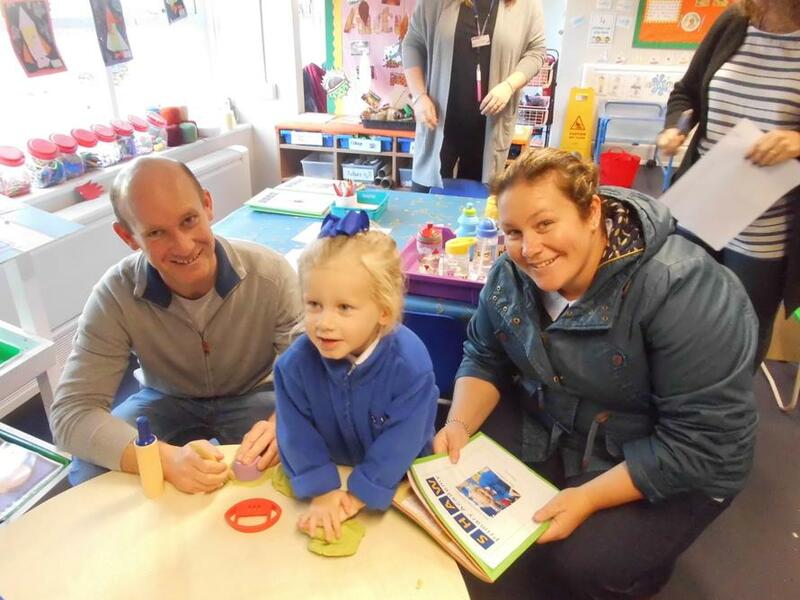 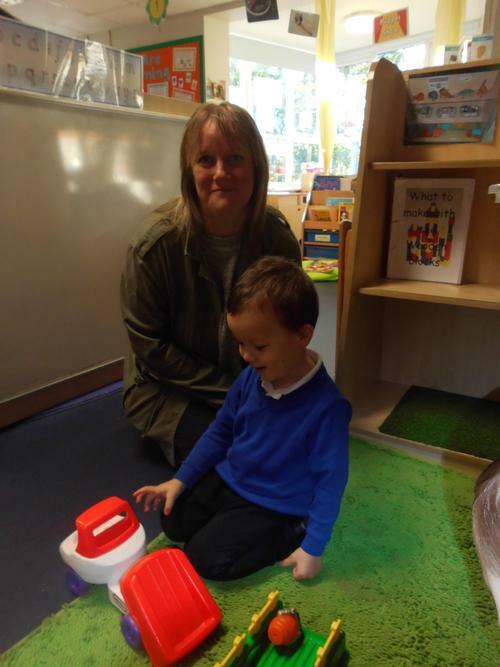 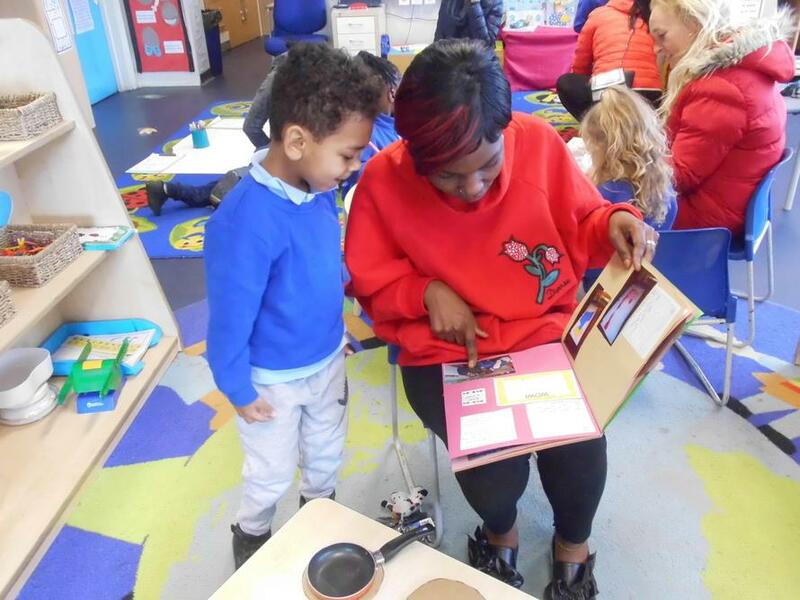 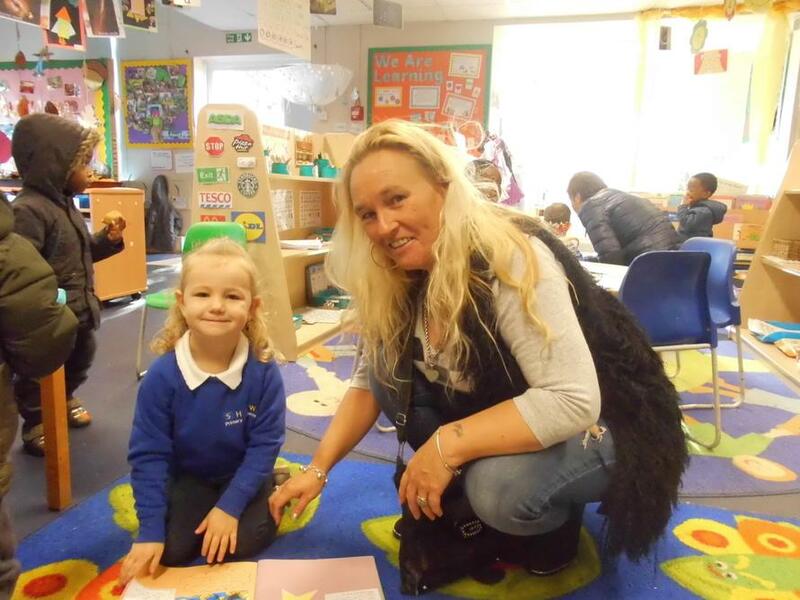 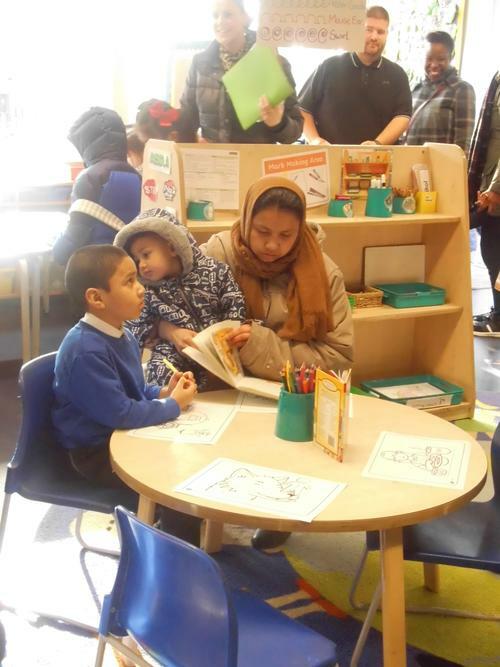 On Friday 8th March we had a visit from the author Sue Wickstead who shared with us some of the stories she had written and pictures of her play bus! 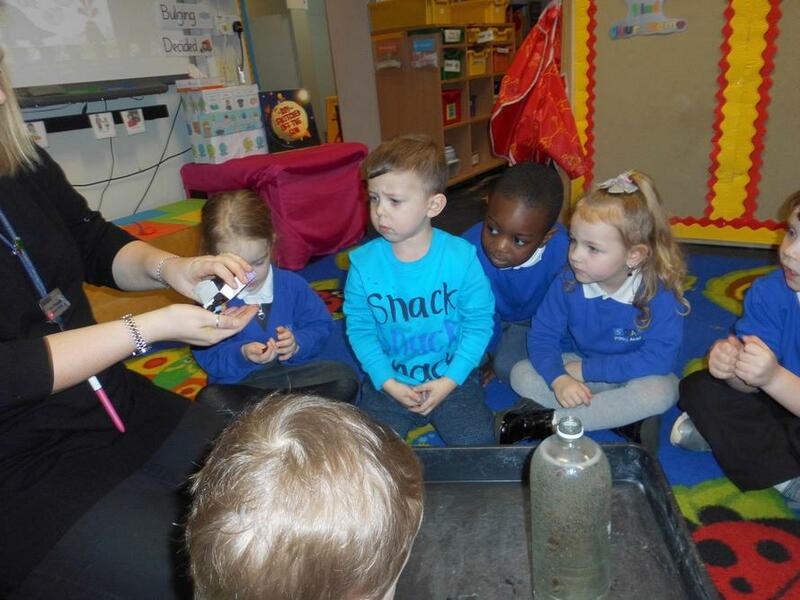 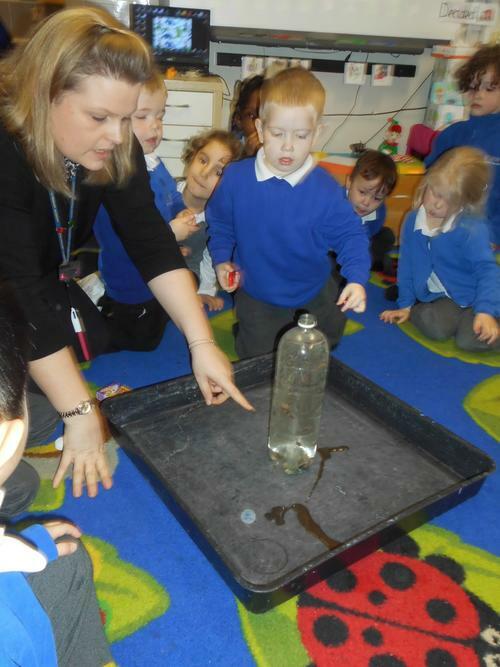 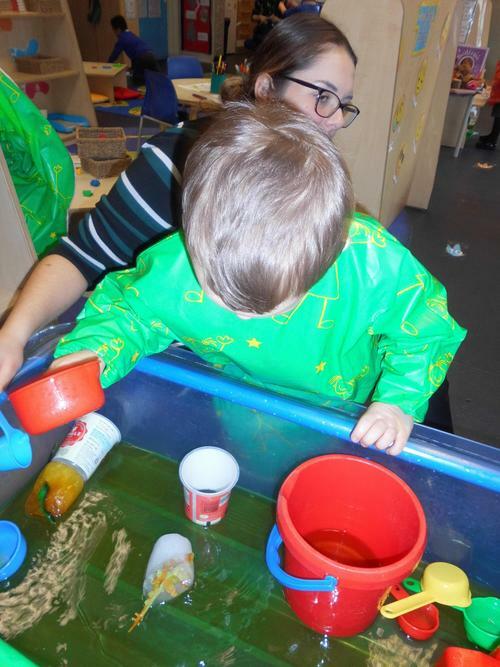 This week is science week and we have had lots of scientific experiences and discussions in Nursery! 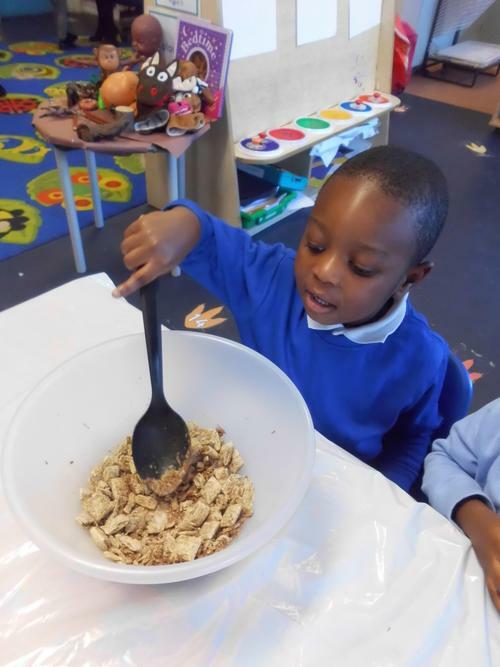 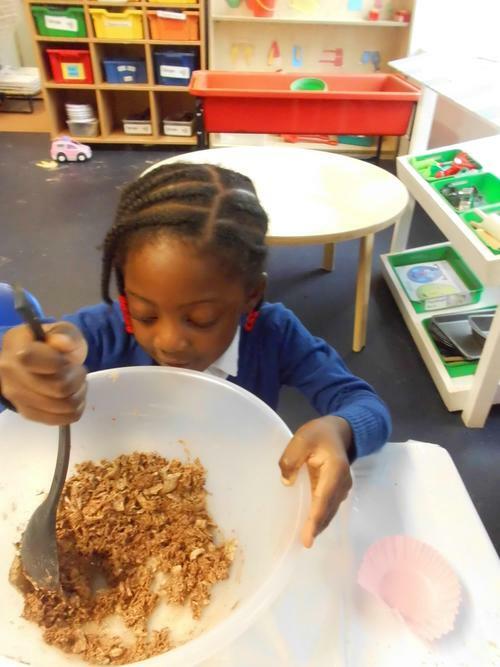 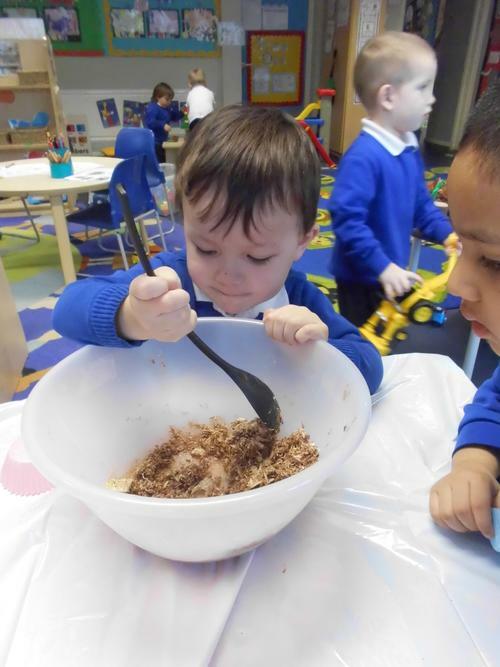 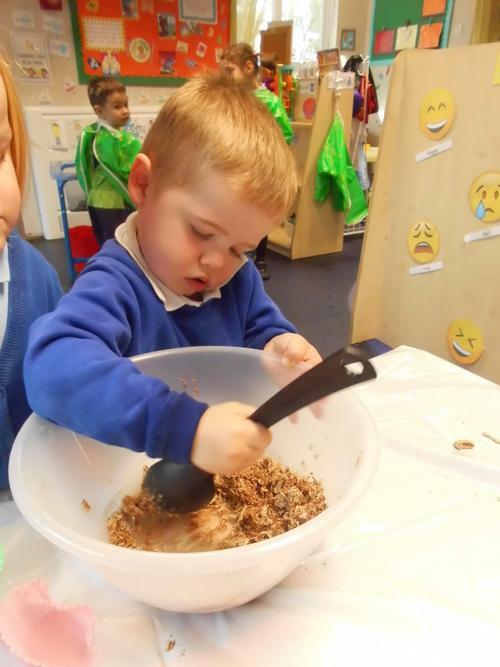 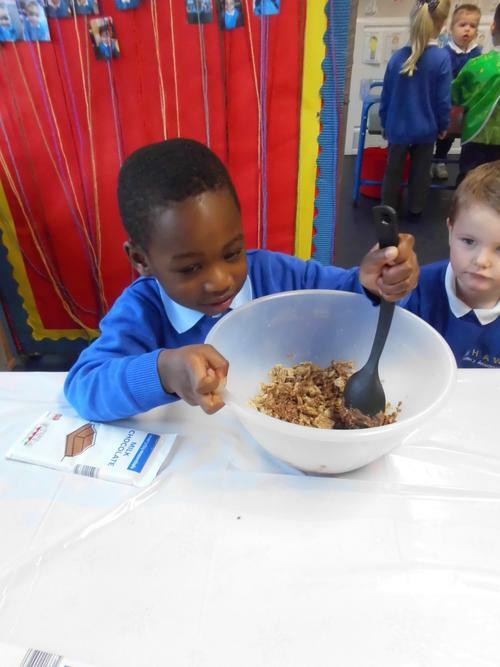 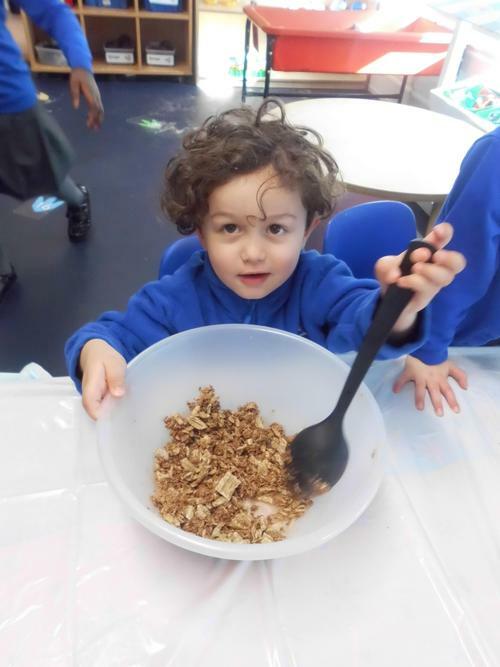 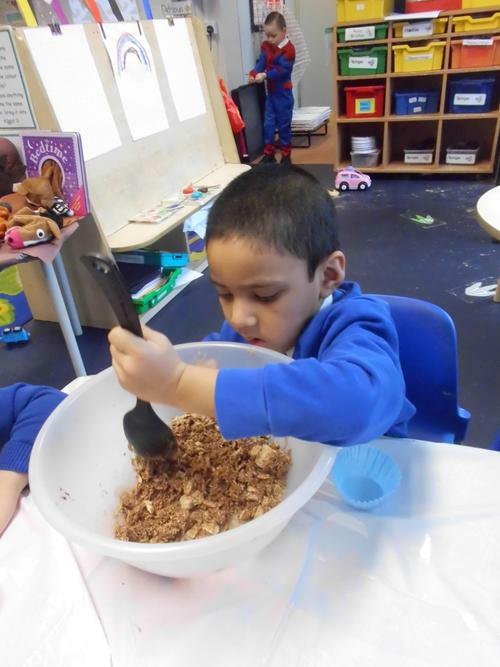 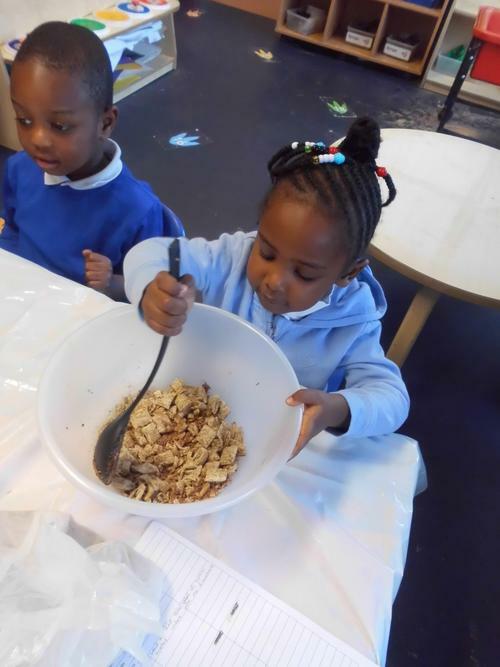 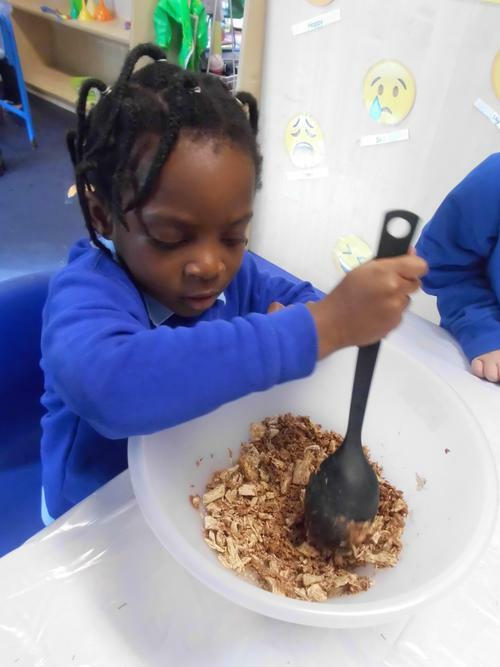 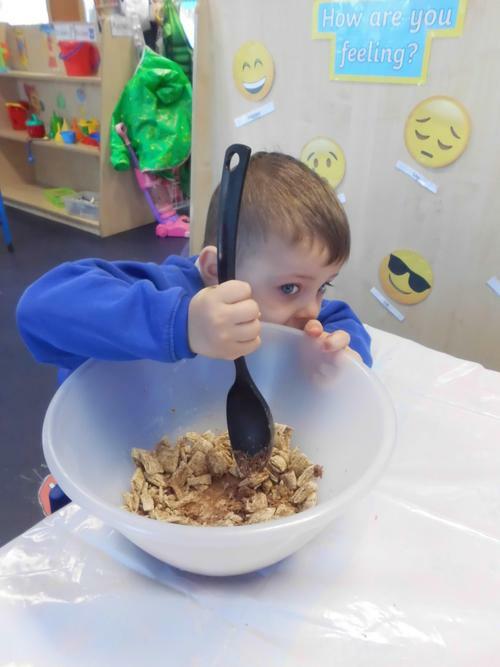 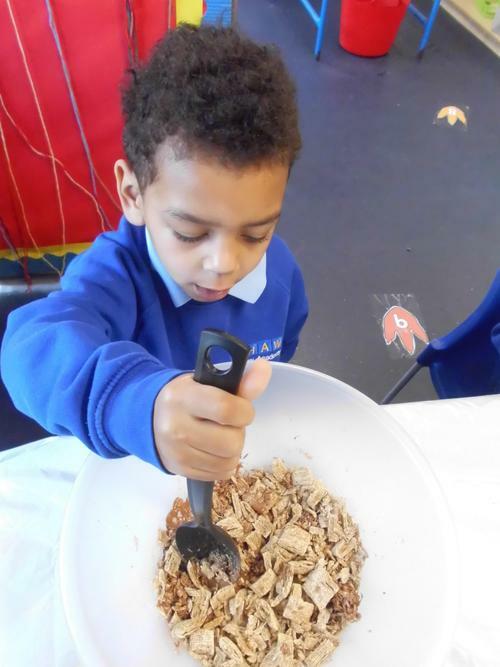 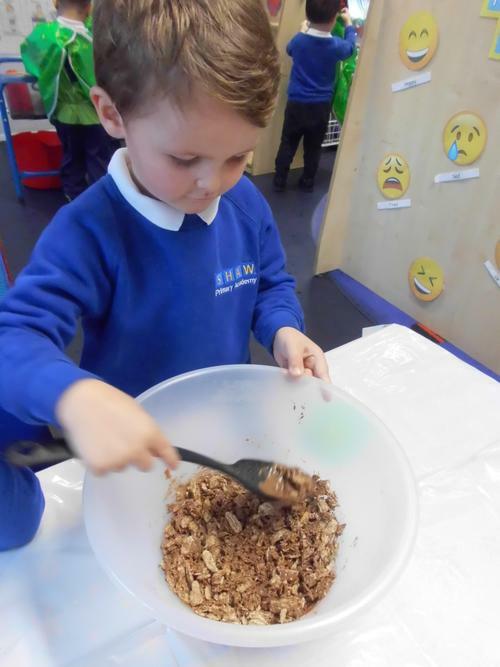 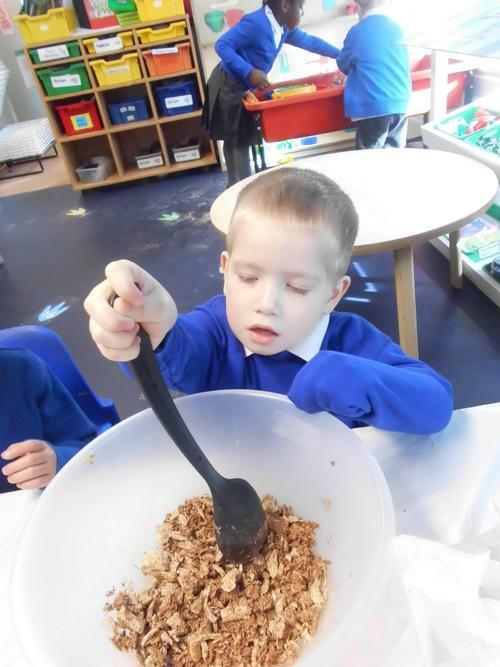 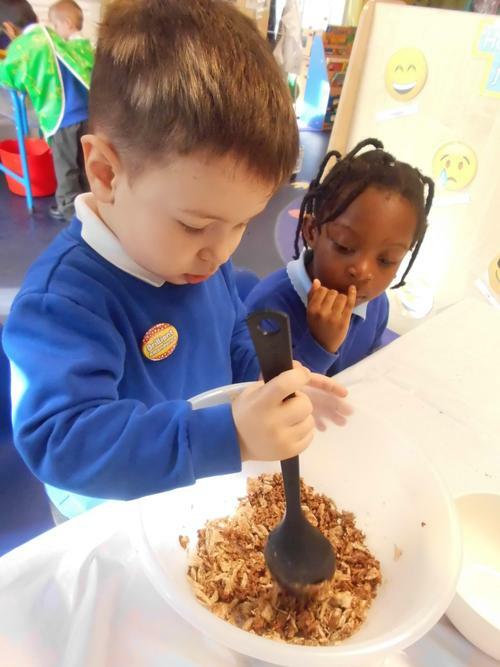 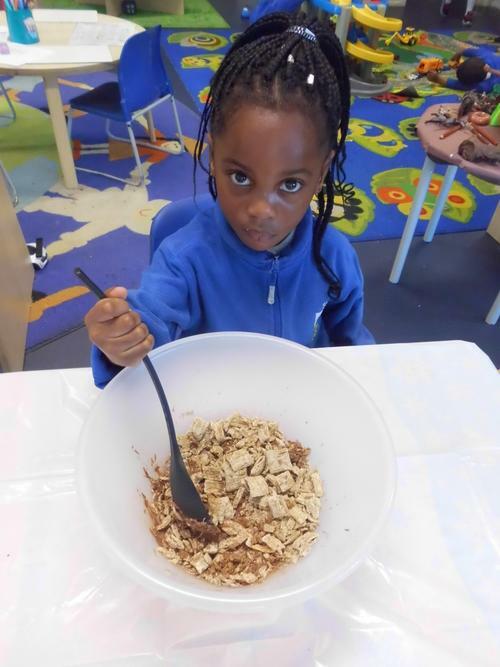 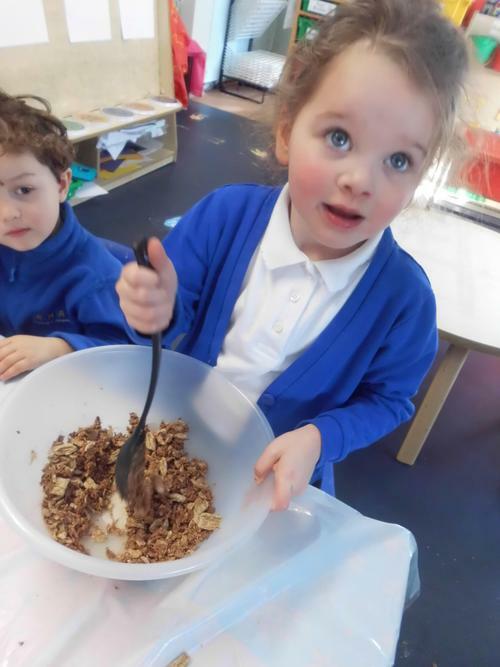 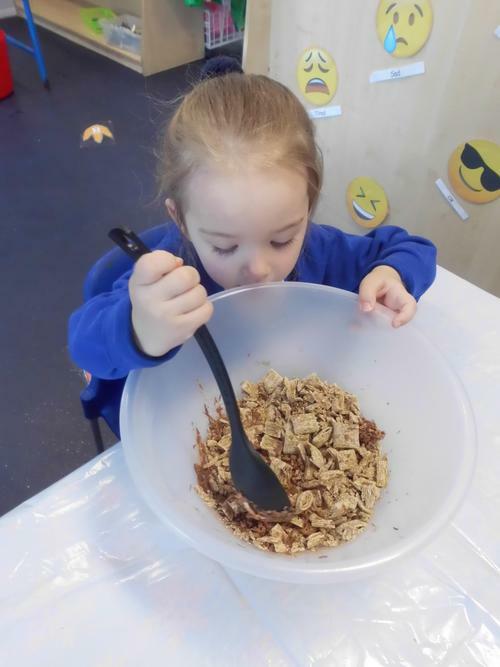 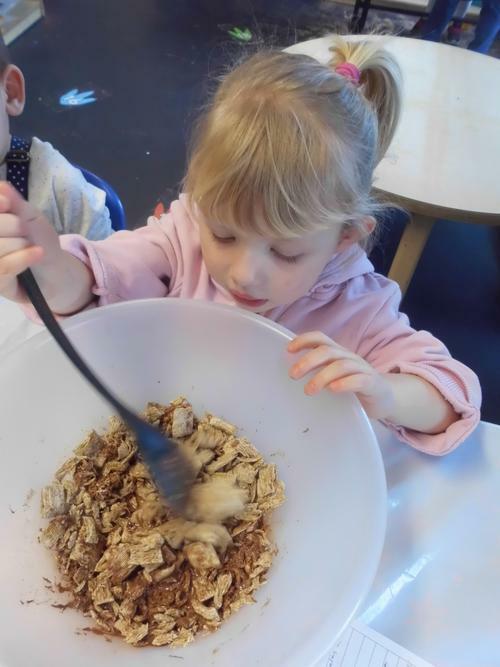 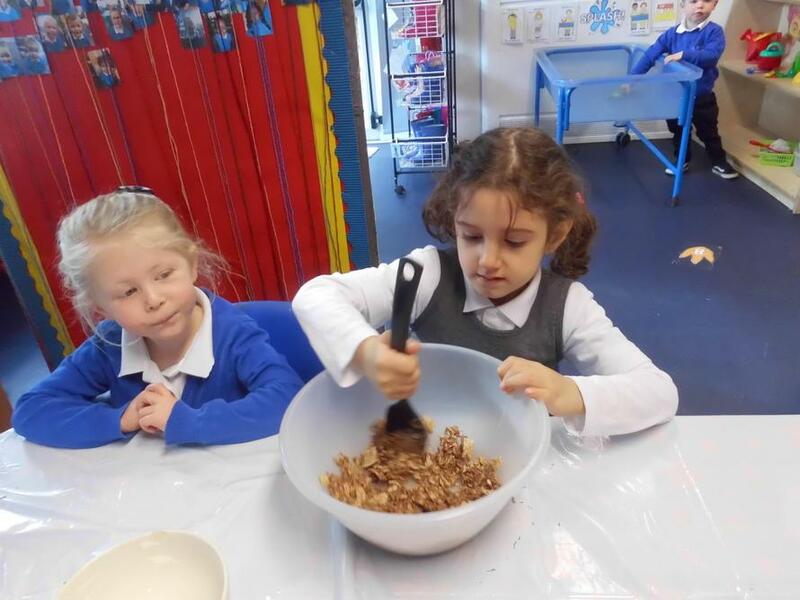 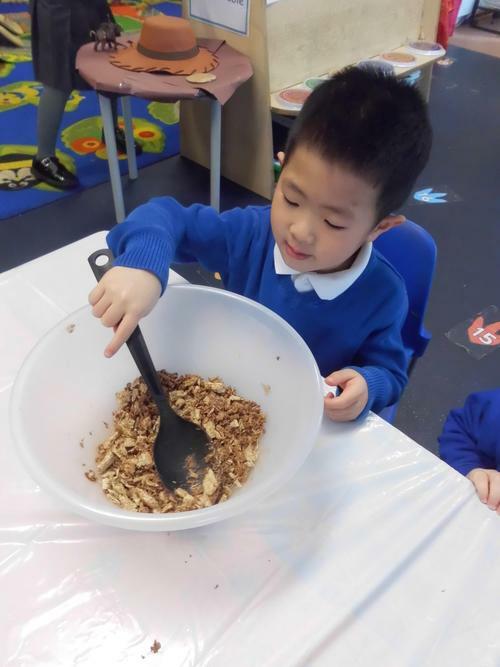 We began the week making dinosaur chocolate nests and we had to melt the chocolate in the microwave, the children enjoyed talking about all of the changes they could see happening and telling us about their experiences of making cakes a home. 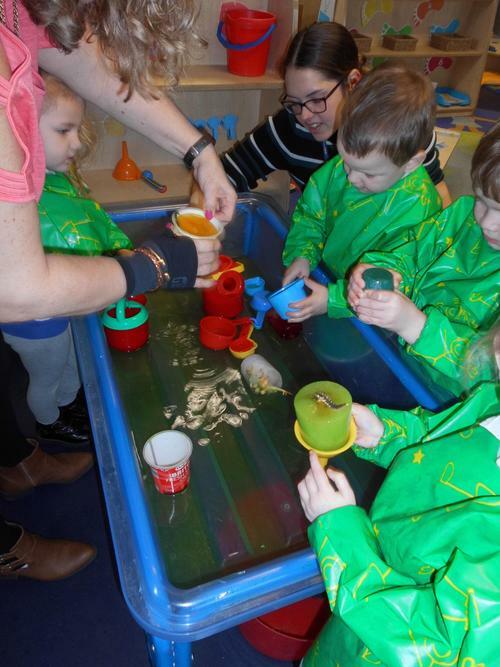 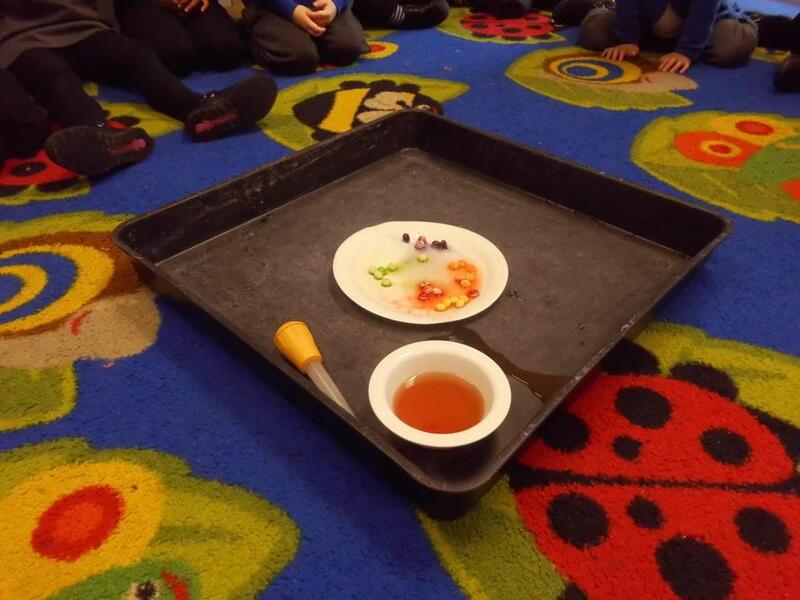 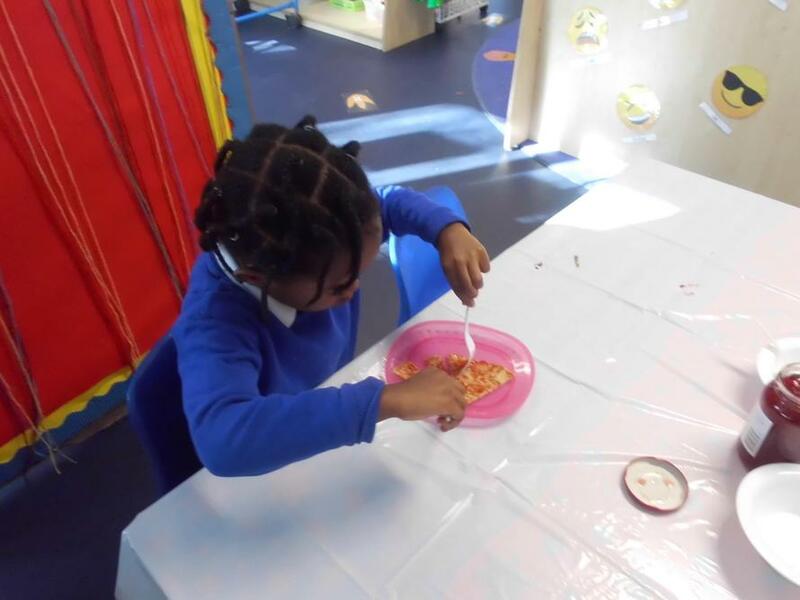 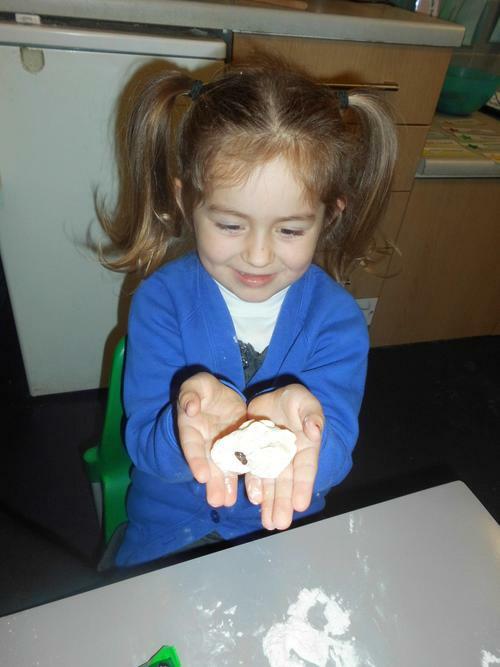 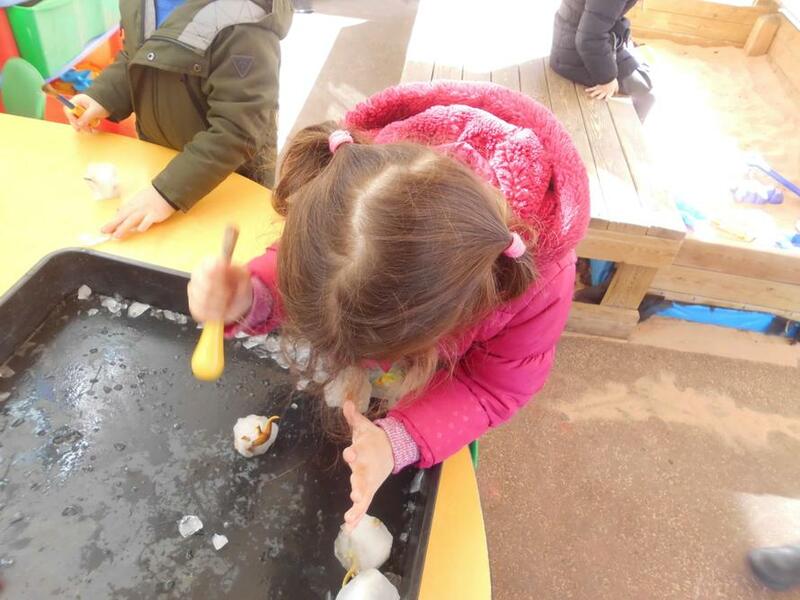 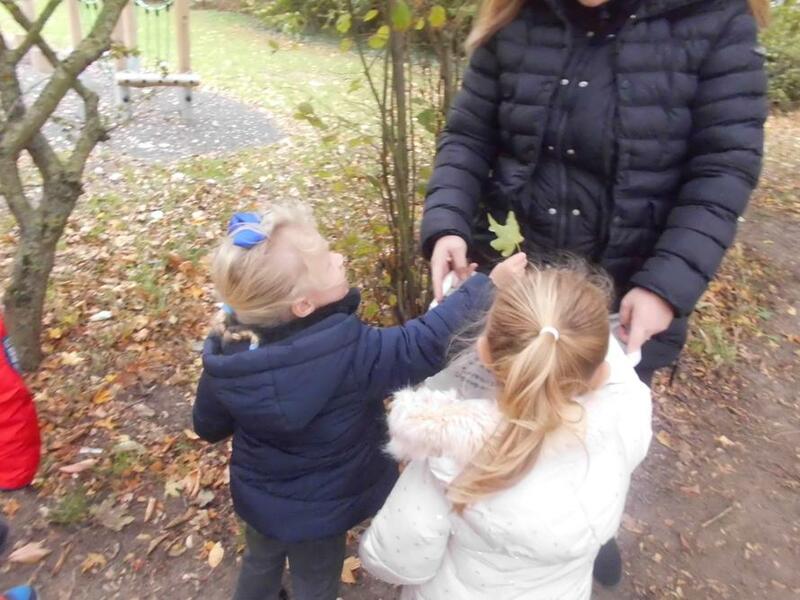 We then looked at melting and freezing, we had lots of dinosaurs trapped in frozen eggs and the children had to work out the best way to release the dinosaurs from the eggs. 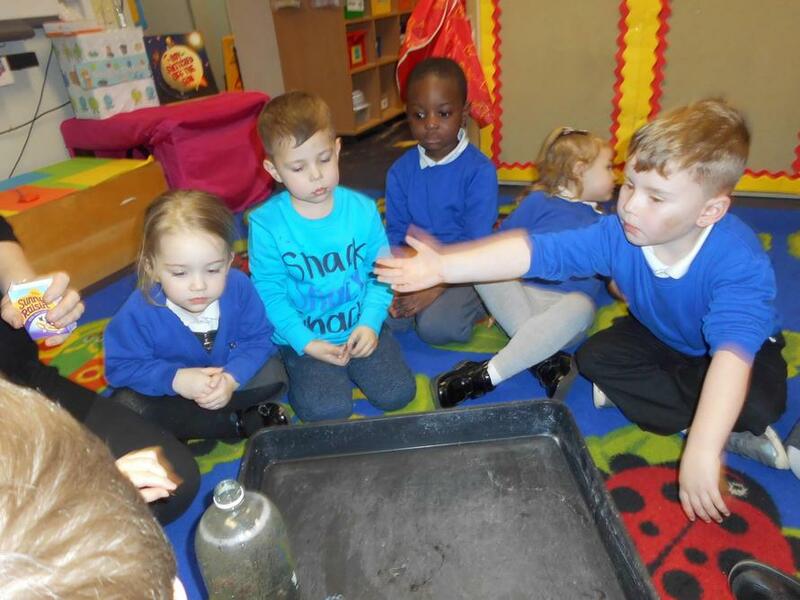 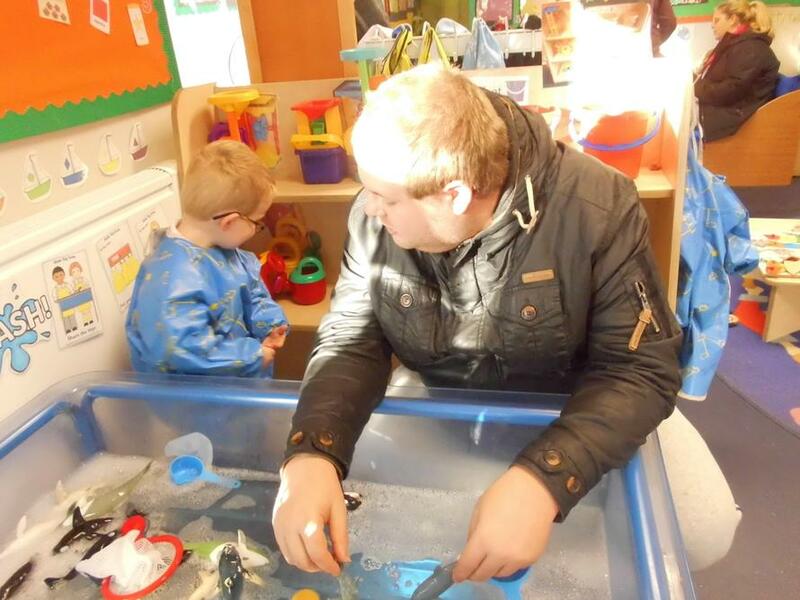 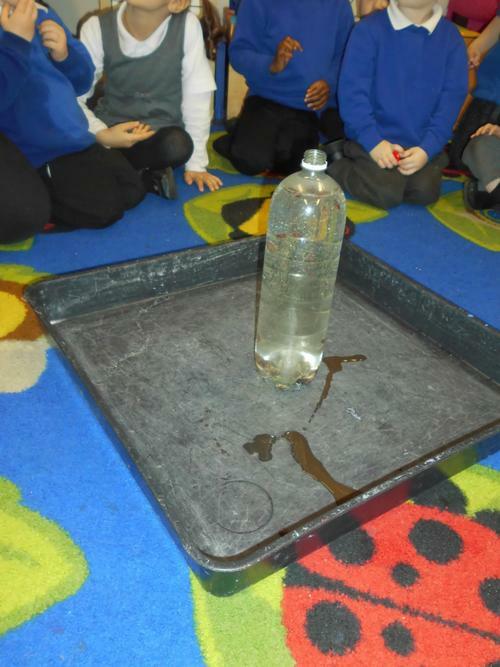 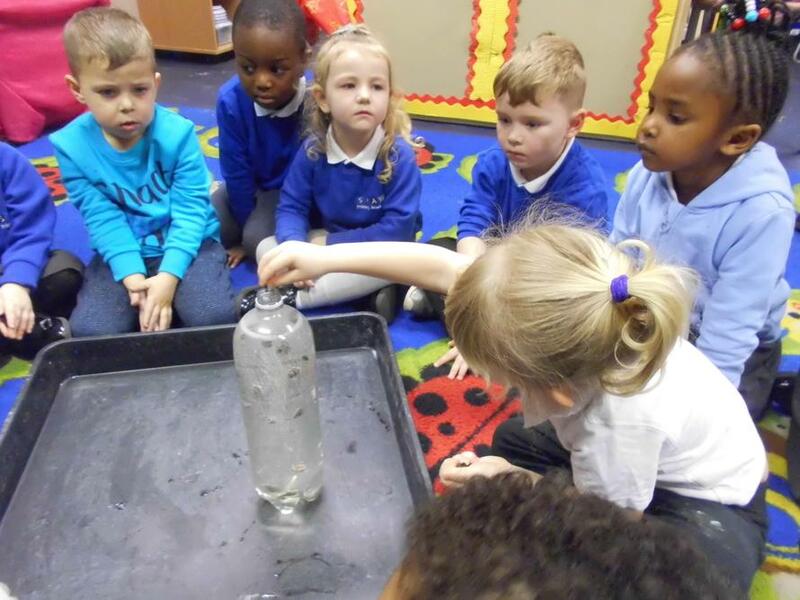 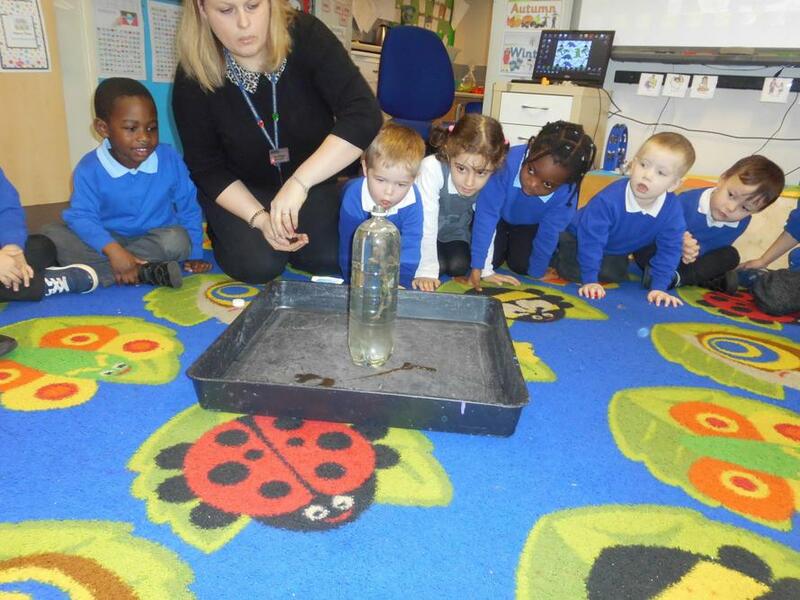 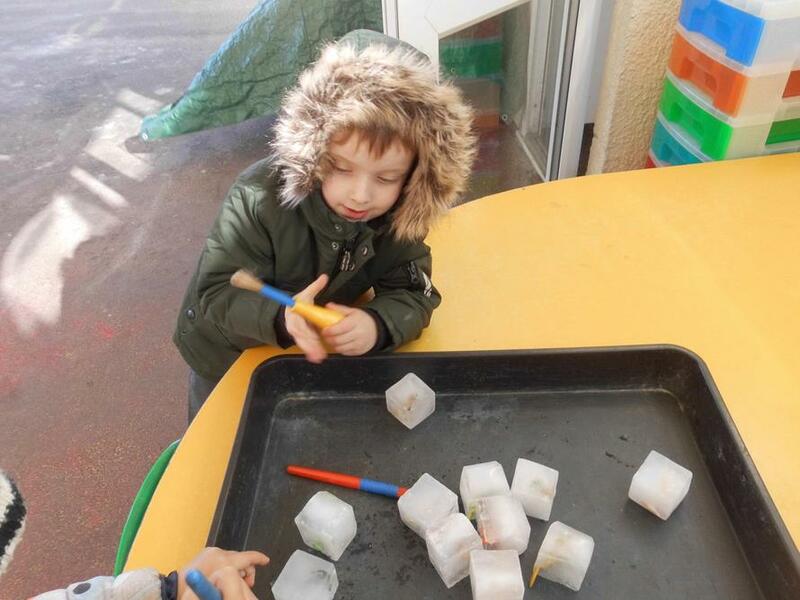 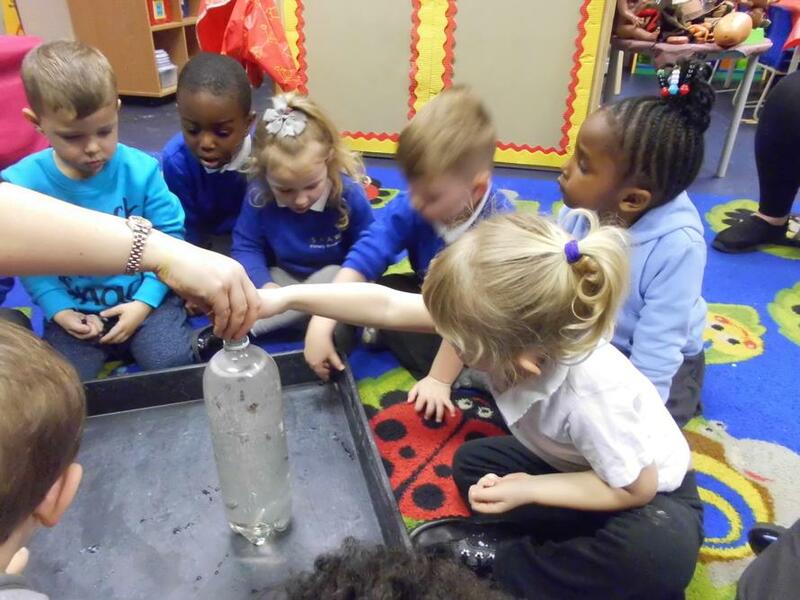 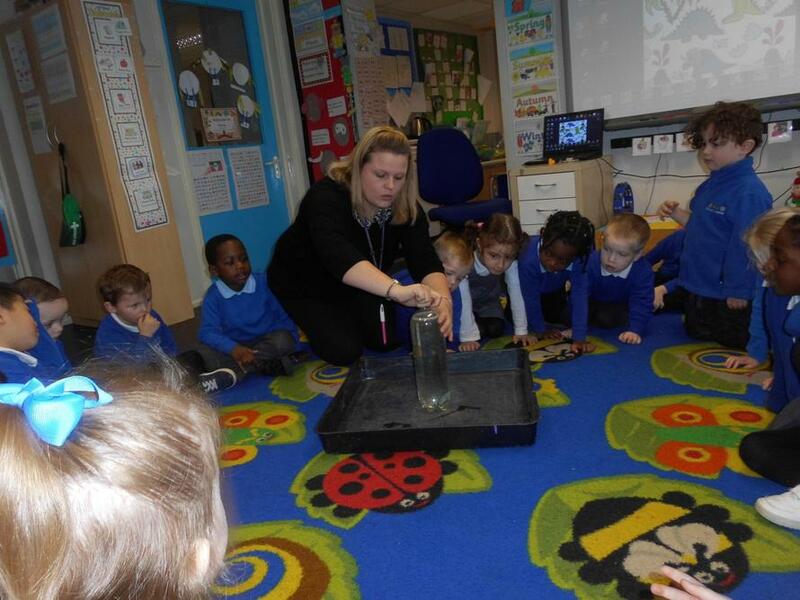 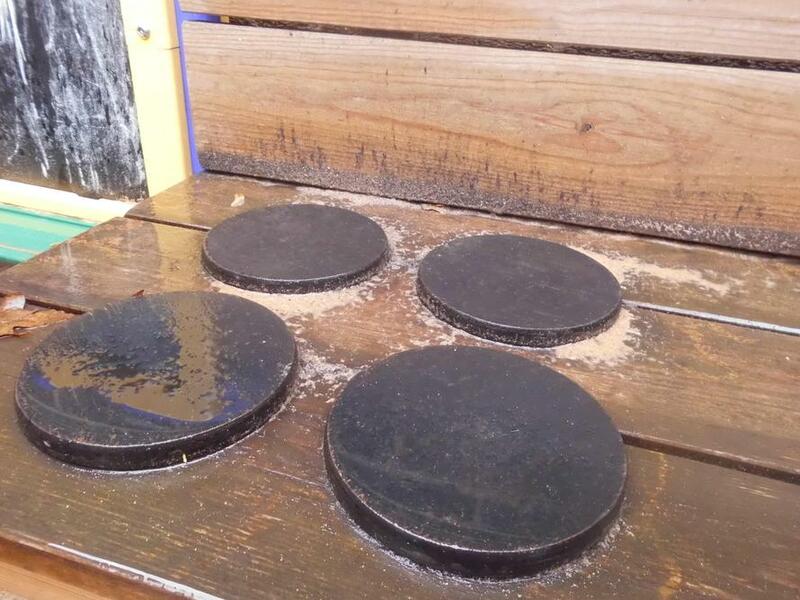 The children tried banging the ice, pouring water on the ice and holding the ice to melt it. 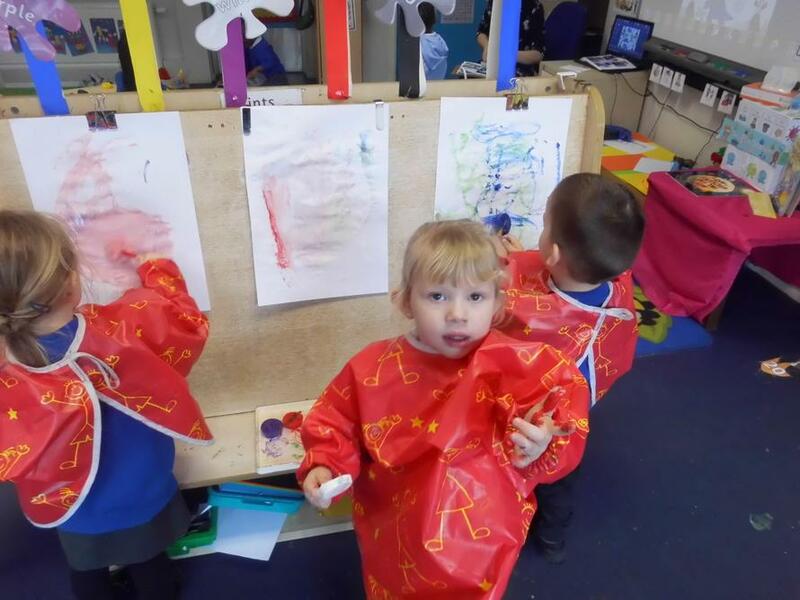 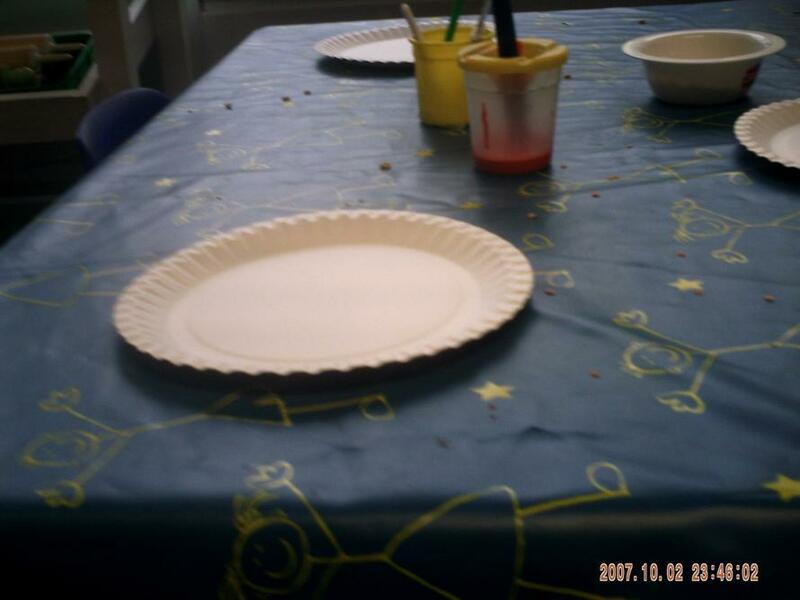 We also painted pictures with some ice paints, they started of had and icy and then became very soft, gooey and messy! 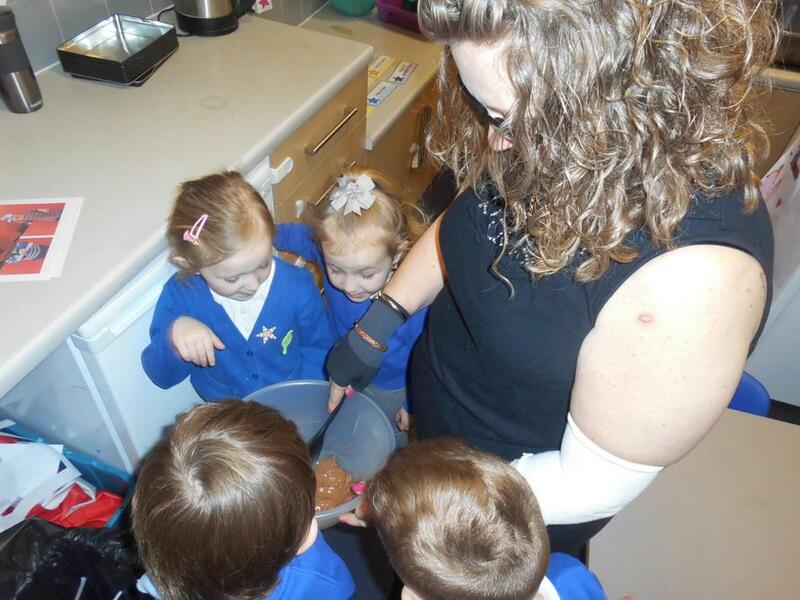 the children had lots of fun with them! 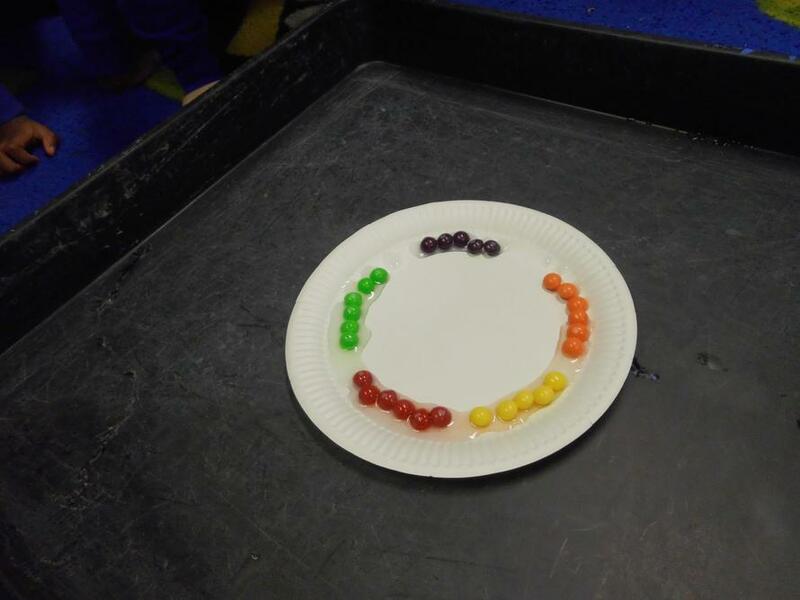 We made a rainbow with some Skittle sweets and water and we did the raisin and lemonade experiment. 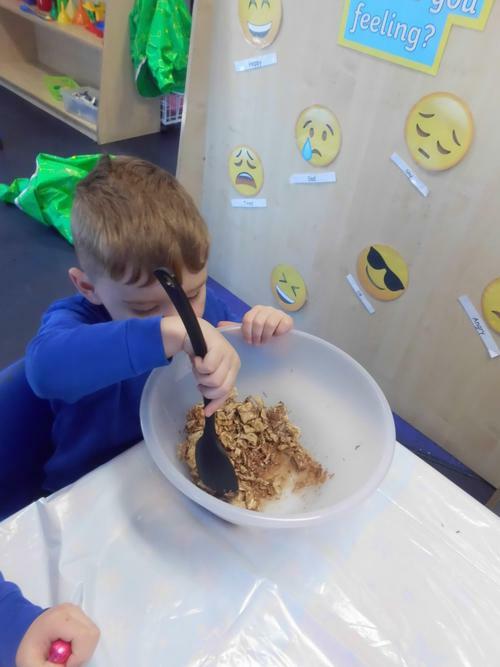 he children enjoyed watching what happened to the raisins as the went into the lemonade and had lots to say about what they could see! 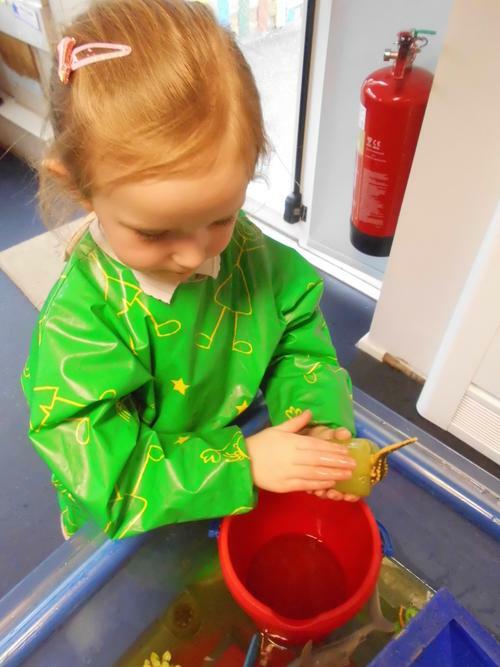 Some photos of our learning are below for you to see. 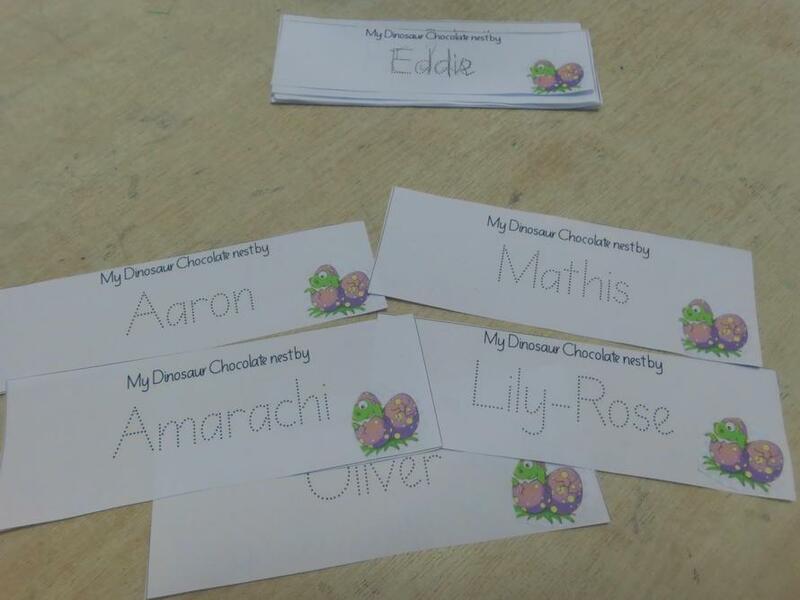 Melting the chocolate and writing our name labels for our Dinosaur nests! 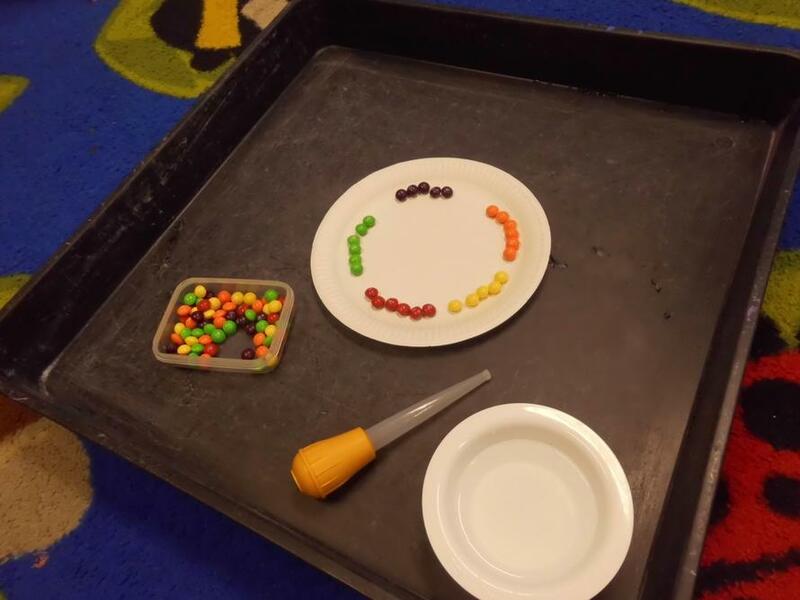 Skittles rainbow! 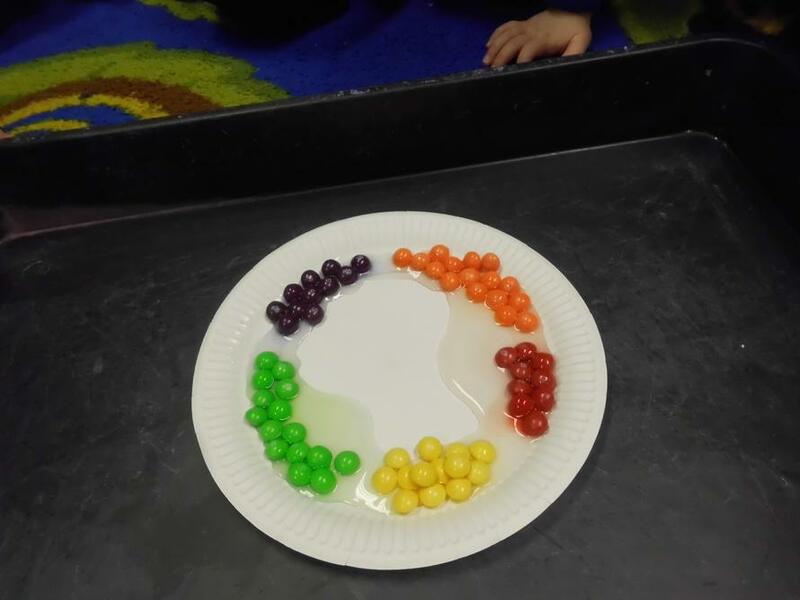 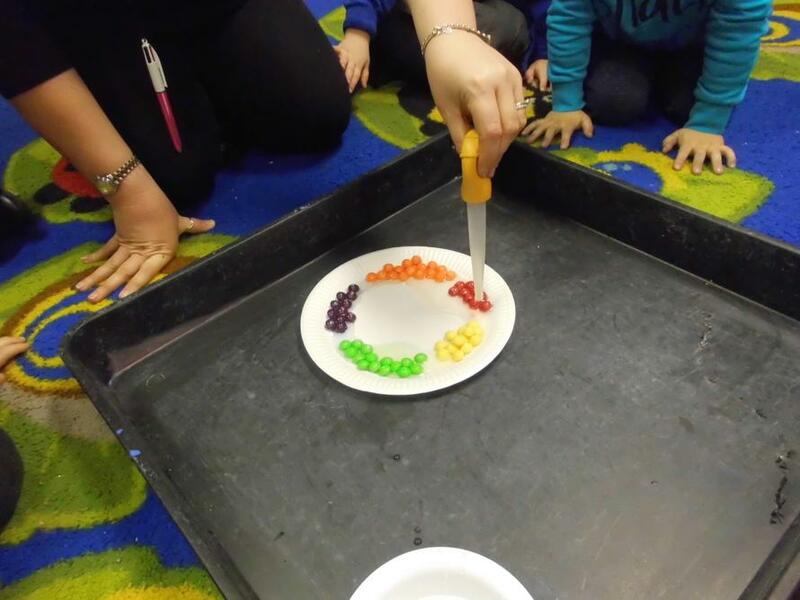 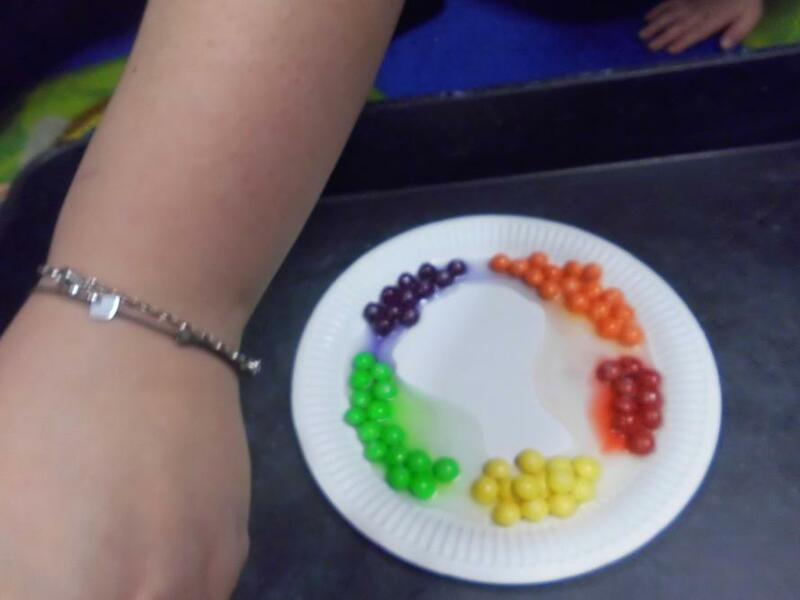 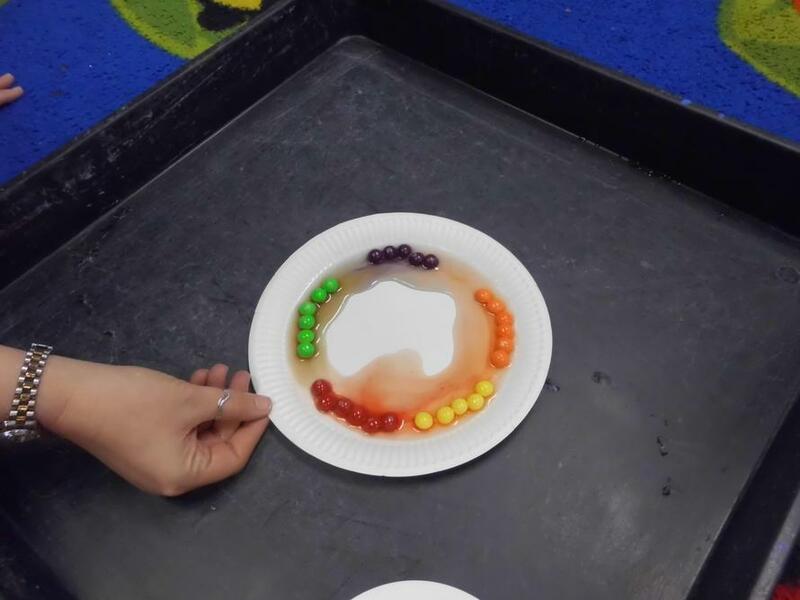 We made our skittle rainbow by adding water to the different coloured skittles aound the plate.